Today we surprised our colleague Julie Reid with a bouquet of flowers, a fantastic cake and a card full of congratulations. 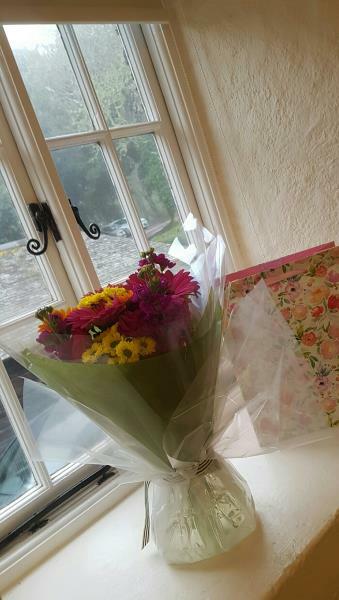 This month Julie celebrated working here at the practice for 20 years with the majority as Dispensary Manager. Julie started working for the NHS in 1979 in a chemist in Portsmouth. 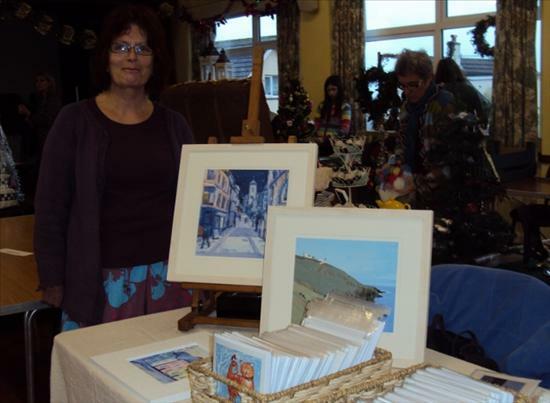 She then got married and moved to Chicester where she worked in the hospital pharmacy at St Richards, then a local chemist finally moving down to Cornwall in 1998 with her young family. 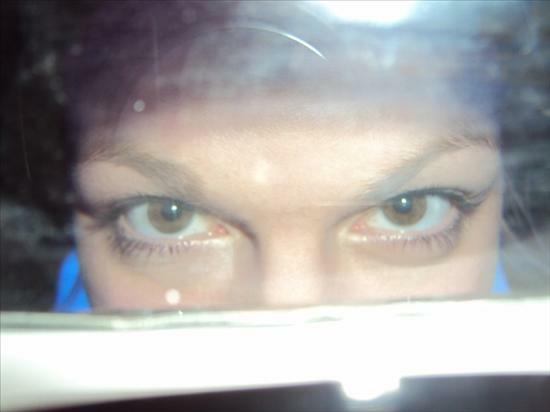 The following year Julie joined us as one of the only 3 dispensers, she became the Dispensary Manager soon thereafter and has been an integral part of our family ever since! 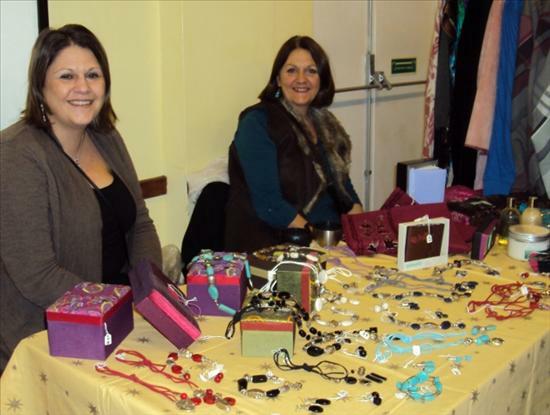 Congratulations and a big thank you to all the patients who came out and raised over £600 at our Coffee Morning & Unwanted Gift Sale which was held on 19 January. 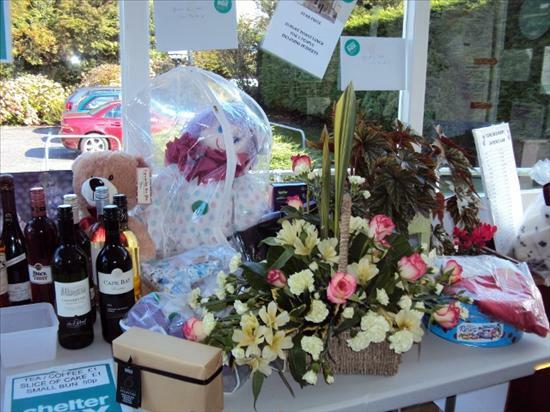 Thank you to the businesses that donated great raffle prizes and to all the staff and patients who gave us brilliant unwanted gifts to sell. Far too much cake - but who doesn't love a piece of cake! We were missing some of our amazing team but our Patient Participation Group stepped in and ran the kitchen with military precision! 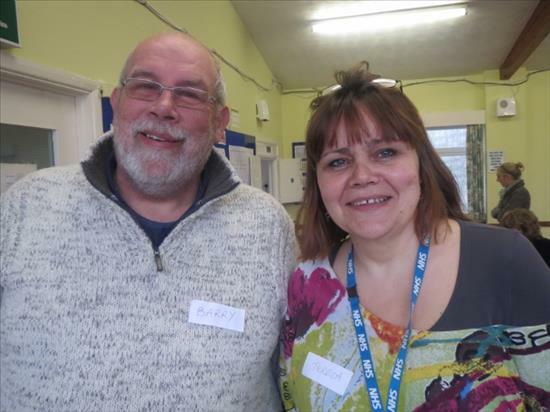 Geoff the Chairman became the Treasurer, Hilary was Chief Bottle Washer aided by Nigel and Alison whilst Trevor chatted to patients in the main hall. 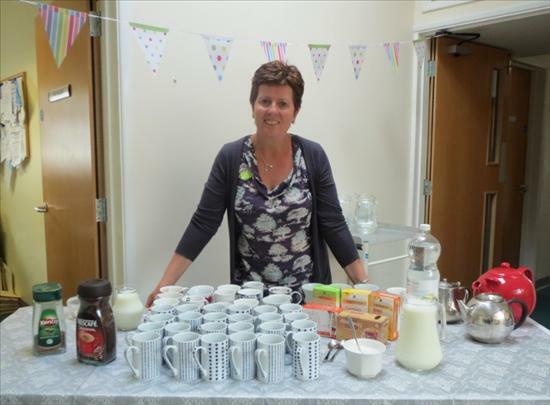 Thank you also to Mary Jory who was the Head Barista and made the constant request for teas and coffees look like a breeze. 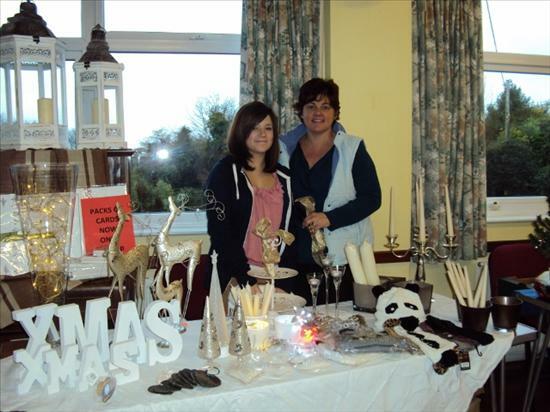 Thank you to all the staff and their families who gave up their time off to man the raffle table and the gift stalls. 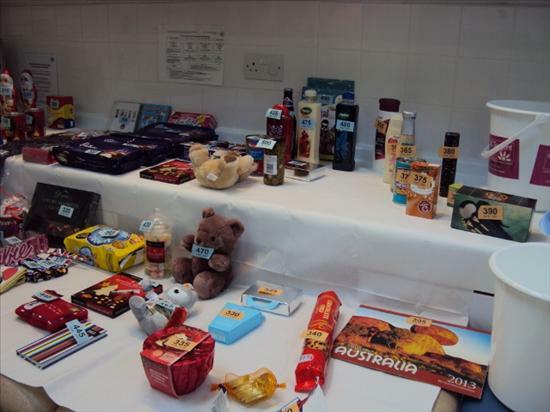 Thanks also to the businesses that donated great raffle prizes and to all the staff and patients who gave us brilliant unwanted gifts to sell. Far too much cake - but who doesn't love a piece of cake!! 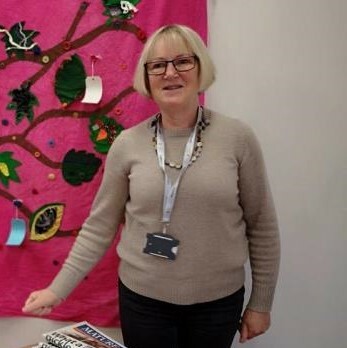 Feock's Parish Council have now appointed a Community Navigator, Sharon Nettleton who also came along with her 'Wishing Tree' – for more information on Sharon’s role please see the ‘Community Info’ page to the right. 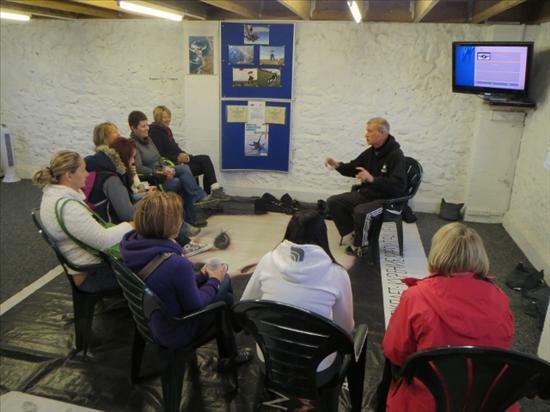 We were also delighted to have Hilary, Keith and Karen from the South and West Cornwall MS Group. For more information about the group contact them on the links below. 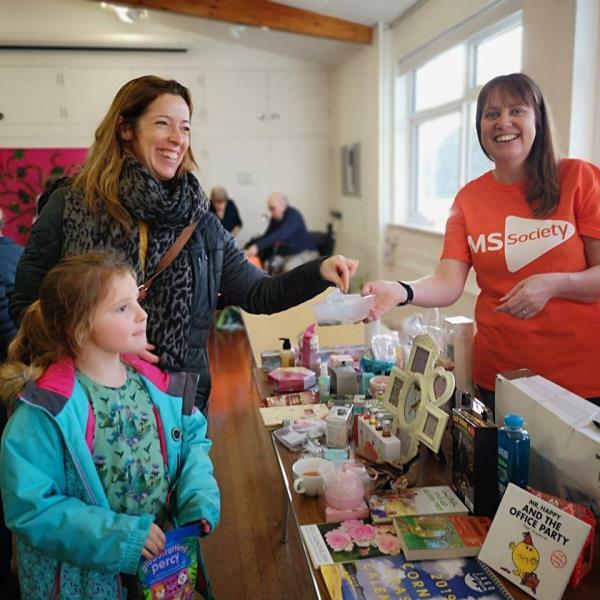 Any unwanted gifts that weren’t sold were donated to the MS Group for their next event whilst the unsold cakes and biscuits were donated to the Community Health & Wellbeing Hub who meet Wednesday afternoons in Perranwell Village Hall. 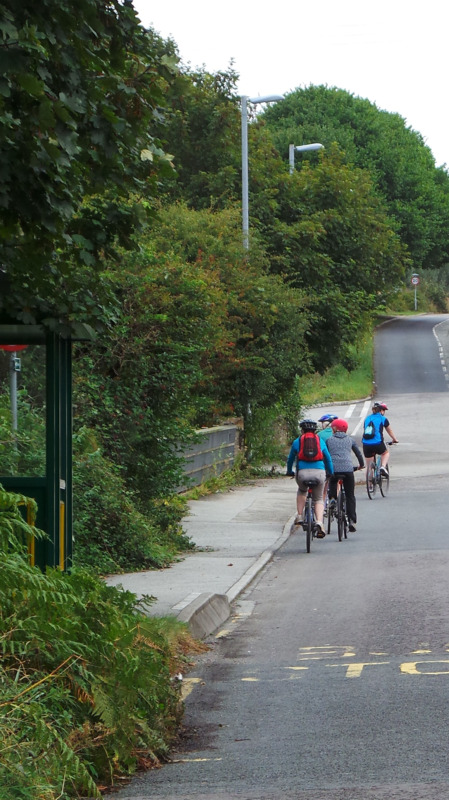 The final amount raised for the whole year will be announced very soon - so watch this space! Have a look at this brilliant film from Skyline showing how challenging this event was for all the riders. The weather was kind and it looked like Kathy and her daughter had a great time covering the 56 miles in 4 hours and 50 minutes. 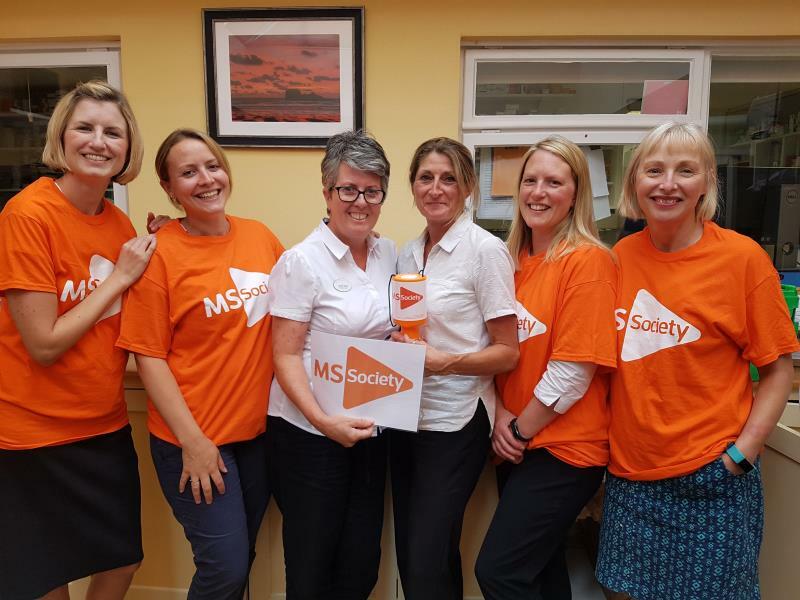 The total raised for the MS Society is now over £4200 and there is still plenty of time for you to donate. 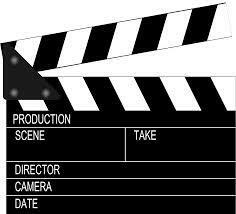 Click on the map to see the film footage. 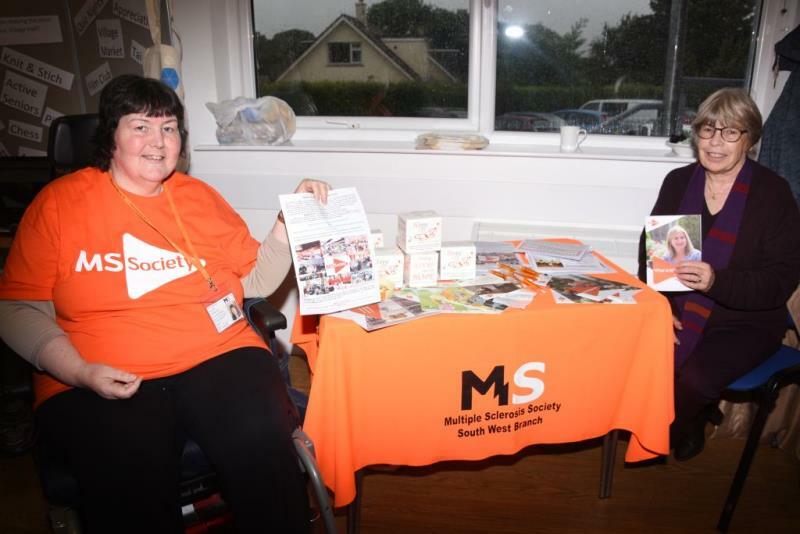 Saturday 22 September saw a packed Village Hall when the surgery team held their Harvest Fayre in aid of the MS Society. 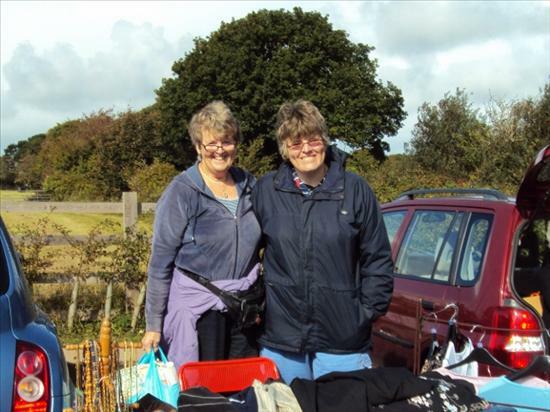 Kathy and her daughter had completed their London to Brighton cycle the weekend before and their total had already reached £2600 by the start of the fayre morning. 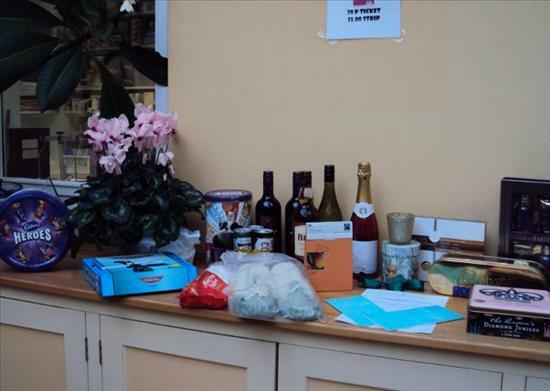 The main hall was packed with stalls including fresh fruit and vegetables, plants, local eggs, clothes, books, tombola, crafts, bric a brac and of course the Grand Prize Raffle. 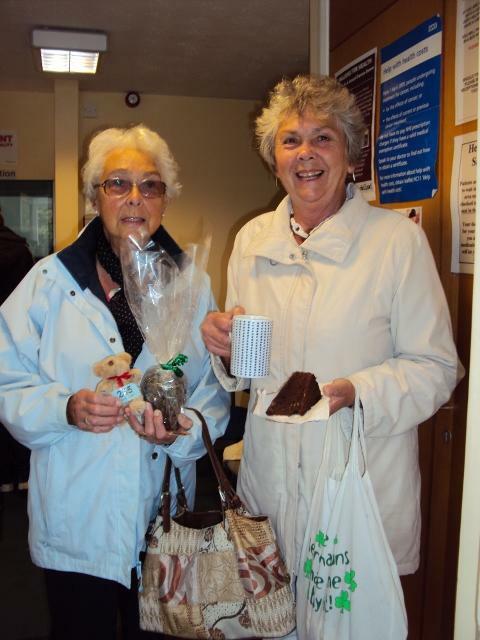 The weather was dreadful but our patients and our families arrived in their droves to buy produce, raffle tickets and they all enjoyed refreshments and cakes from the cafe. 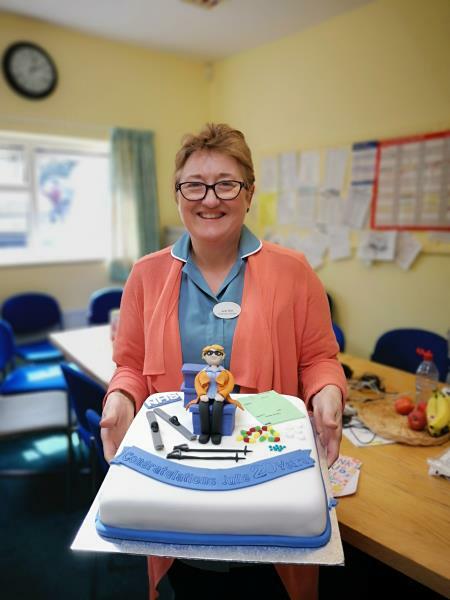 Andrea one of the reception team had made a fantastic cake for 'Guess the Weight' with one of our patients guessing the exact weight of 11lb 6oz - well done - spot on! We would like to thank all of you who baked cakes, donated prizes and attended on the day, this amount in such a short time is amazing. We still have more months of fund raising ahead of us and we hope to raise the total even further with your support. 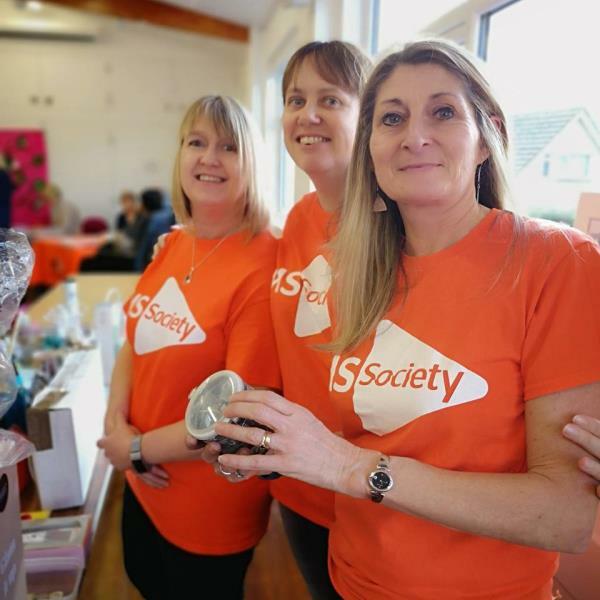 In particular the surgery would like to thank all the staff who gave up their personal time to help organise, co-ordinate, set up and man the stalls for what was an excellent morning of fund raising. 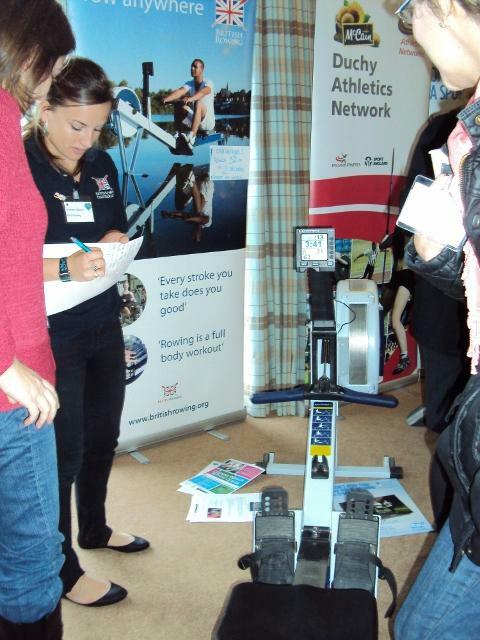 Thanks also goes to Mr Hobden who kindly came and took the lovely photos for us. 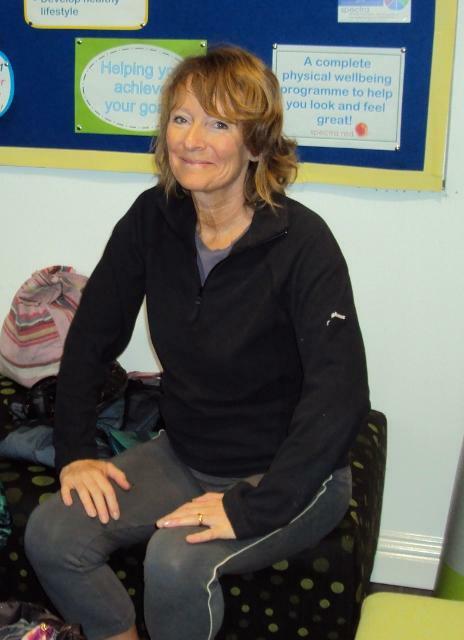 You all know Kathy our Assistant Practitioner as she has worked here at the surgery for many years and is local to the area. 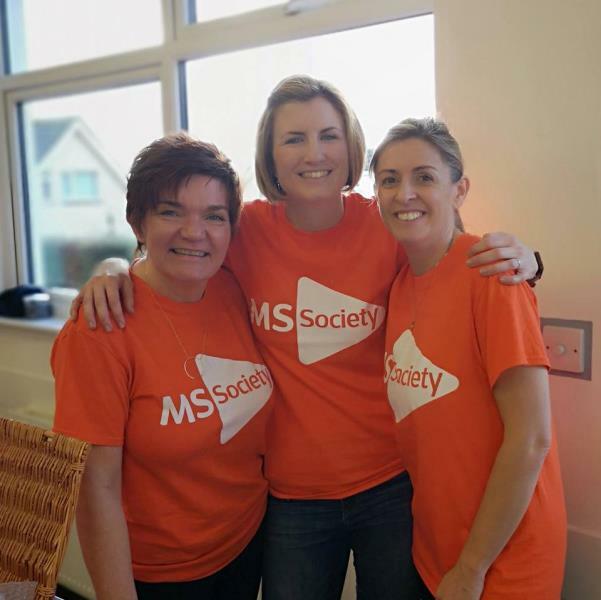 At the end of 2017 she found out that she had been diagnosed with MS, devastating news to herself, family and friends. 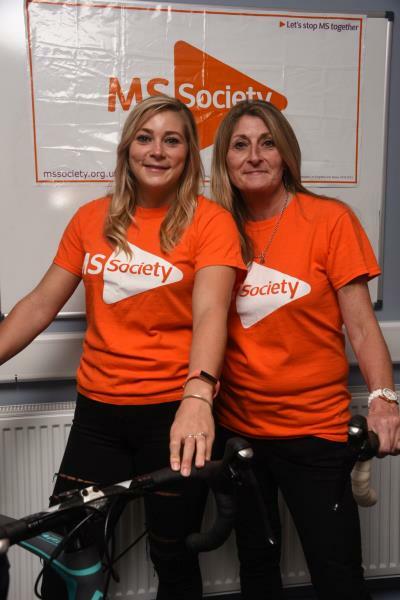 Within a week of her diagnosis Kathy decided that she was not to be beaten and signed up for this amazing challenge - to cycle 54 miles from London to Brighton in one day. 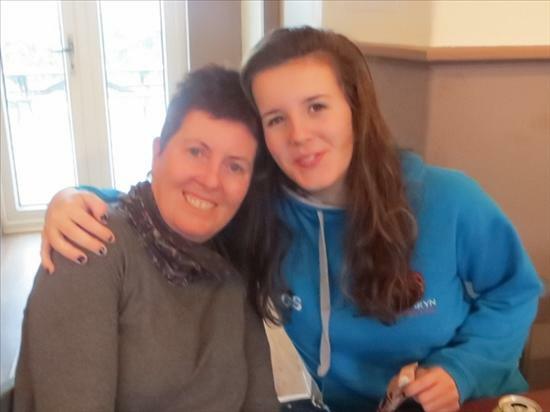 She will be joined by her daughter Kerry who has been a wonderful support in those early months of the diagnosis, and continues to support her. 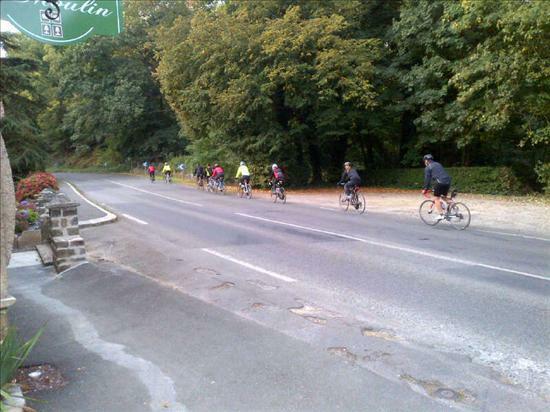 They have been out training most weekends cycling the roads and routes around Devoran, St Agnes and the surrounding villages. Keep an eye out for them! 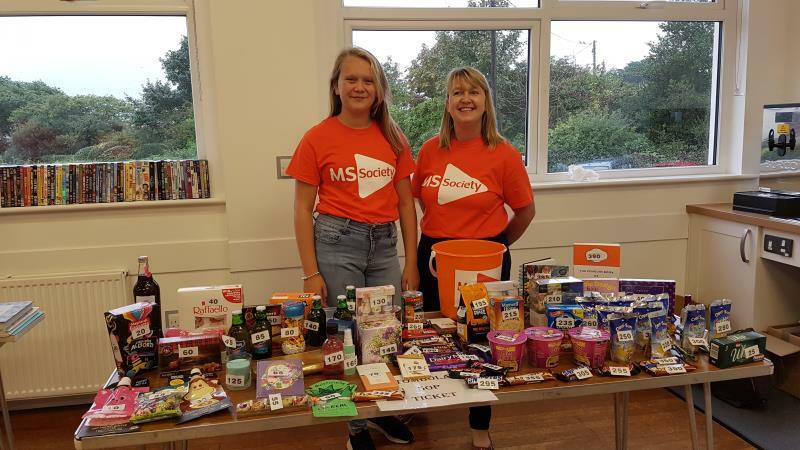 Kathy's diagnosis made the decision from all the staff so easy - we all wanted to support her to raise as much money as possible for the MS Society. It is Kathy's wish that all monies raised go towards the research arm of charity to help find a cure. Please go the the Just Giving link below if you wish to donate to this amazing cause. 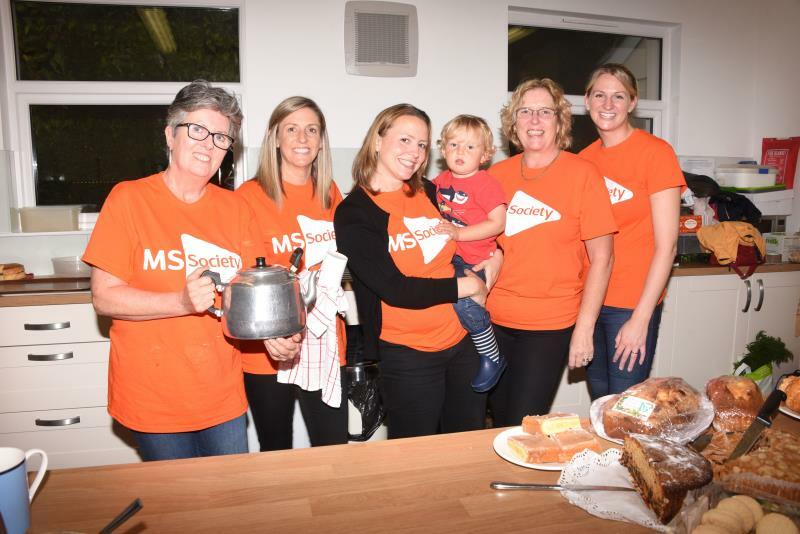 The MS Society was unaminously chosen by the staff as this years charity. Some of you may be aware that one of our team was recently diagnosed and we also have other staff who have had family members with the diagnosis so the decision was easy. Multiple sclerosis (MS) is a neurological condition, which means it affects your nerves. You get it when your immune system isn’t working properly. Your immune system normally protects you by fighting off infection, but in MS it attacks your nerves by mistake. These nerves control lots of different parts of your body. That’s why you can get MS symptoms in many parts of your body. It’s also why everyone’s MS is different. 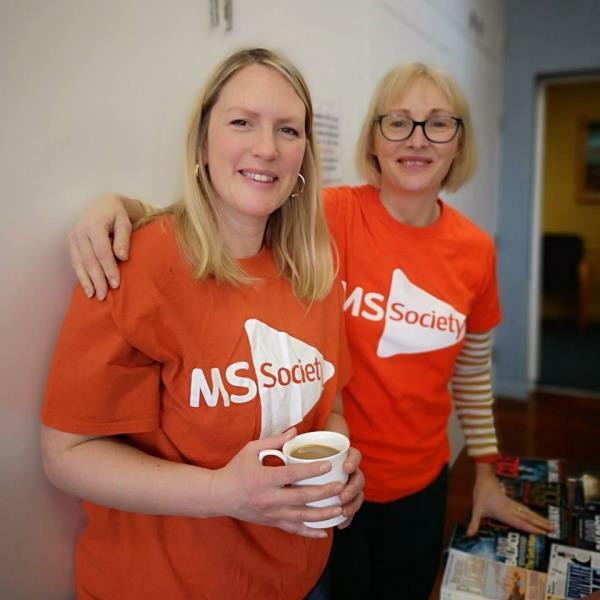 Once diagnosed, MS stays with you for life, but treatments and specialists can help you to manage the condition and its symptoms. 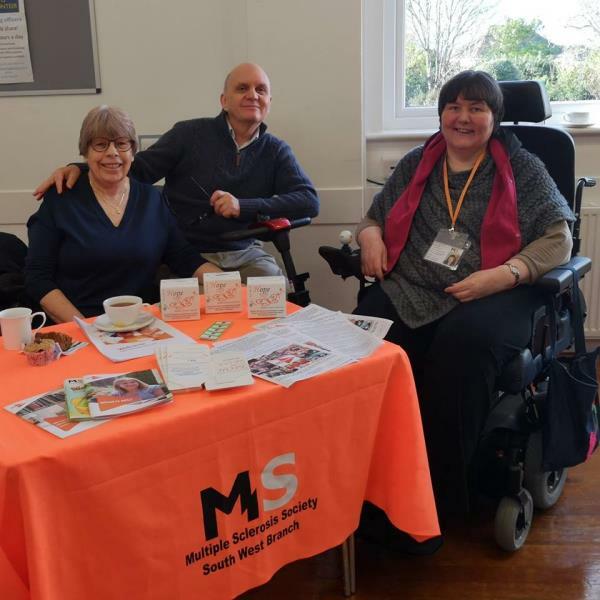 The MS Society is there to help patients live well with their MS and is funding lots of research to help stop or slow it down. We are starting our fund raising with a Harvest Fayre at Carnon Downs Village Hall on Saturday 22nd Sept from 10am until 12 noon. We will have some of the team offering health advice plus we will be selling fresh vegetables, books and cakes along with a tombola and a prize raffle. Resfreshments will be available and we hope that you will be able to come along and support our new charity. 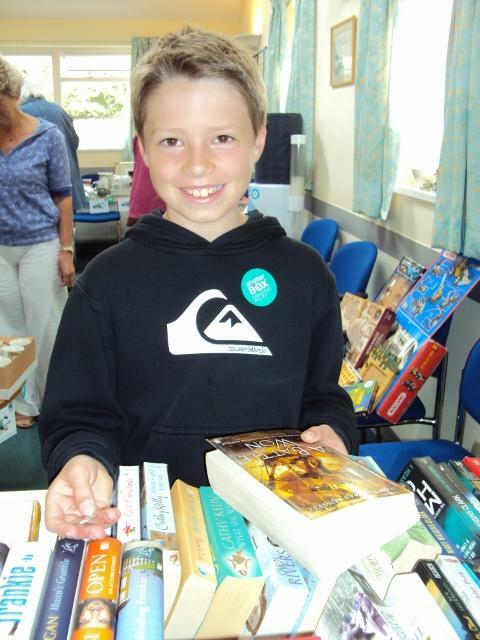 If you are a fantastic cake baker or can donate quality unused gifts or books we would appreciate it greatly. 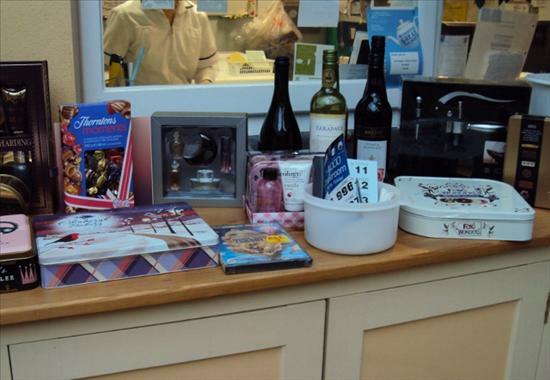 Do you know a local business who could donate something for the prize raffle? We hope to see you all there and help us kick start our campaign. Wellness Café off to a flying start! 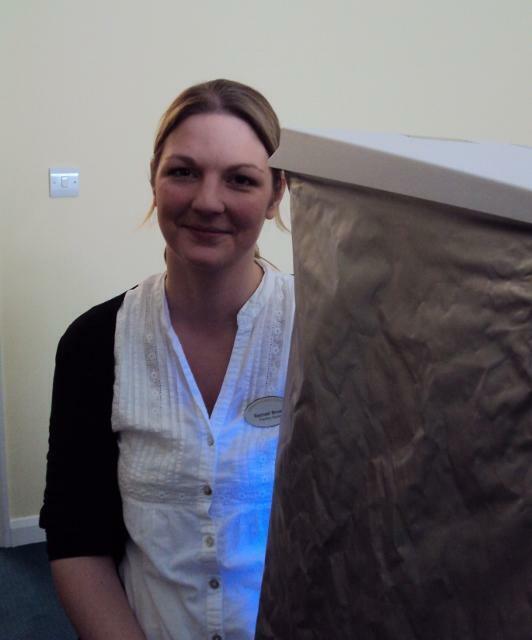 Tammy Etherington our Community Matron had an idea to help the more isolated or vulnerable people in our community to connect with each other in a way to promote good health and wellness to enable them to remain at home. 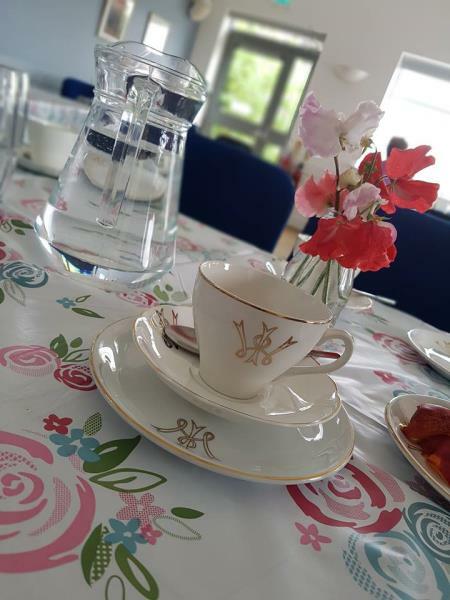 So the Wellness Café took shape and with the help and support of organisations including Feock Parish Connect, Active Plus, Carnon Downs Village Hall, Chacewater & Carnon Downs Community Nursing Team and the staff here at the surgery they have gathered together an amazing group of volunteers. 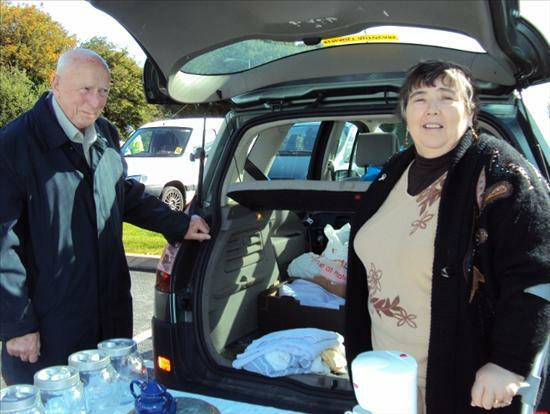 The volunteer team comprises of drivers to help with transport for those that cannot get to the hall, nurses, cake bakers, sandwich makers, tea pourers, washer uppers, musicians and general helpers all willing to make this project successful. 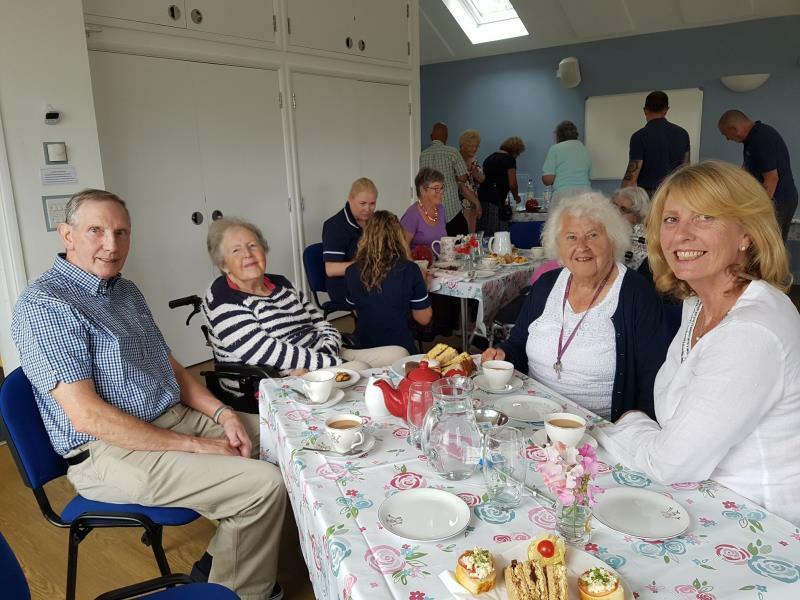 The afternoon will involve health promotion education, occupational health information, health assessments and medical interventions all accompanied by a cup of tea and maybe some cake plus and of course a friendly chat with the volunteers. 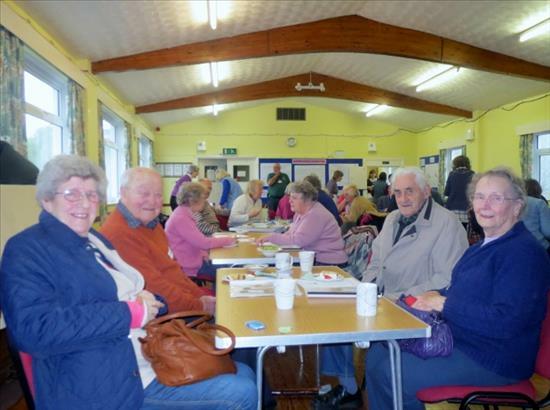 The Wellness Café is held every Wednesday afternoon between 2.30pm and 4.30pm at Carnon Downs Village Hall and if you know someone who could benefit from attending please give Sue a call on 07817 303112. Sue can give you all the information about the afternoon and help arrange transport or any special needs that you may have. 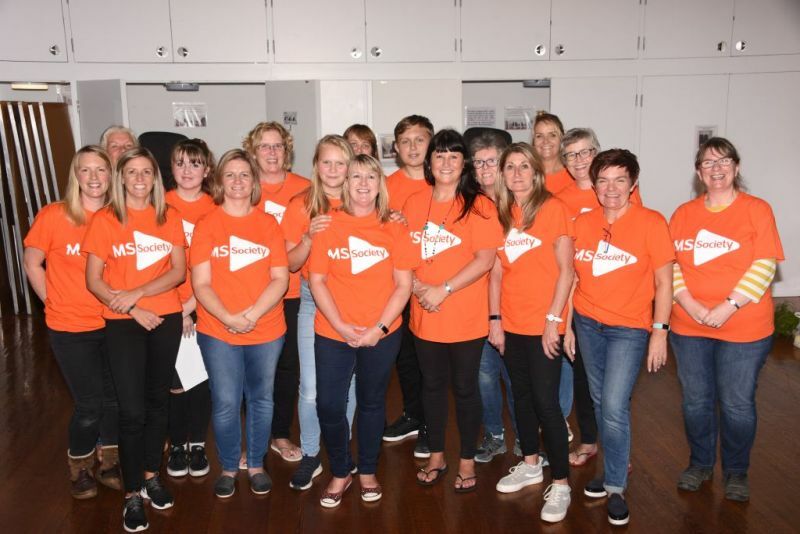 Likewise if you think you would like to become one of the volunteers and help connect our health and wellness community please contact Alison or Kay at the surgery. 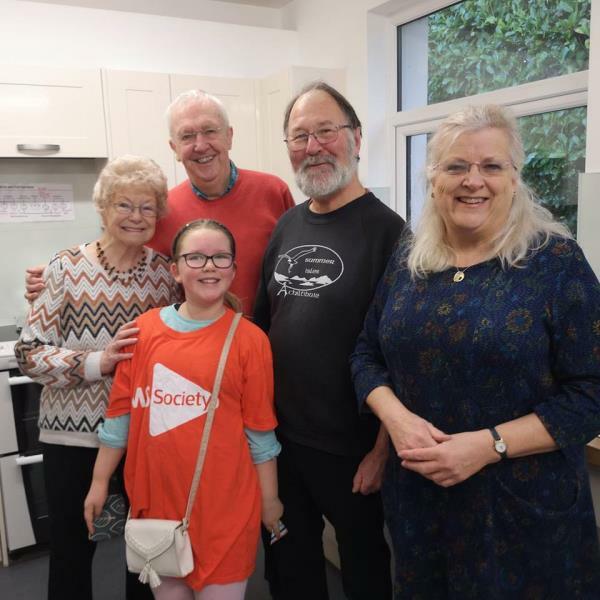 The surgery would like to thank Tammy, all the organisations involved and especially the volunteers for their sterling efforts on getting this project up and running – a great initiative here in our village for our local people – long may it continue! 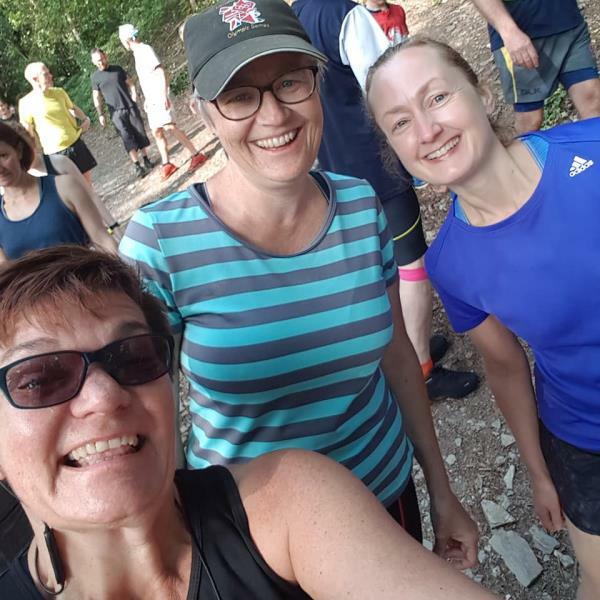 Saturday 9 June saw Alison and Jo, plus many other colleagues from the NHS, join in with the Parkrun at Trelissick Garden. This year the NHS celebrates it's 70th birthday and there are events all over the country being organised throughout the year to say thankyou and to celebrate everything that is good about the work going on in the NHS today. The sun shone on Alison's first attempt and luckily Jo had given her hints and tips to not panic when she saw the field and more importantly save something in the tank for the last hill! 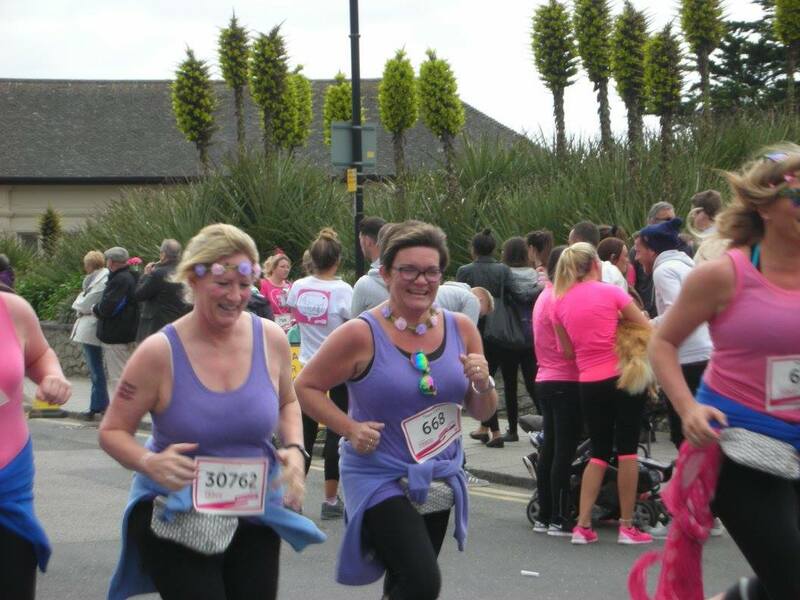 Alison completed the 5k run in 37:55 minutes and came 8th in her age category, Jo and her friend Linda were ahead and finished in 36 minutes. 183 runners took part here at Trelissick but it was expected that 85000 staff overall were attending all over the UK in their local parks. Lots of runners donned fancy dress and the pre race speech by Dr Carolyn Campbell was extremely inspiring. Dr Campbell not only has many years NHS experience under her belt but she has also discovered the joy of running, in no small part due to initiatives like parkrun. 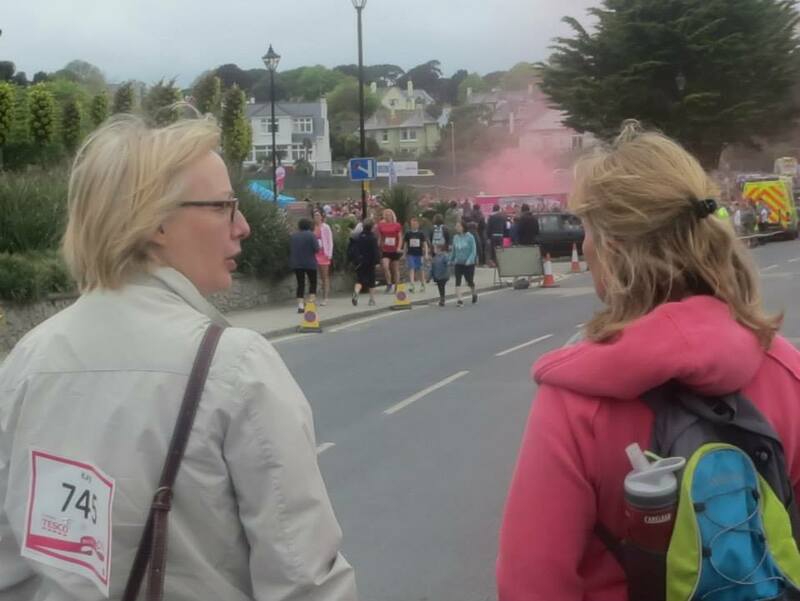 Her brief speech was inspiring and thought provoking and the Trelissick team were delighted that she agreed to join the run and to start the runners as well as running the course herself. 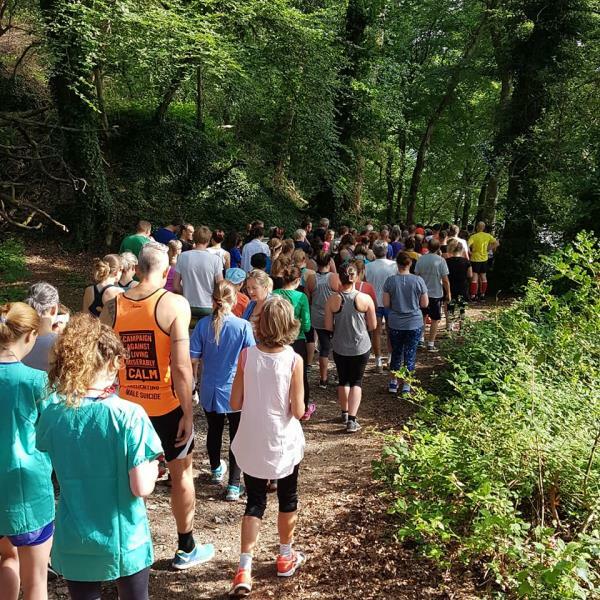 Parkrun organise free, weekly, 5km timed runs around the world. 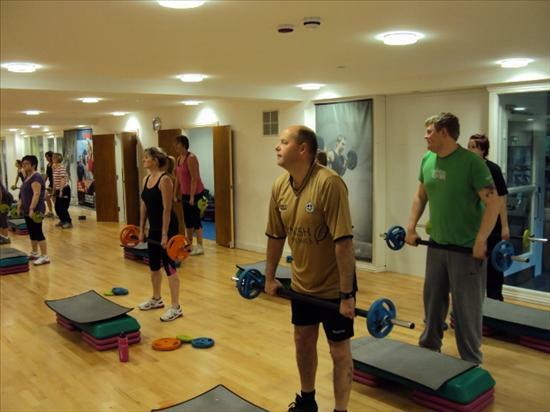 They are open to everyone, free and are safe and easy to take part in. They take place in pleasant parkland surroundings and they encourage every ability to take part whether you are a novice or an Olympian. 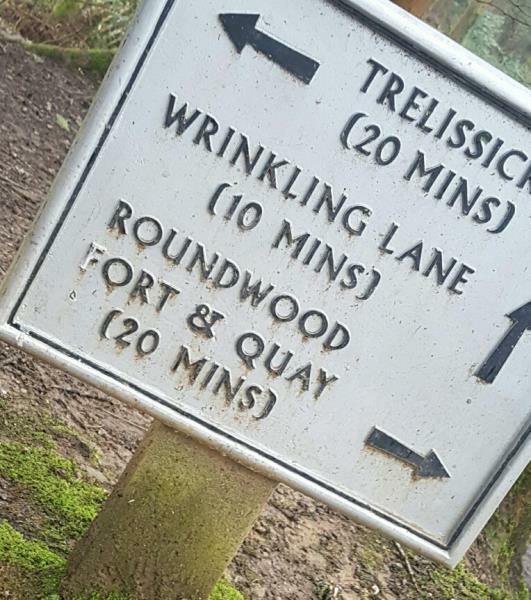 The run takes place at 9am every Saturday at Trelissick, Heartlands, Eden and Penrose. 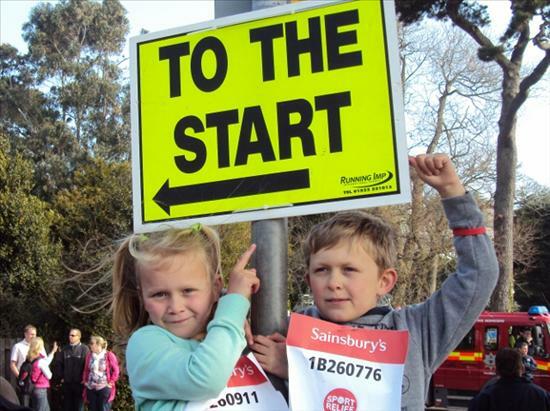 For more information click the link below - why not give it a go - walk, jog or run - just get out there and enjoy the great atmosphere. 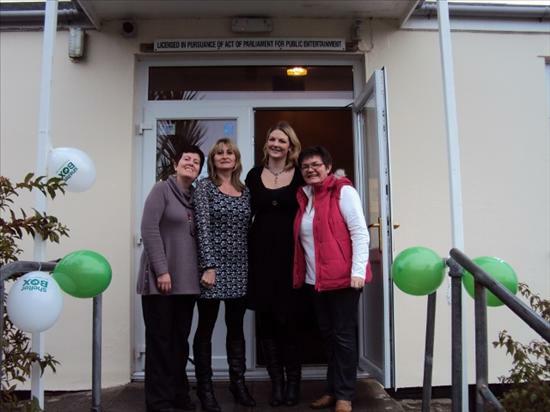 Katie Spencer Deputy Dispensary Manager from Chacewater Surgery on the left looking great in her nurses outfit. Alison our Asst.PM, Jo Lawrence our Clinical Pharmacist and her ex-colleague and Pharmacy Technician Linda Derry from RCH. 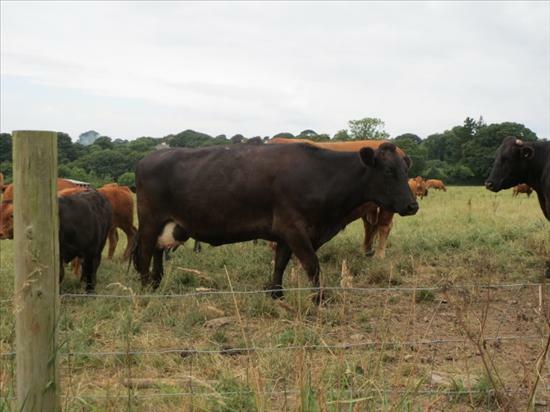 Going Wild in the West Country! 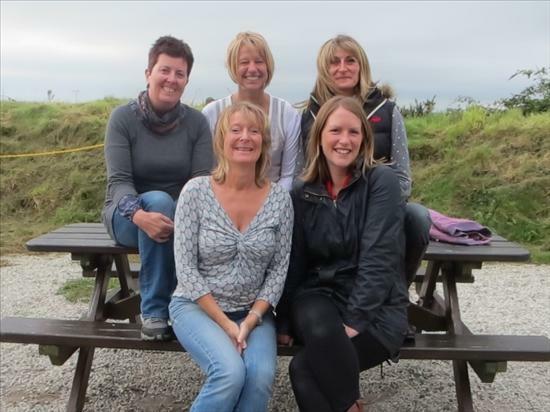 While many of us were relaxing over the Whitsun Bank Holiday our Secretarial Team Nicola, Chloe, Sophie, Sarah our Lead Nurse and Michelle our Deputy Dispensary Manager were running wild in St Buryan. 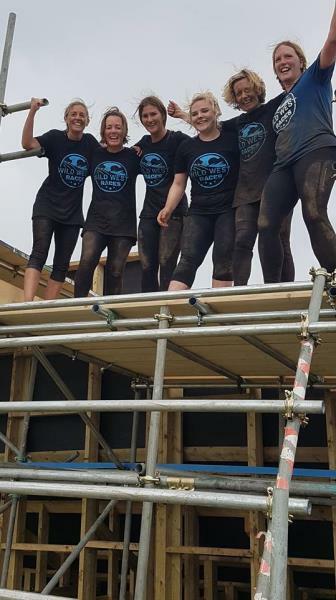 The girls set themselves a challenge to complete a 6 km course with over 80 man made and natural obstacles set in 1200 acres of wild Cornish terrain. 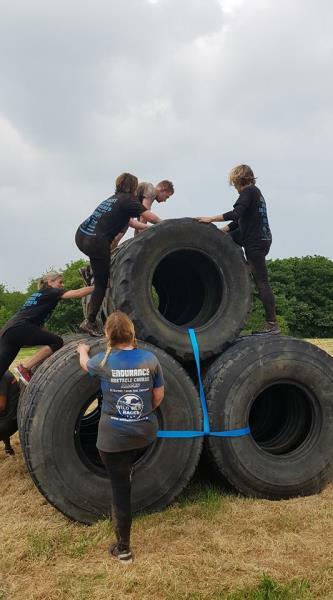 With a dedicated fitness team and ex-military personnel the course is designed to push you both mentally and physically - but still have lots of fun. 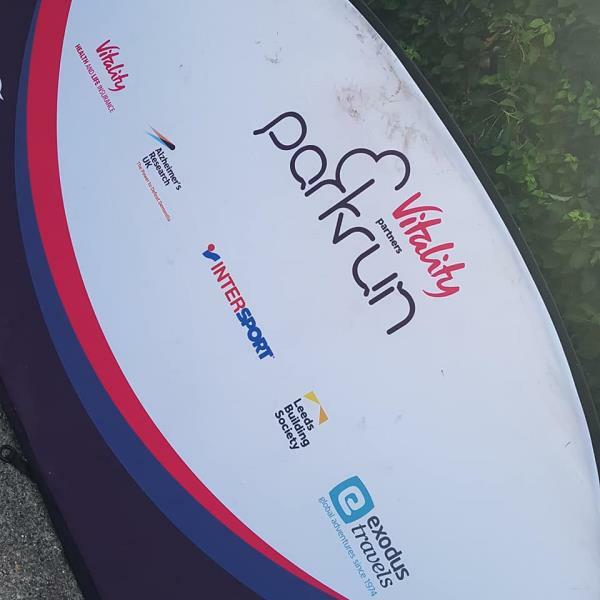 The girls thoroughly enjoyed themselves and finished the course in under 3 hours - we believe they actually did more than 6km due to a signposting error. 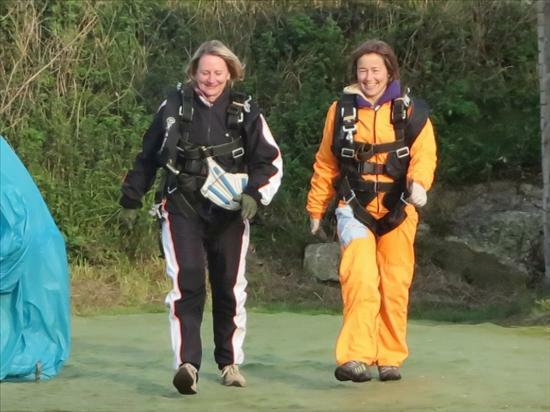 Friends of Michelle and Nicola also joined the team so next year we hope that more of their colleagues will take the plunge and give it a try. Well done team! 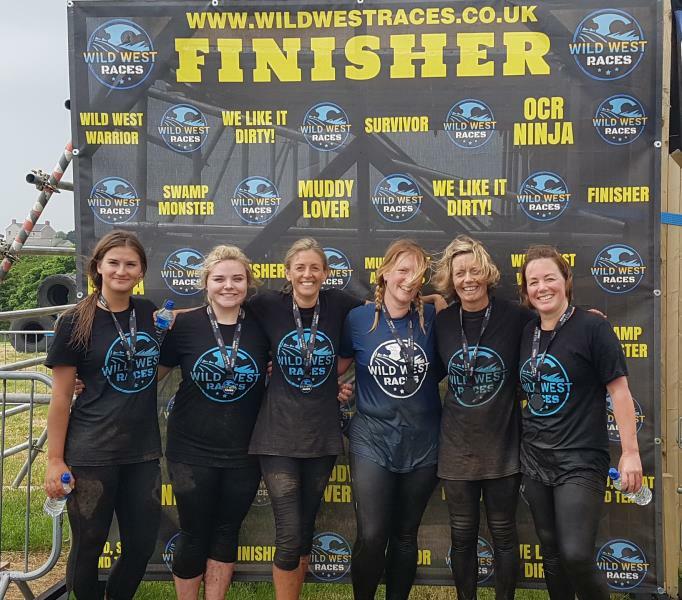 For more info about Wild West Races click on the logo below. 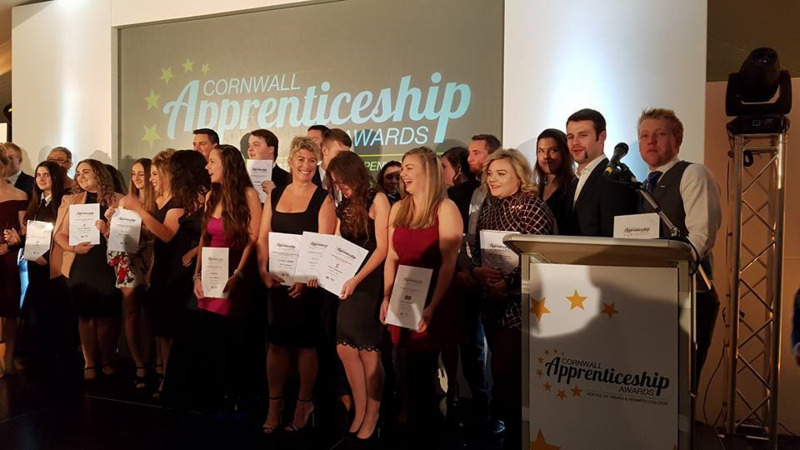 We are very pleased to announce that Sophie Poulton our Reception and Administration Apprentice was one of the excited nominees at the Cornwall Apprenticeship Awards 2017, which were held at Truro College on Friday 17 November. 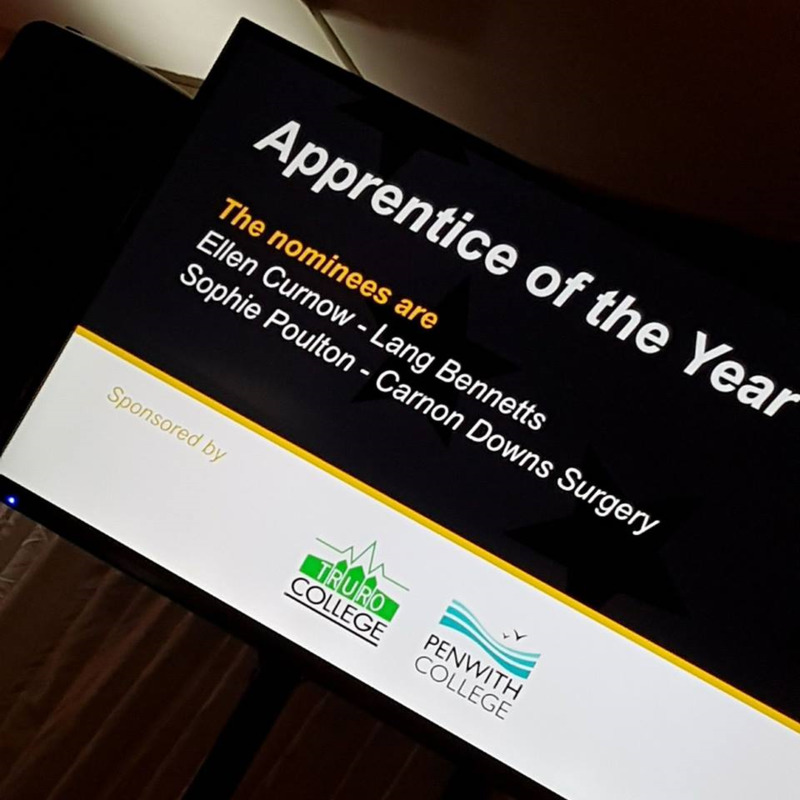 The Government has committed to achieve its target of 3 million Apprentices in England by 2020 and the awards were held to showcase the talent and energy of Apprentices who are contributing to the current future strength of our local companies. 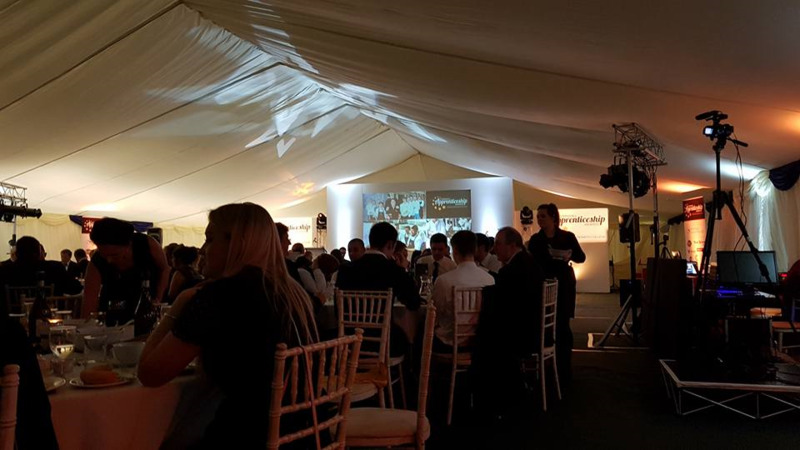 The black tie event was hosted by Neil Caddy and Holly Day from Pirate FM and was attended by over 200 people including sponsors, judges, 45 nominees and lots of nervous employers, family and friends. 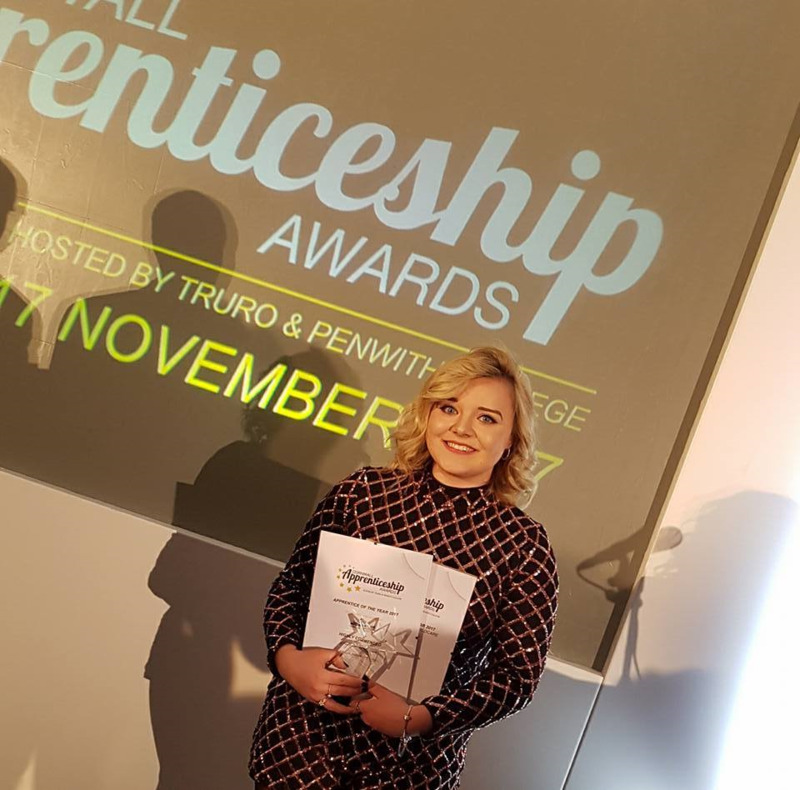 Sophie had been nominated for her self motivation, keenness to expand her knowledge and learn new skills and for the way she has developed in the last few months by taking on new roles and responsibilities. 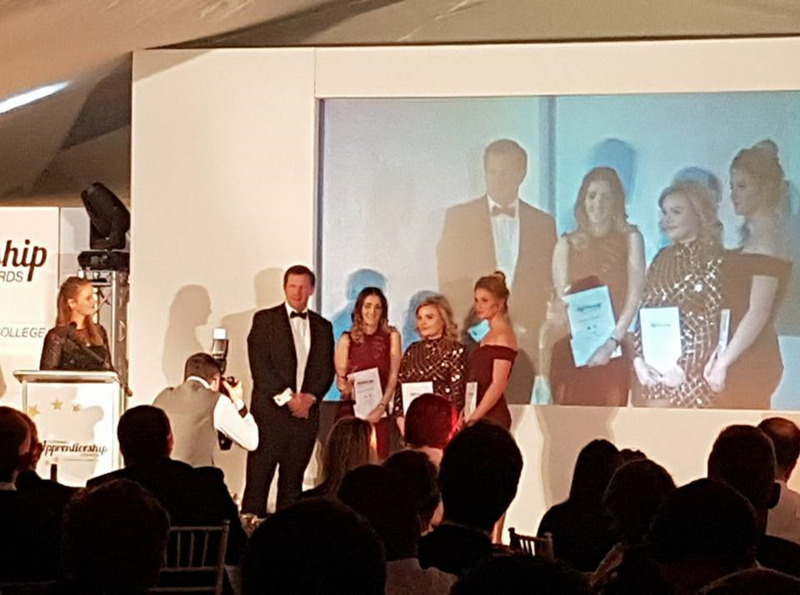 So it is with great pride we can tell you that she won the Health & Social Care & Childcare Category plus on the evening the judges had placed Sophie in the final three for Apprentice of The Year 2017. We have had two Apprentices here at the surgery. 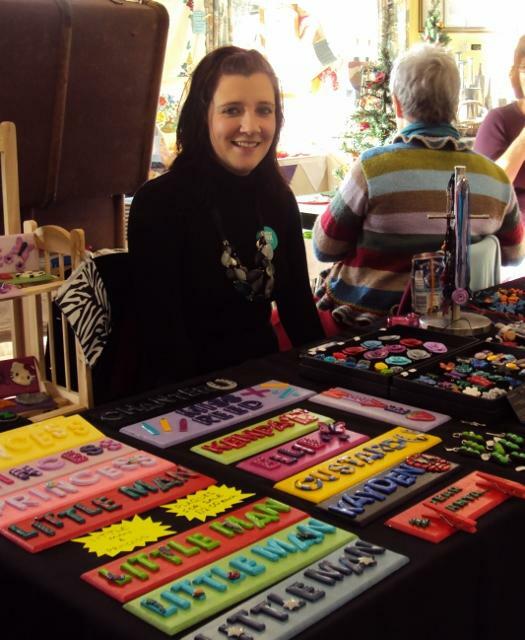 Chloe is now a qualified Medical Secretary came to us via Truro College and has been with us for a number of years. 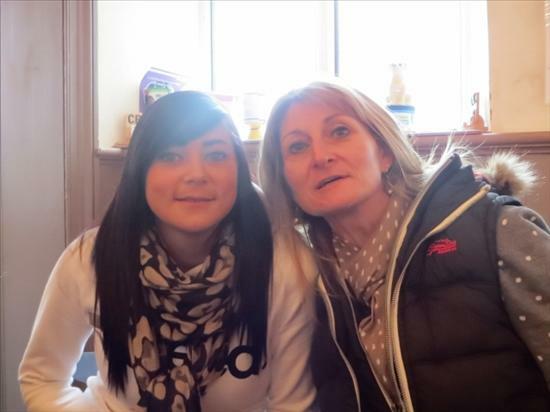 Whilst Sophie is working for her NVQ qualification with Dynamo Healthcare. Congratulations Sophie - all the staff are so very proud of your achievement - keep up the good work! 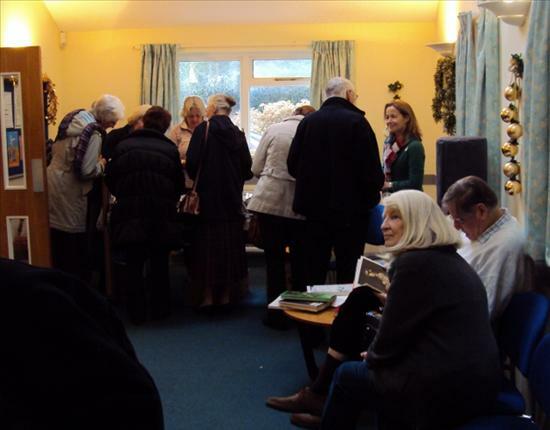 HELPING THE VILLAGE HALL GET THE VOTE! 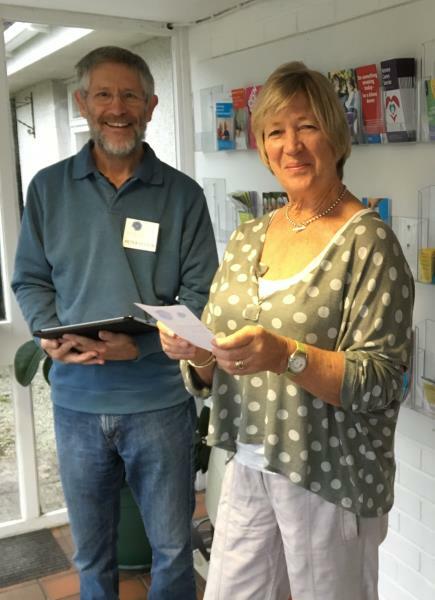 Saturday 14 October saw Sue and Peter Felton from the Carnon Downs Village Hall join us here at the surgery for our flu clinic. They have reached the final stage of Marks & Spencer Energy Fund Competition and spent the morning chatting with patients and canvassing for their vote. The M&S Energy Fund grant will give them a unique opportunity to purchase a battery store system to enable them to store the renewable energy they produce during the day from our Photo Voltaic Panels and use it in the Village Hall when the sun is not shining. They hope to engage a local Cornish Company to supply the battery system to help support and promote our local economy. 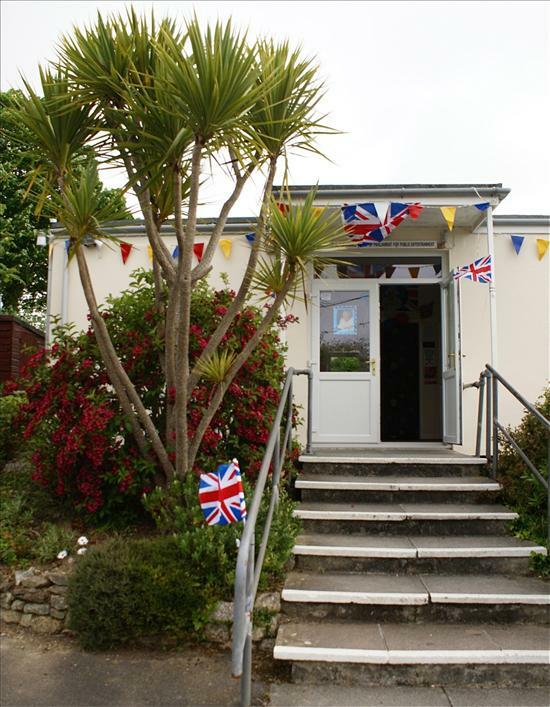 We wish the committee at the village hall all the luck and if you would like to vote please click on the link below. This summer we were very pleased to donate a sum of £1586.50 to the Carrick Mind charity who were our chosen charity for 2016/17. Carrick Mind provide advice and support to empower anyone experiencing a mental health problem. They campaign to improve services, raise awareness and promote understanding. 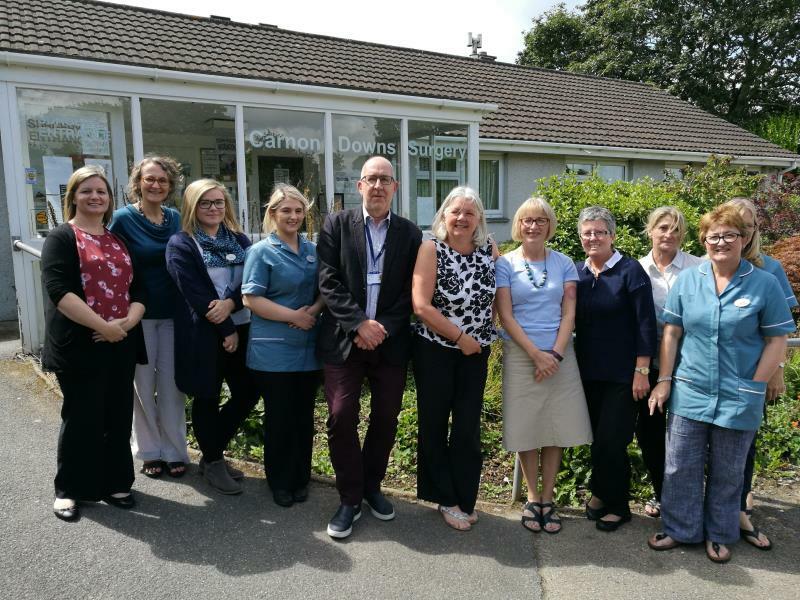 Jon Gladstone visited the surgery and gave a talk to the team about where the money will be spent and the projects it will help fund, all of which are here in our local area of Truro and Falmouth. Many thanks to all of the staff, their families and of course our patients who helped raise this money for a great charity. There will be a new Practice Manager at the Surgery from August. Sally Rickard, who has worked with the practice team in various roles for more than 19 years, will be leaving to pursue other interests. 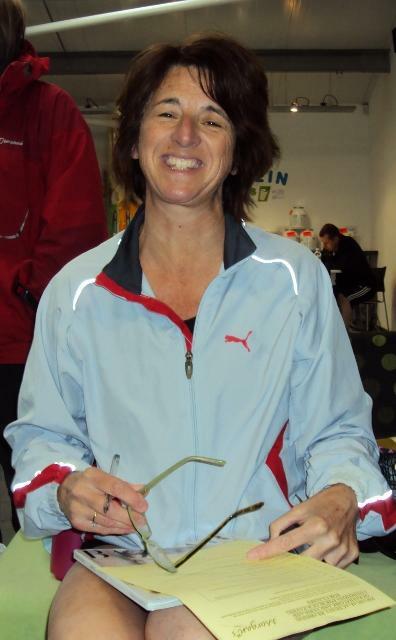 Sally was Assistant Practice Manager from 2002 to 2010 and has been Practice Manager for seven years. 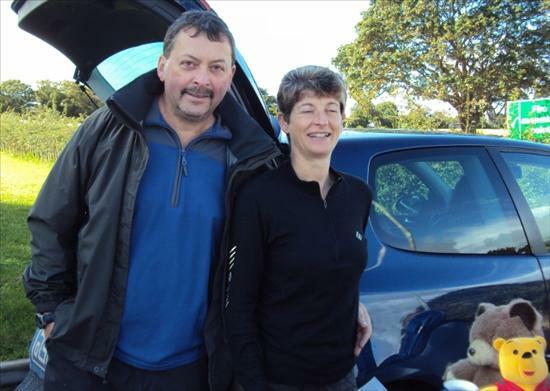 Sally has seen many changes at the practice including the recent retirements of Drs Maling and ffrench-Constant, several building projects and a steadily growing population with increasingly complex health needs. 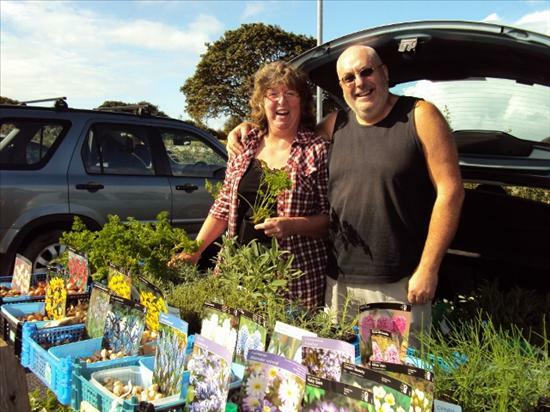 Sally is keen to pursue her interest in all things fruit and veg, sowing the seeds, tending the plants and seeing them flourish and become the best they can be. Very much like her leadership, she has always looked after the staff with patience, professionalism and fairness, guiding us through difficult and ever changing times. She will be greatly missed by all of us here at the practice which was evident today on her last day when many of the retired ladies and doctors came to bid her farewell. Geoff Aver of the PPG wanted to find a special plant to thank her for all the sterling work she has done with them over the years - he was fruitless but we found one - a beautiful rose called 'Simply Sally'! 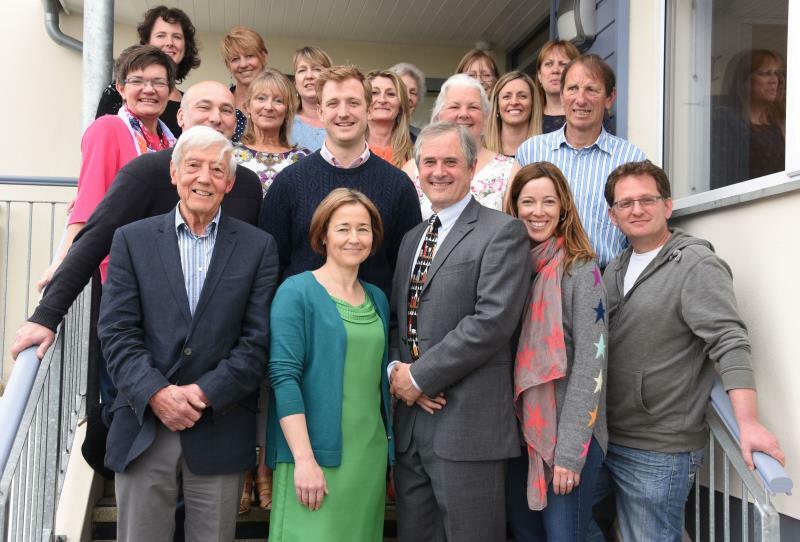 Pictured above are some of our current staff alongside the ladies who Sally started with 20 years ago, Dr Maling and Dr Stevens. 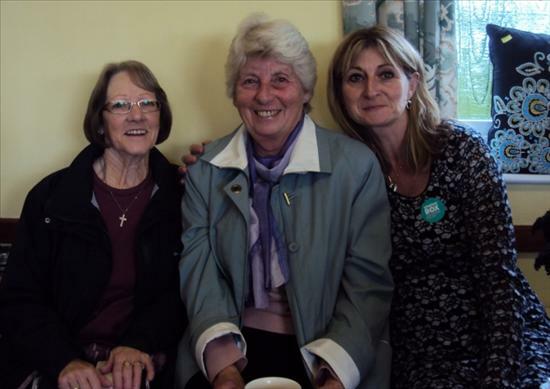 A lovely gathering where we presented Sally with a shiny new spade and a cheque to spend as she wishes. CELEBRATIONS, COFFEE, CAKE & CAR PARK CHAOS! 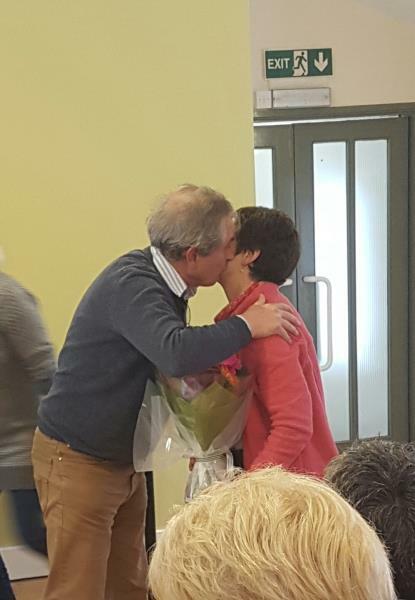 The staff knew Saturday 22 April would be car park chaos as several hundred people from the local community gathered to wish Dr Edward ffrench-Constant a fond farewell at his retirement party held at Carnon Downs Village Hall. Staff, patients, family and friends all came together to say goodbye and wish him well. Speeches were made by Dr Maling, then Geoff Aver, the Chairman of our Patient Participation Group, Dr Simpson and finally Dr ffrench-Constant. He was also presented with cards, gifts and donations from the patients along with his brass plaque from the surgery. Sally Rickard our Practice Manager had also made a fantastic cake featuring a spring garden laden with bees - his new hobby! 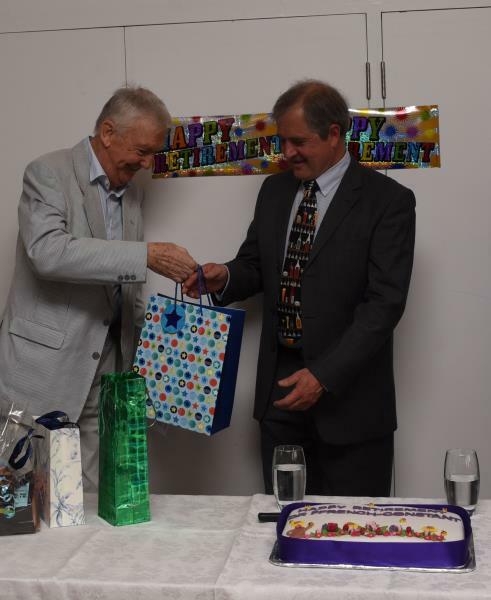 Dr ffrench-Constant who became senior partner following the recent retirement of Dr David Maling, has looked after many of the surgery’s 5,350 patients since he joined in 1988 when Dr Wilfred Jackson retired. He is a highly-regarded and respected GP, always prepared to make time for his patients and to listen with patience and understanding. News of his leaving was met with sadness, by staff and patients alike. Born in Southern Rhodesia, now Zimbabwe, in 1958, he attended Falcon College in Rhodesia, coming to England aged 18, to study medicine at St John’s College, Oxford, and the John Radcliffe Hospital in Oxford. 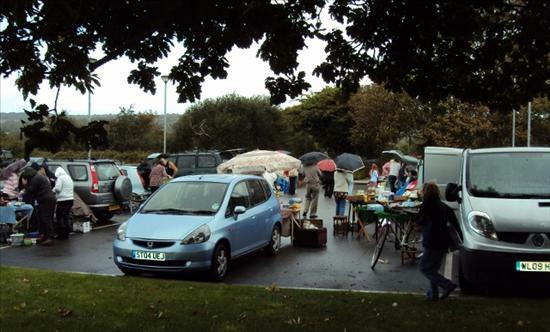 He came to the Royal Cornwall Hospital at Treliske in 1982, working under the late Dr Brian Prout, taking part in many specialties there, then doing a GP training year at the upper Lemon Street practice. Dr Simpson adds "Edward ffrench-Constant is an exceptional GP. 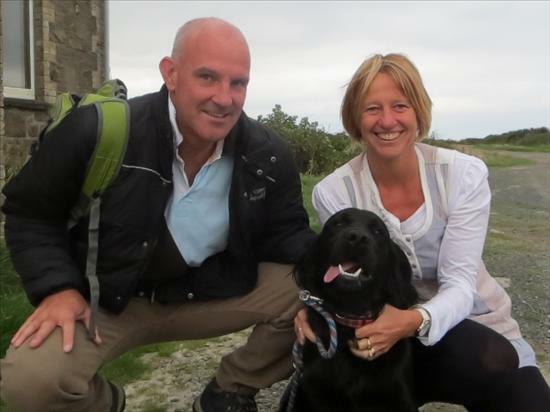 In addition to being much respected by his patients, he has been instrumental in developing the practice at Carnon Downs and in contributing to the work of the local NHS. We have been very fortunate to have him as a colleague and his patients have been very fortunate to have him as their GP. We wish him a very happy retirement". Dr ffrench-Constant plans to spend his new-found leisure time gardening, keeping bees, walking, taking photographs, cooking, travelling, and, he says, continuing to enjoy and study the natural world. Dr ffrench-Constant giving tips and tricks to the patients now he has retired! The girls - always there behind the scenes making it happen for the surgery - a special thank you to Thomas, Mollie-May and Jamie who were just brilliant. 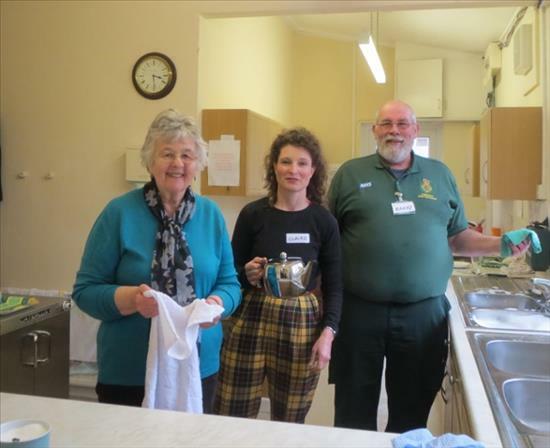 We also had the wonderful company of Heather, Joy and Joan who gave their time and helped us keep on top of the washing up - so thank you all! 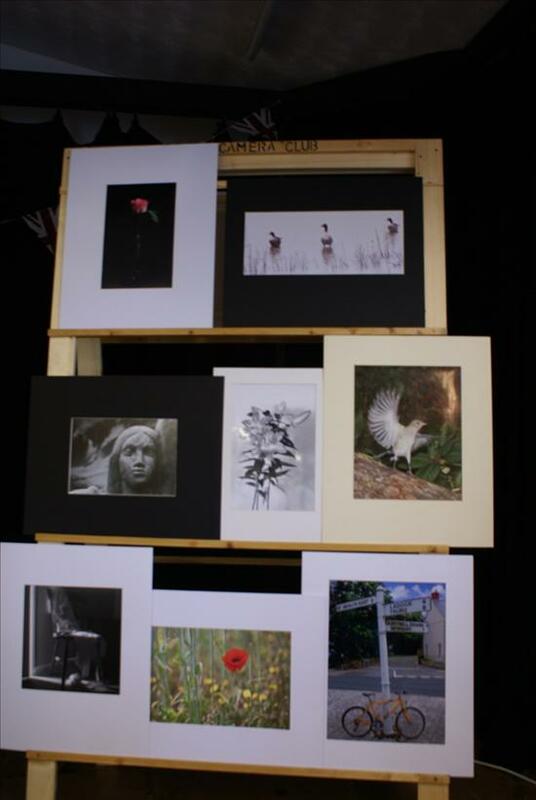 Special mention also to Mr Stephen Hobden for taking wonderful photos on the day. 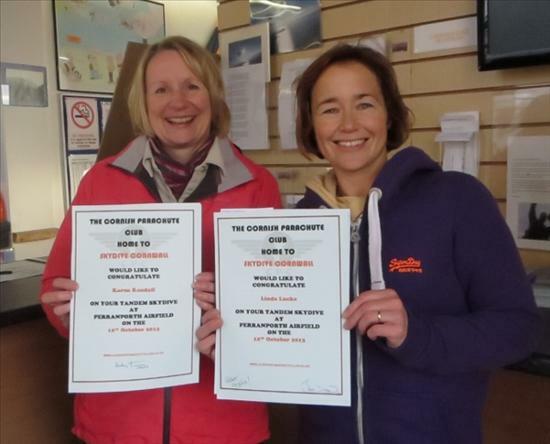 DOUBLE AWARDS FOR CARNON DOWNS SURGERY! 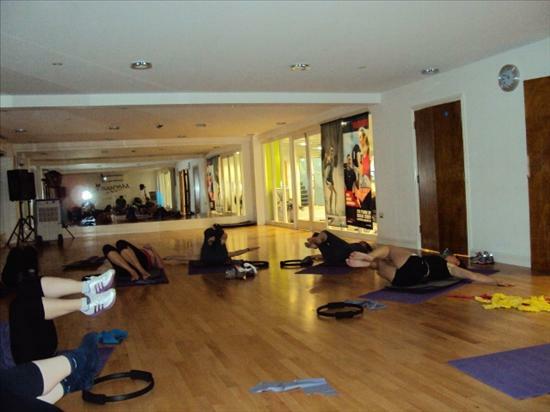 The workplace is a setting where many people spend the largest proportion of their time and therefore can play a key role in contributing to the health of employees and in turn the health of the organisation. 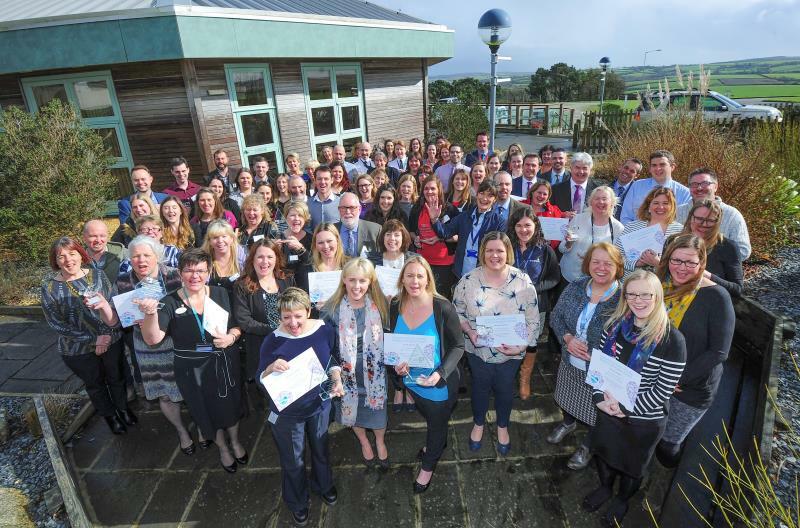 The Cornwall and Isles of Scilly Workplace Health Award is a local standard of good practice and a quality mark of health and wellbeing in the workplace. The aim of the award is to act as a toolkit to encourage employers to think about ways to improve the health and wellbeing of their employees. So it is great to announce that Carnon Downs Surgery is still flying the flag for Cornish surgeries by being awarded the Gold Award for 2017 at the Royal Cornwall Showground in February. There are three levels to the Award - Bronze, Silver and Gold so people can be rewarded for progress. 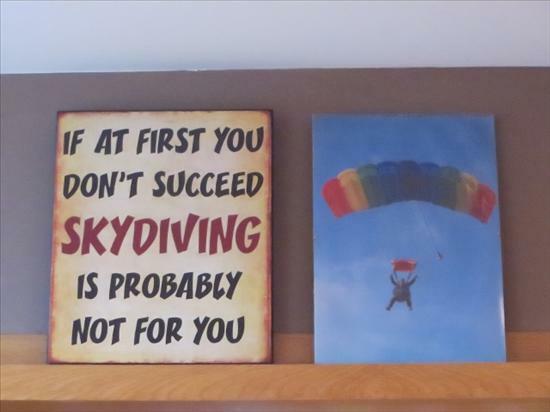 It encourages people to celebrate each of their achievements. 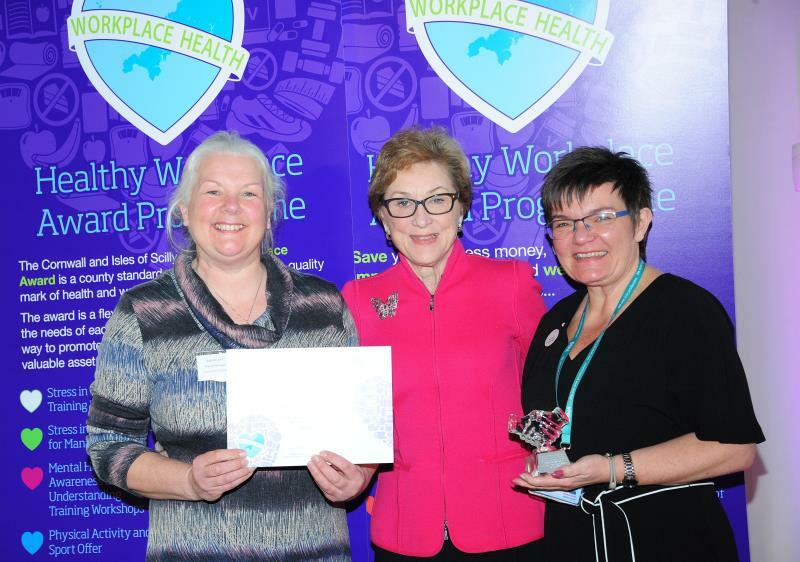 The new Mentor Award recognises businesses who are willing, or already helping other businesses on their journey to improving the health and wellbeing of their staff and it was with great surprise and delight that Sally Rickard and Alison Hunt received the Mentor Award for 2017 on behalf of the team from Dame Carol Black at this year’s ceremony. 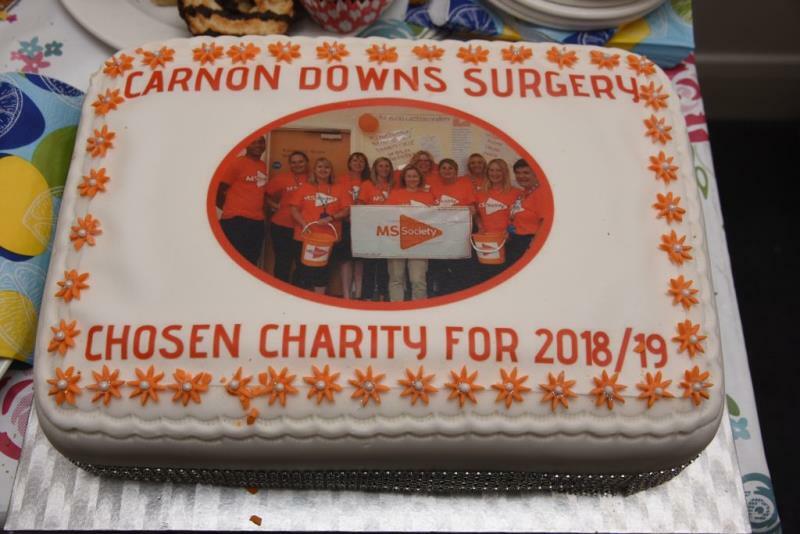 Carnon Downs Surgery is still the only practice nationally to have been awarded this accolade and both Alison and Sally actively encourage other practices throughout the county and indeed other businesses to join this excellent scheme. If you are interested and want to improve the health and wellbeing of your staff and for more information go to https://www.behealthyatwork.org where Rachel Faulkner the lead for Cornwall will be delighted to hear from you. 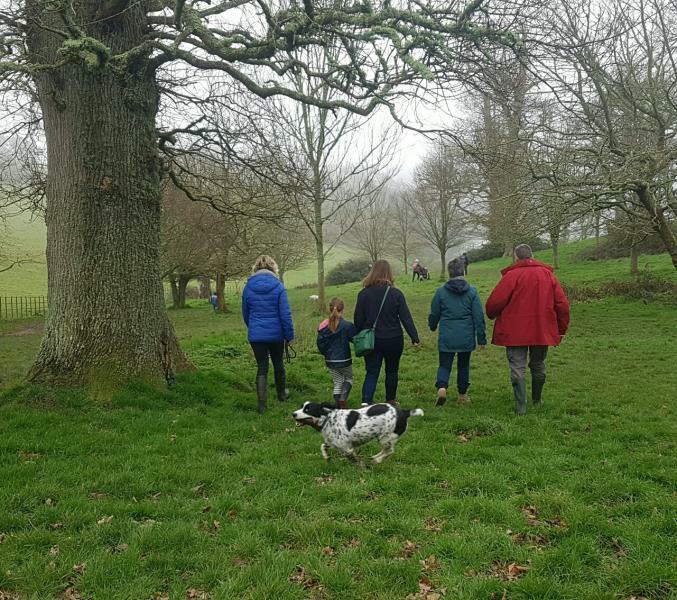 TRELISSICK, TEA AND TIME TO SAY GOODBYE! 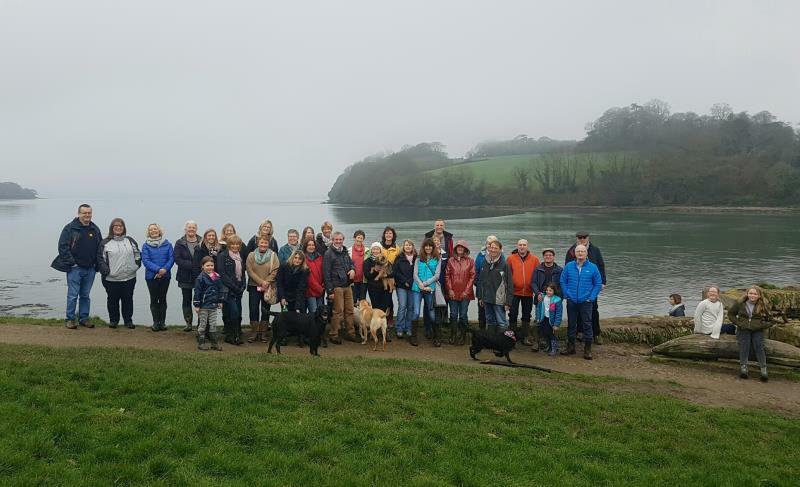 Saturday 11 March saw all the staff and doctors gather at Trelissick to wish Margaret a fond farewell. Margaret has worked here at the surgery since 2003 in the dispensary however she was also our 'Editor in Chief'! 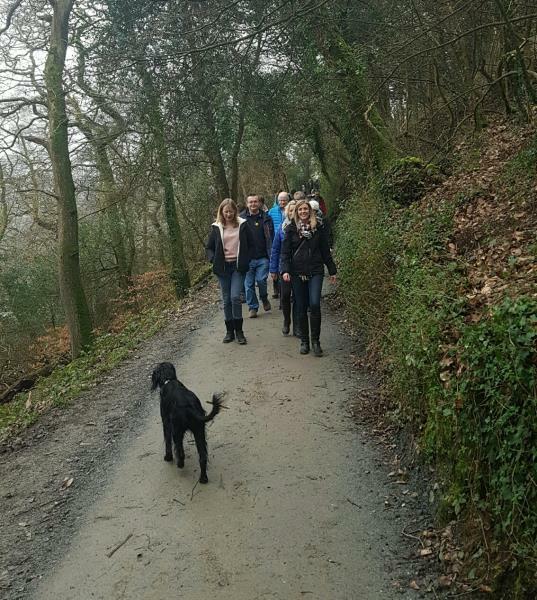 One of her favourite pastimes is to walk the Cornish countryside so it was very fitting that she chose to celebrate her retirement with a lovely walk followed by afternoon tea. We will miss her dearly for her compassion, dedication and experience she brought to the surgery. This was very evident by the great turnout for the afternoon. Dr ffrench-Constant thanked Margaret for all her hard work over the years and she duly responded, as she always did, eloquently and with grace. COFFEE, CHRISTMAS PRESENTS, CAKES & CAULIFLOWERS! 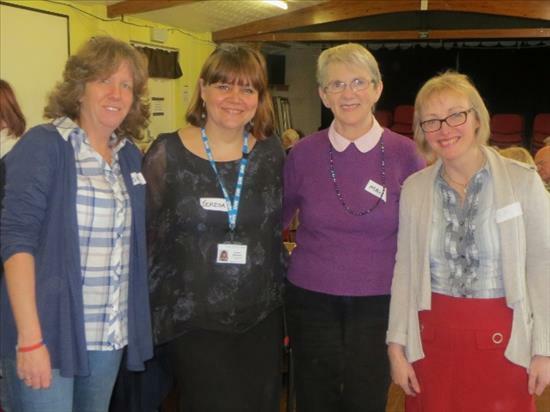 Saturday 21 January saw the surgery staff host their first event for 2017. This year the GP's and staff have chosen Mind as their charity. Mind provide advice and support to empower anyone experiencing a mental health problem. They campaign to improve services, raise awareness and promote understanding. Because of Mind, millions more people have access to advice and support thanks to their information and services nationally and locally, in England and Wales. 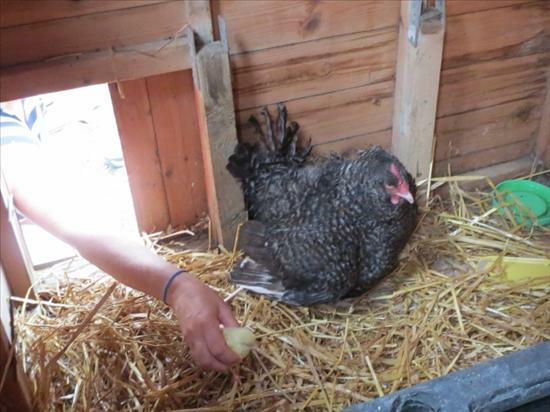 The staff and patients donated unwanted Christmas gifts and baked cakes plus local businesses donated some wonderful fresh locally grown vegetables, beautiful flowers and supplied us with freshly laid eggs. 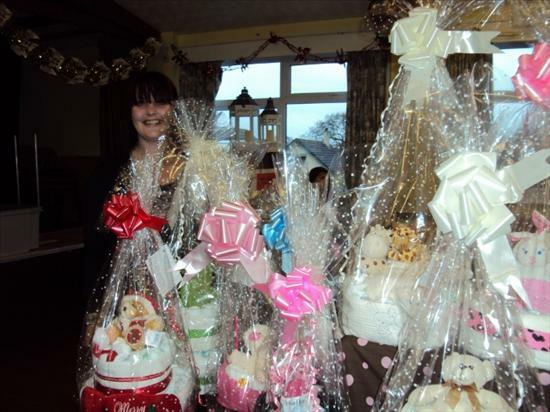 Kay spent many hours speaking with local businesses and gathered together some fantastic raffle prizes, probably the best we have ever had. Portraits while you wait were also taking place in the atrium with all the proceeds donated to the fund. Nearly £900 was raised during the morning which exceeded all our expectations - once again the patients and staff pulled out all the stops. 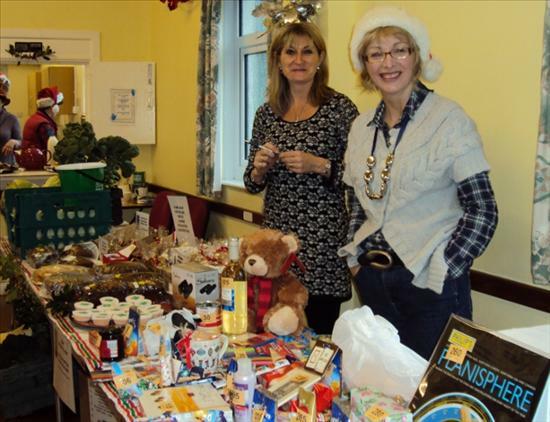 Thank you everyone who helped, donated and supported us - a real community spirited event. 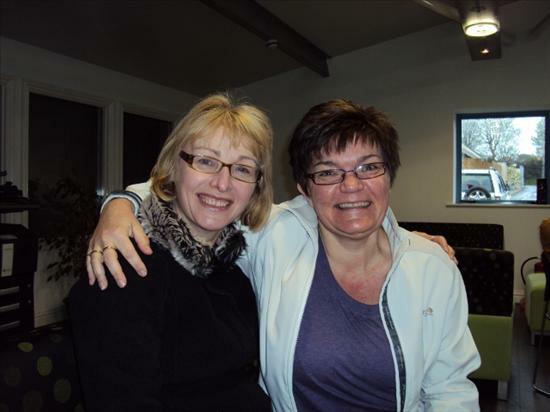 It was with great sadness that the practice said goodbye to Sandy Helgesen one of our Community Nursing Team after 12 years. Her caring nature, nursing skills, empathy, wide experience and knowledge will be greatly missed by all the staff, GP's and patients. Her smile and 'can do' attitude never waivered and our loss will be Camborne and Redruth Hospital's gain! 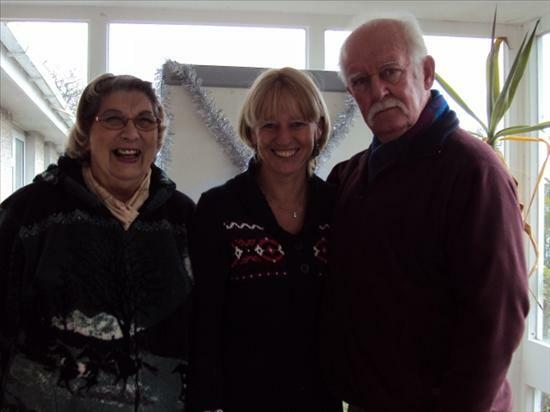 Pictured below with Sally our Practice Manager and Jackie Slater on her last day when she called in to say farewell. Sandy took over Jackie's position on the Community Nursing Team all those years ago so the day was particularly poignant for them both. We would like to thank Sandy for everything she has done for our patients over the years and wish her every success in her new role. 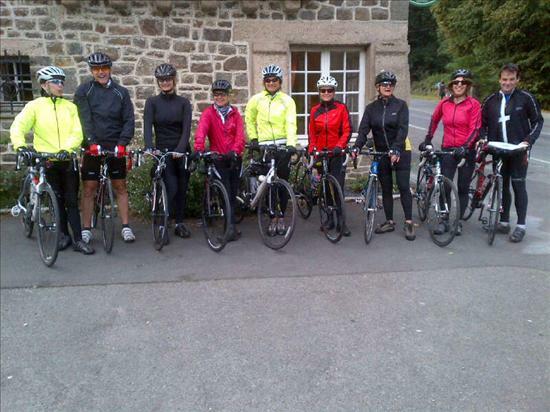 Sunday 4 September saw a team of surgery staff, family and friends cycle from Bissoe to Protreath on the Bissoe Trail. The weather was perfect for the morning's expedition, not too hot and a slight breeze in the air. 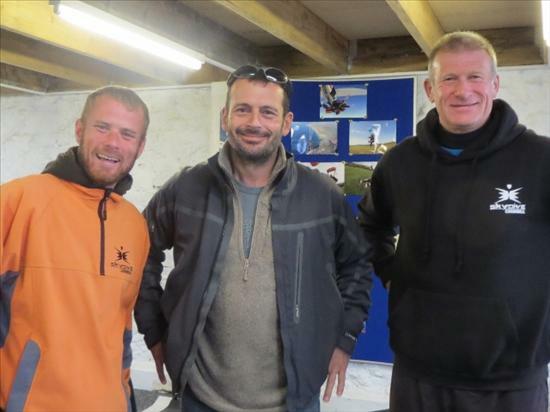 Other members of staff joined along the route finishing at Portreath for a well earned break before returning back to Devoran. 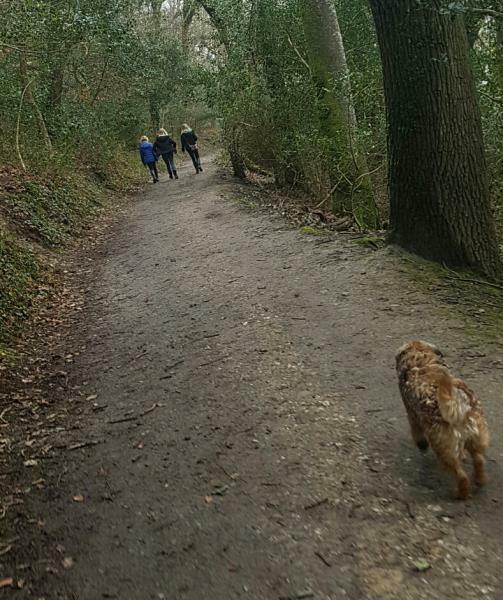 Only a few mishaps on this trip but a thoroughly good morning was had by all, including Poppy the German Pointer who couldn't quite keep up! It was a special afternoon once again here at the Surgery when Dr Simpson presented the Dispensary & Reception Teams with a gigantic strawberries and cream filled cake to celebrate the recent successes both teams have had during some training. 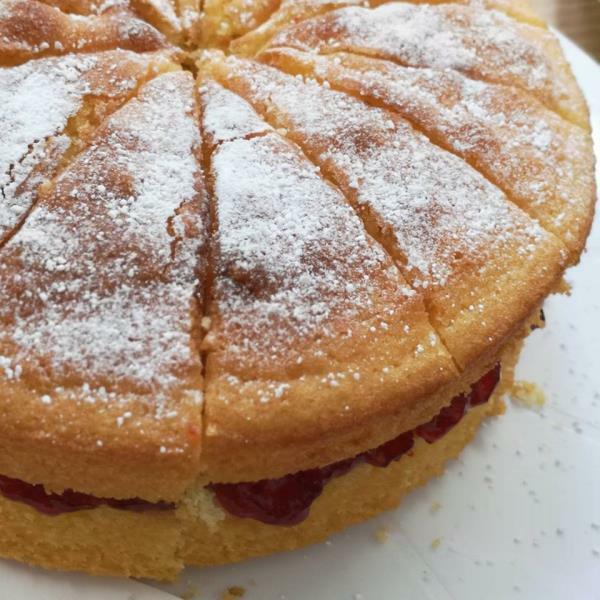 The fantastic cake had been made by her daughter Katie just like the one she made last year for the nurses as part of her Duke of Edinburgh Bronze Award Skill Test; which she has since been awarded. We are informed by every member of staff that helped to eat the cake that it was indeed worthy of a place on The Great British Bake Off! So thank you to Katie and congratulations to the teams on some excellent results. Pictured below are the two newest members of staff to our surgery Jan Trott who you will find on the front desk and Angela Mitchell can be found in the Dispensary - we would like to welcome the both and wish them many happy years service here with us. 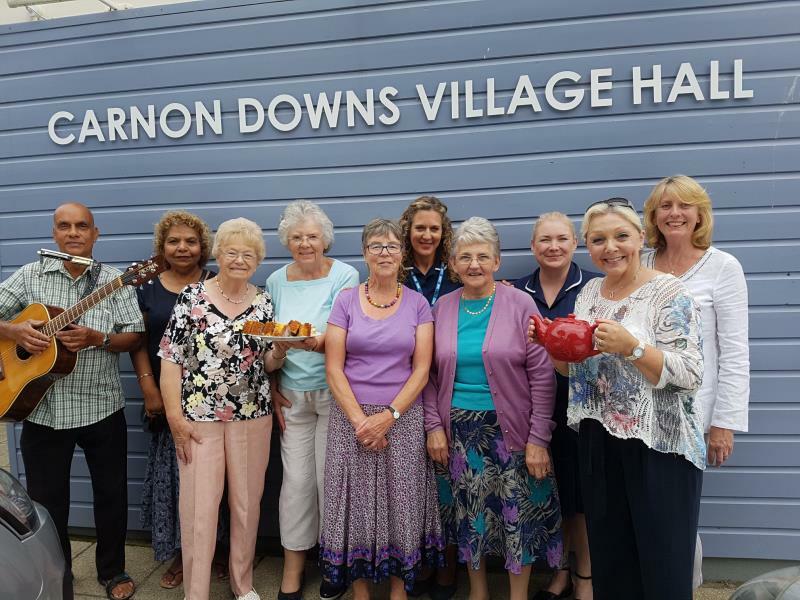 Saturday 9 January saw a wonderful gathering of Patients, Staff (past and present), along with friends and family, at Carnon Downs Village Hall to say farewell to Dr Maling. Dr ffrench-Constant gave an emotional and extremely complimentary speech having worked with Dr Maling for 27 years. He thanked him publically for all the support he had given him personally and also made it very clear that Dr Maling had led the practice with a calm steady hand on the tiller for many years. Dr ffrench-Constant felt this was evident by the length of service and loyalty of all the staff that have worked for the surgery. Mr Geoff Aver, Chairman of the Patient Participation Group, thanked Dr Maling for always being present and active in the group since its inception. He also presented Dr Maling with a large stack of hand-written messages from many of our patients and a wonderful collection from all the donations. 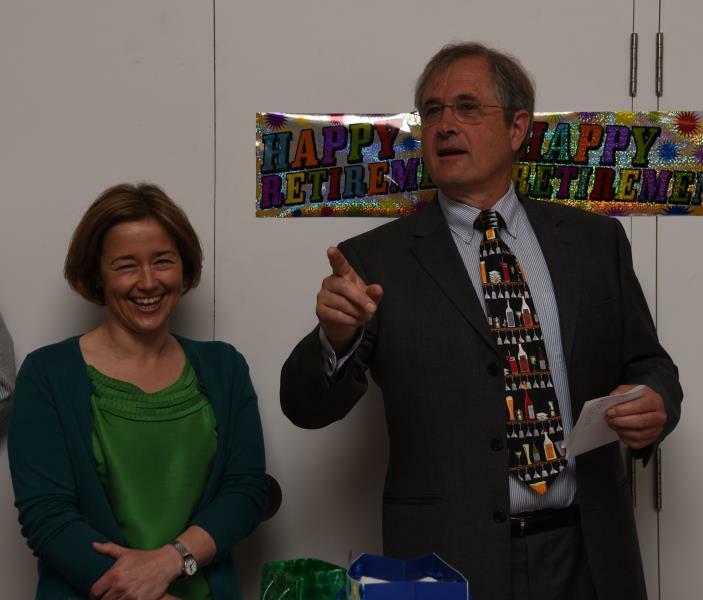 Dr Maling then said his farewell, thanking personally Dr ffrench-Constant, his wife Jenny Maling and our Practice Manager Mrs Sally Rickard. Sally, with help from her daughter, had made the beautiful cake which was then cut to celebrate the end of the morning's gathering. An emotional and celebratory morning for everyone involved - Thank You Dr Maling - Our Captain at the Helm and Admiral of our Fleet. May we take this opportunity to wish you well on your travels, your numerous fishing trips and we hope you have many happy years of rest and relaxation. Below is a picture of all staff and colleagues (past and present) who attended the party. 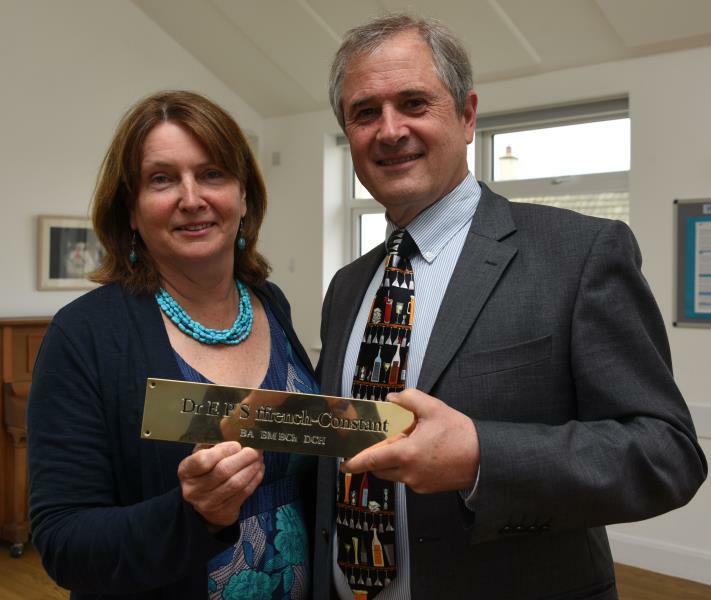 Dr Maling was presented with his brass plaque along with his messages and collection. 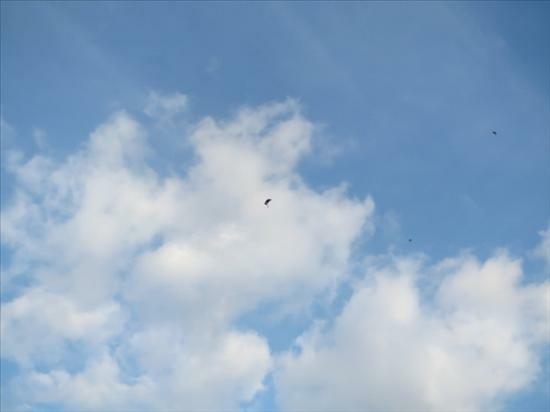 Wednesday 8 July was a very sad day for the Partners, Staff and Patients here at Carnon Downs. 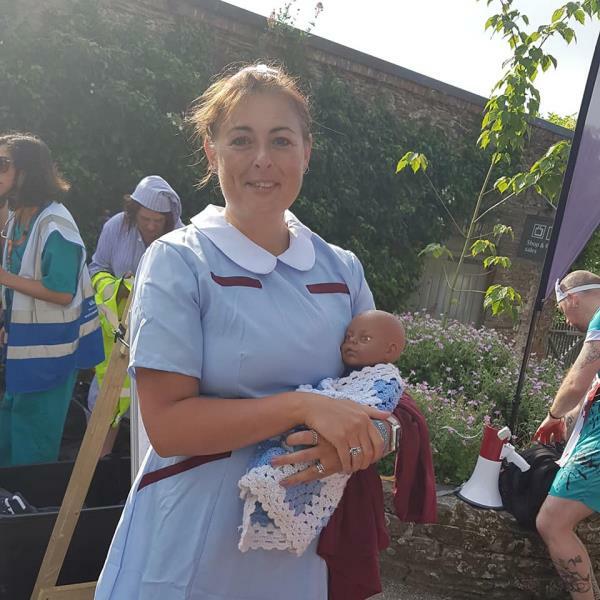 After 10 years our Community Matron Caroline Coombes has decided to rise to a new challenge and take up a post at the new Health Park in Truro. Caroline will continue in her role as Community Matron for both the Lander and Three Spires practices. 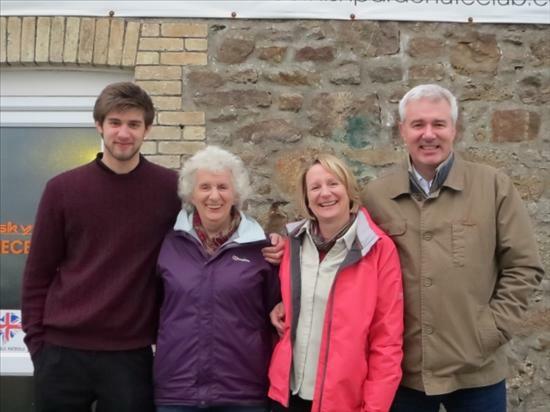 Caroline's professionalism, caring attitude, knowledge and experience in her field along with a particular skill of baking the best shortbread in Cornwall will be sorely missed - we have big shoes to fill. 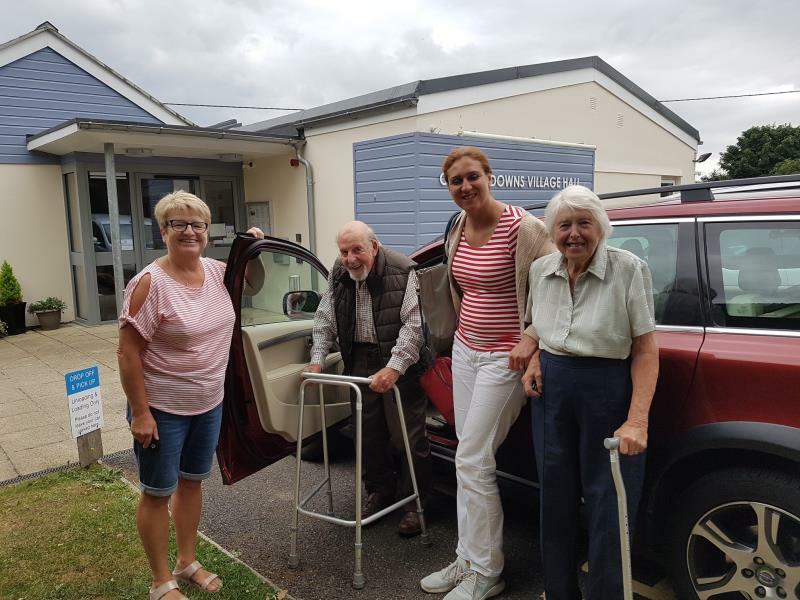 So welcome Tammy Etherington (pictured far left) who has joined us from Falmouth Health Centre, Tammy has had a few days with Caroline to hand over the reins and she can be contacted here at the surgery on a Monday or a Wednesday. 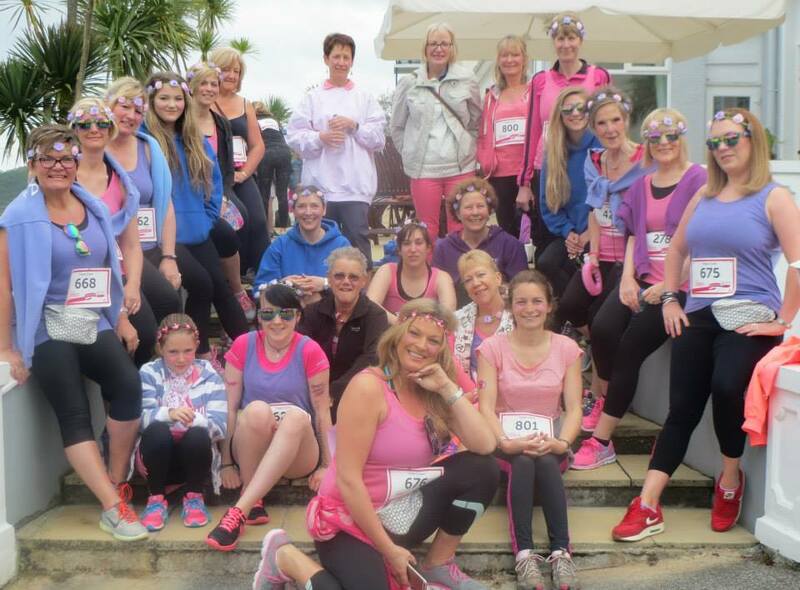 Sunday 17th May saw hundreds of women and children attend Falmouth's Annual Race for Life at Gylly Beach. 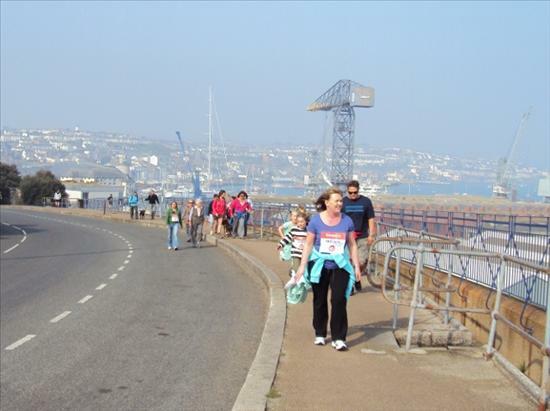 It must be one of the most beautiful courses in the series with a slight incline from the start line up to and along the seafront, then round the corner to overlook Falmouth Docks and across to St Mawes - it's then a steep climb to Pendennis Point, finally as you round the corner Falmouth Bay comes into view with the finish line in the far distance. 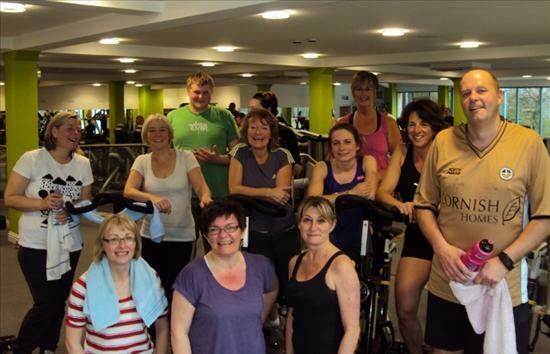 This year some of the surgery staff joined forces with the Core Fitness & Wellbeing Centre based in Falmouth. 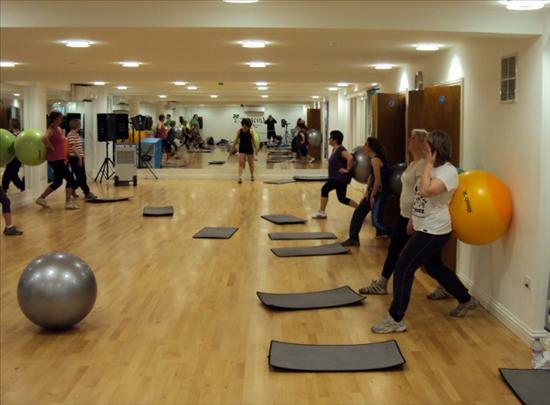 The Core had entered a team which included clients who attend their Cancer Rehab Classes, RENEW classes which help clients suffering from Neurological problems and other Long Term Conditions, along with Staff, friends and family. A united team with different levels of fitness, some ran, some jogged and some just strolled and enjoyed the beautiful spring morning. 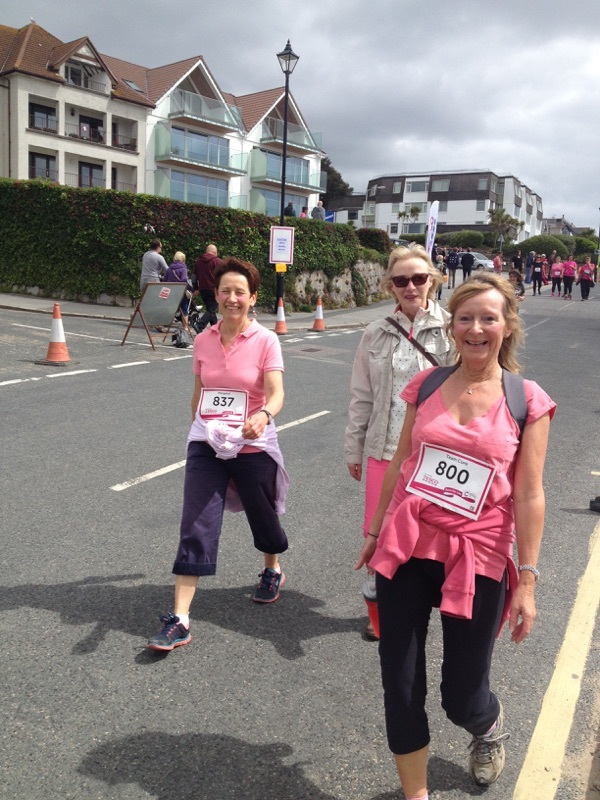 The morning started with a warming coffee and chat at The Royal Duchy Hotel, again a huge supporter of Falmouth's Race for Life, as the hotel hosted our 2009 Race for Life Campaign when all the ladies from Carnon Downs had taken part. 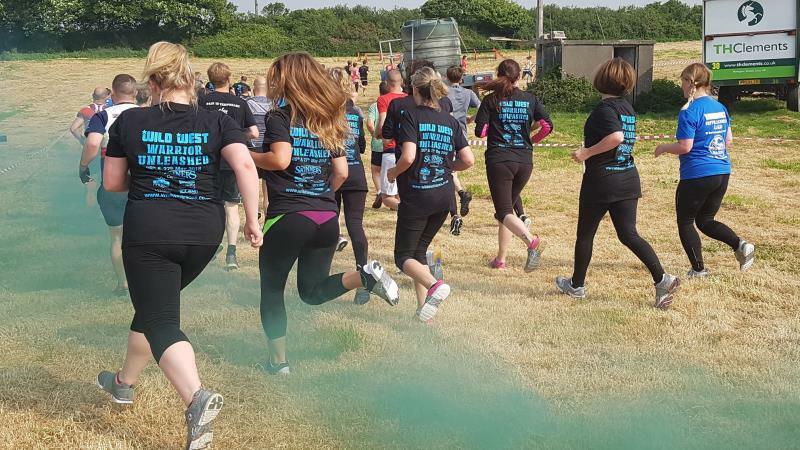 Below are a few pictures from the fantastic morning we had and we would like to congratulate every single person who completed the race for a worthy cause. 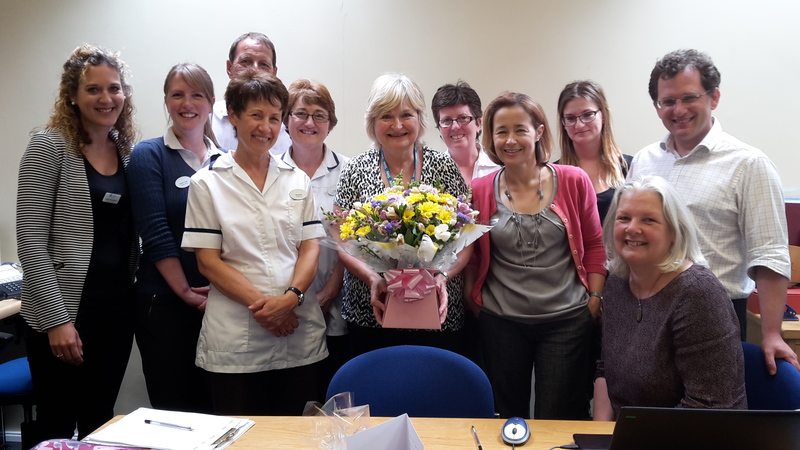 The Practice Manager Sally Rickard and some of the surgery staff presented Jane with a lovely bouquet, cards and gifts to show our appreciation for all she has done. 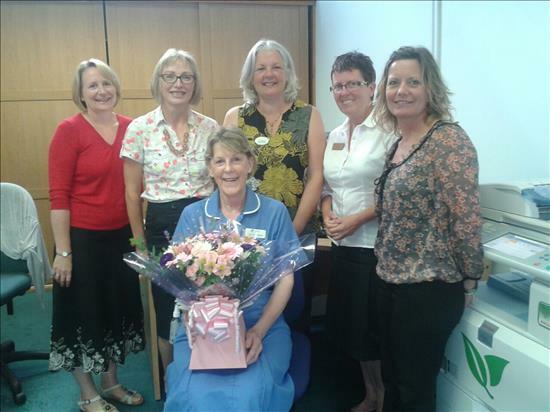 It was with great sadness that the surgery said goodbye and good luck to Jane Whitehouse one of the Community Nurses who retired this month. Jane had been in Australia nursing for 23 years before returning to the UK in 2002. She took up a post within the team which are based at Chacewater Surgery but who look after all of our housebound and terminally ill patients. She has been integral in delivering a superb standard of care to our patients over the years; her expertise, knowledge and dedication to her nursing we will find very hard to replace. 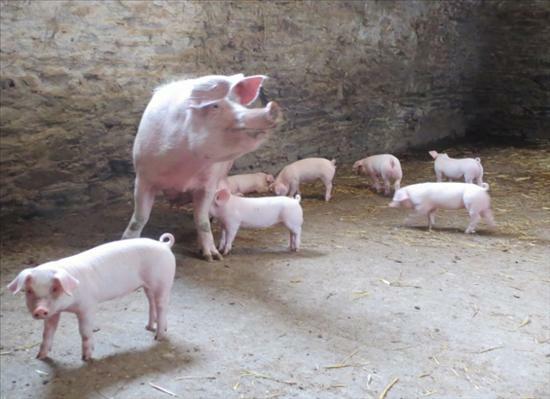 So all the GP's and staff would like to wish her well in her retirement and we hope she enjoys all the hobbies she plans to do now that she has more time to herself. 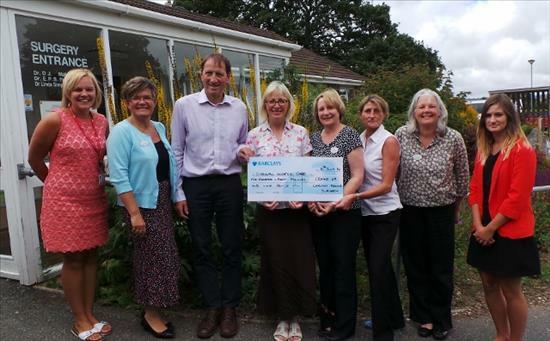 July 10th saw Amy Barnie from Cornwall Hospice Care receive a cheque from Dr Maling and some of the staff. 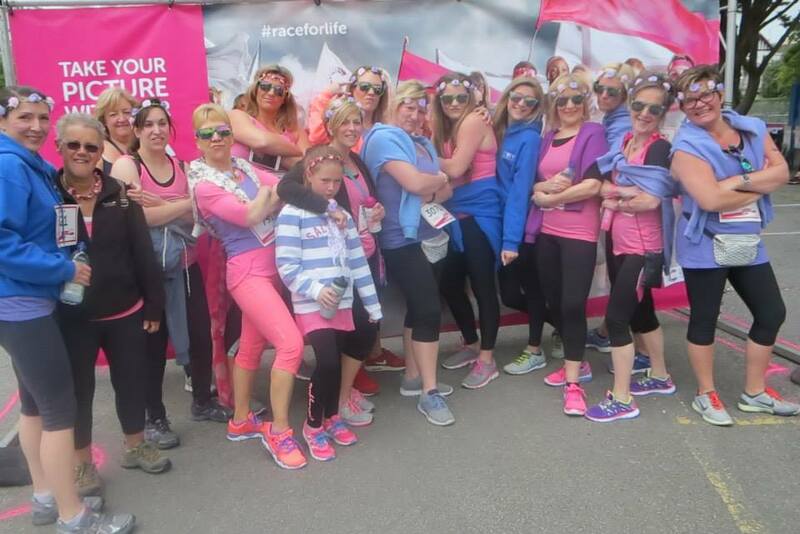 The fantastic total of £5040.09 was the amazing amount raised during the past year. The staff would like to thank all their family and friends plus all the patients who supported us throughout the year and gave so very generously. 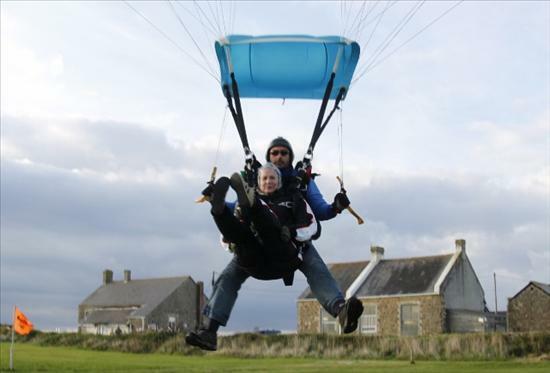 The highlight of the year certainly was the tandem skydiving and the Christmas Fayre boosted the fund considerably too. So thank you once again for your continued and unwavering support of all the surgery's fund raising events. 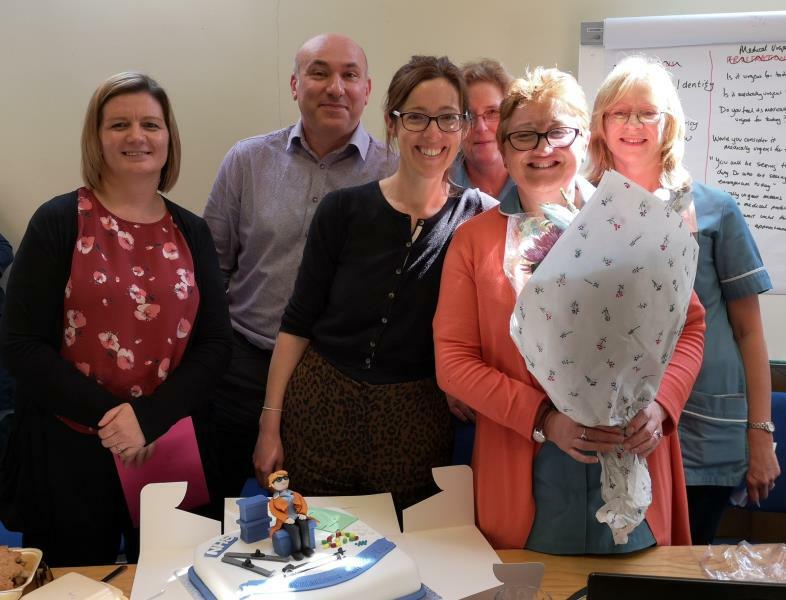 It was a special afternoon here at the Surgery when Dr Simpson presented the Nursing Team with a gigantic chocolate cake to celebrate the excellent results the team received from our Patient Participation Group Survey in March. The fantastic towering cake had been made by her daughter Katie as part of her Duke of Edinburgh Bronze Award Skill Test; which she has since been awarded. 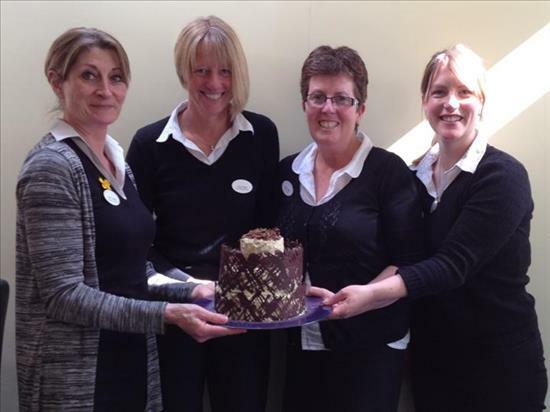 We are informed by every member of staff that helped the nurses to eat the cake that it was indeed worthy of a Gold Award! So thank you to Katie and congratulations to the Nursing Team on some excellent results. 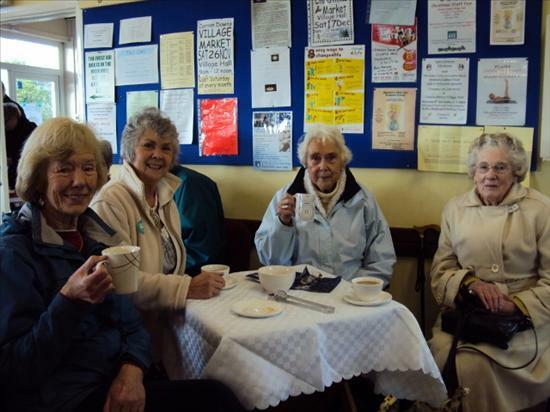 Carnon Downs has a new cafe - a Memory Cafe which is held in the main Village Hall on the 1st and 3rd Thursday of the month between 2pm and 4pm. 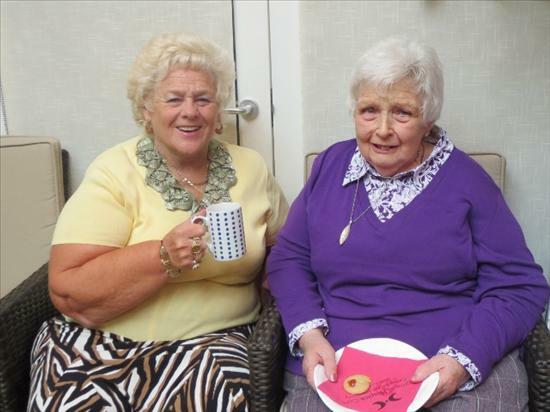 They welcome anyone with memory problems along with their family, friends or carers. 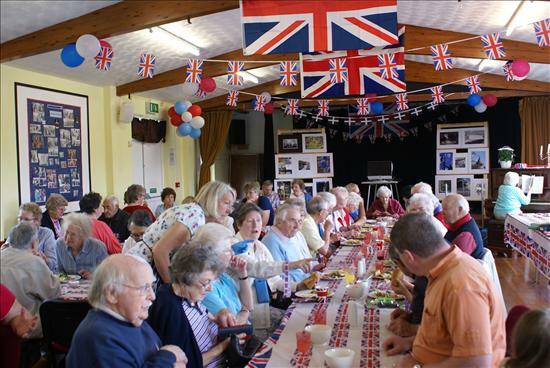 March 6th saw the first meeting when 36 guests and 12 volunteers attended and Nigel Skewes was the guest speaker or rather guest singer and guitar playing; entertaining all the people that enjoyed the afternoon. 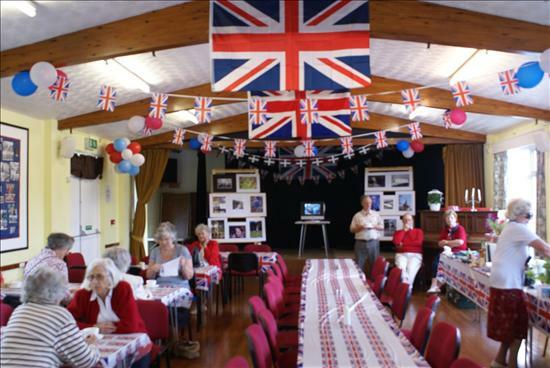 Various events and guests will attend each meeting and that might include arts and crafts, music, singing, pictures and reminiscence sessions. Booking is NOT ESSENTIAL however if you wish to attend please contact Teresa Sampson (Primary Care Dementia Practitioner) on - 07795 590305 as space is limited. 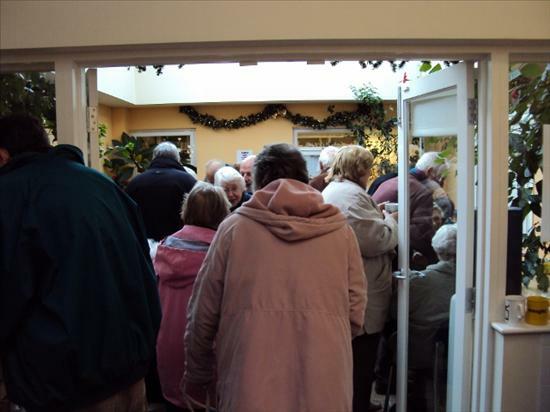 The hall was full with people enjoyed the afternoon activity and tea! 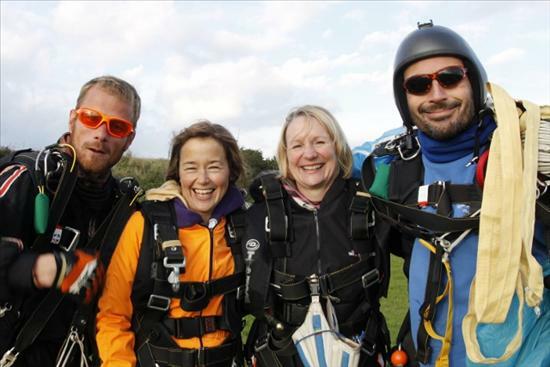 THE STARS OF THE SKYDIVE ARE NOW THE STARS ON THE BIG SCREEN! 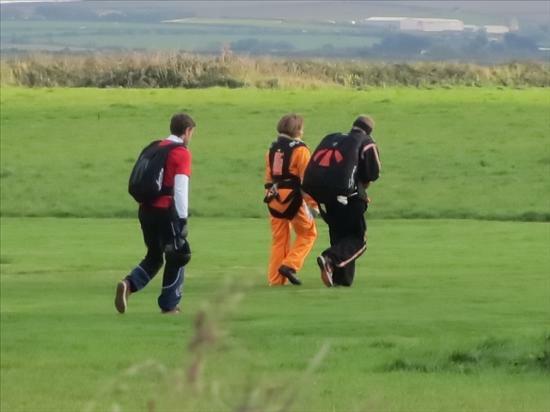 Click on the link below to see a short film we have put together from the Tandem Skydive on October 12th 2013. 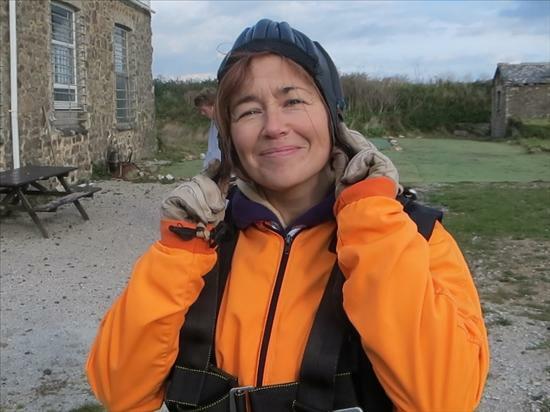 Let us set the scene - Saturday 12 October, The Cornish Parachute Club in St Agnes it's 8am in the morning and the sky is full of low grey clouds and a very brisk breeze is whipping around us as we cross the car park to register for this years big charity event - Our Tandem Skydive. 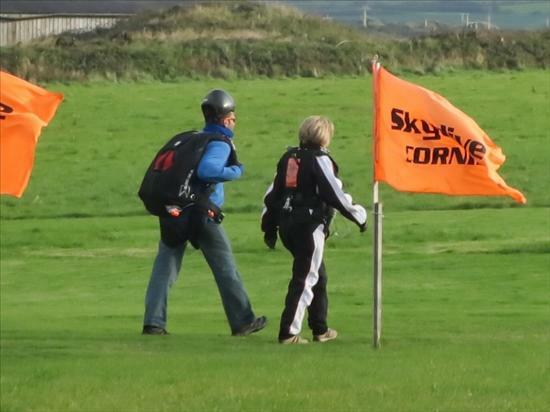 It was a very long wait and shortly after 2.30pm the instructors informed us we were good to go! The Doctors, staff and families all waiting for the go ahead - Nervous? 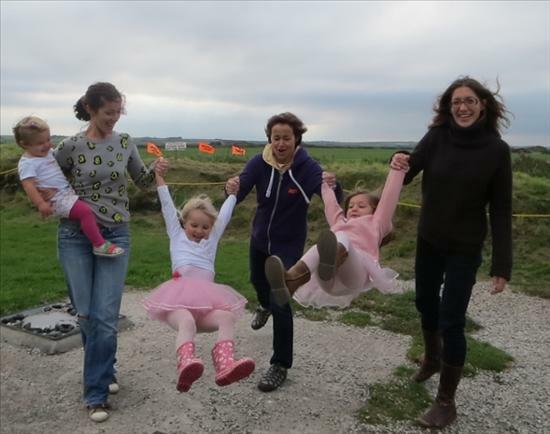 Our lady doctors practice the jumping technique with our youngest supporters! The silly hat shot had to be done! 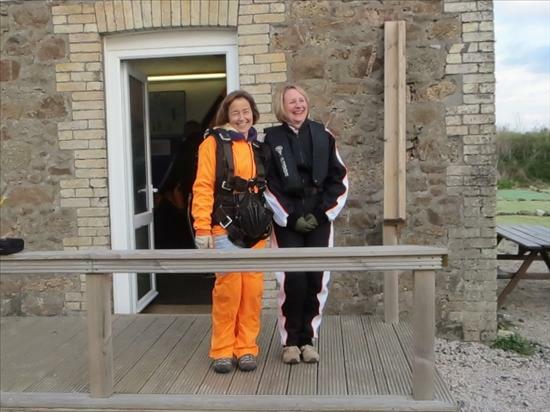 Judy and Alison are all geared up ready to go but then the most unfortunate thing put an end to our waiting game. 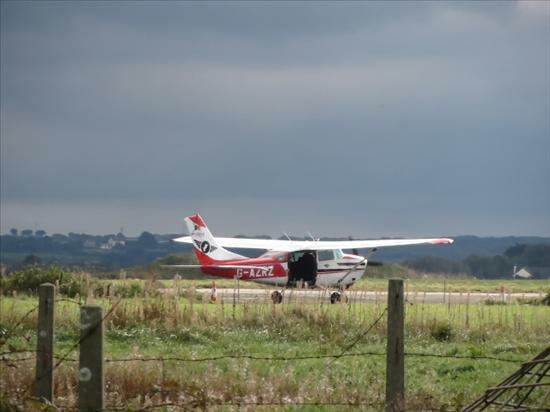 After refueling our pilot discovered a technical fault and we could no longer continue with the skydives. It was such a huge disappointment to the other four jumpers but they are booked for next Sunday we all hope that the jump will go ahead. After nine hours of pacing the waiting room they really were ready for the big event and so please keep visiting this page to see if they succeed! 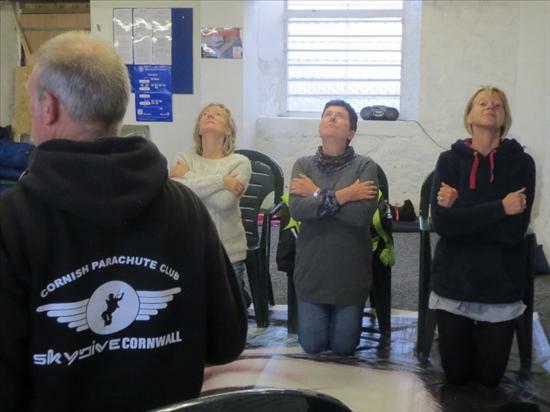 We would like to take this opportunity of thanking all the staff at the Cornish Parachute Club for an excellent briefing - you really are a fab team, you were calm and encouraging, professional and fun too! 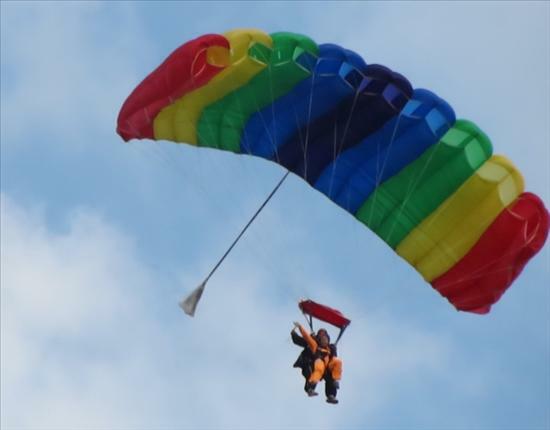 If you would like to donate to our charity please click on the link below and you will be redirected to our online sponsorship page. 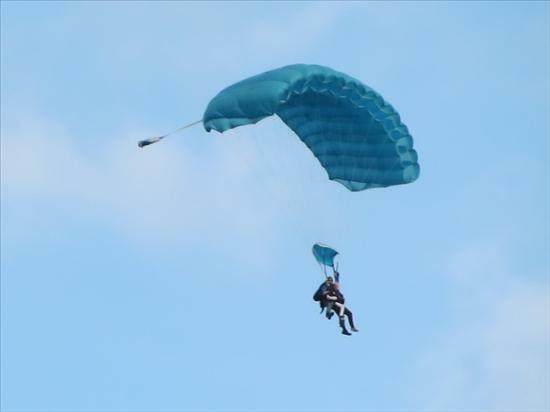 Another special thank you must also go to the family and friends who waited with the brave jumpers and drank copious amounts of tea and kept them calm - well done everyone. 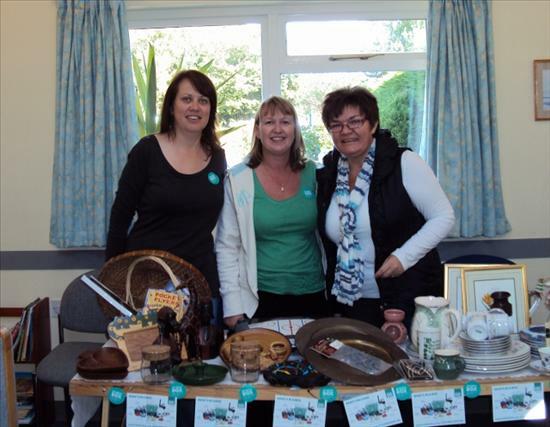 Saturday 21st September saw plenty of waistlines growing as patients and their families joined the surgery staff in a busy coffee morning raising money for this year's chosen charity - Cornwall Hospice Care. 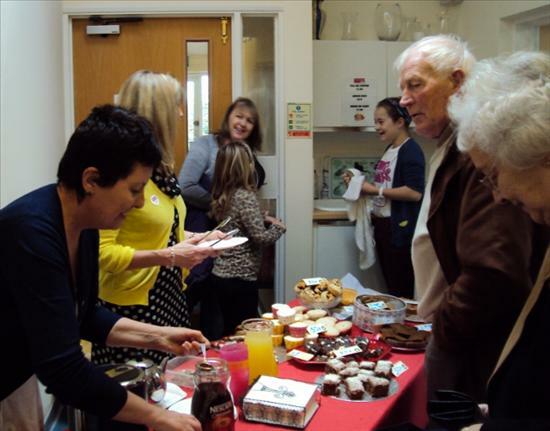 The tables were laden with wonderful homemade cakes generously donated by patients and staff alike. 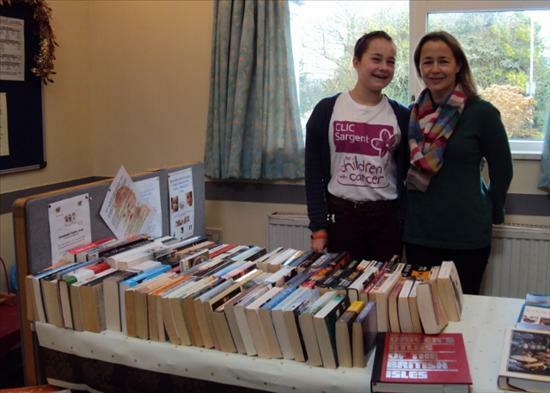 The kettle was on non-stop making a brew and the helpers were busy selling books in the make-shift 'Library' situated in the Nurses Treatment Room along with the girls who manned the sponsorship table gathering donations for the staff's brave Tandem Skydive taking place in October. 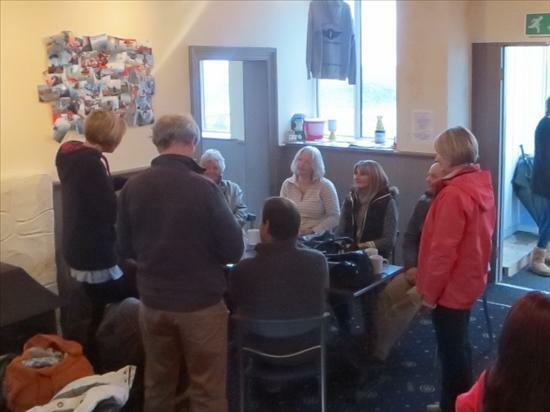 An excellent total of £475 was raised in one morning - SO THANK YOU to everyone who donated and attended. 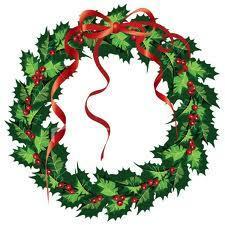 Don't forget our Christmas Fayre being held at the Village Hall on Saturday 7th December. 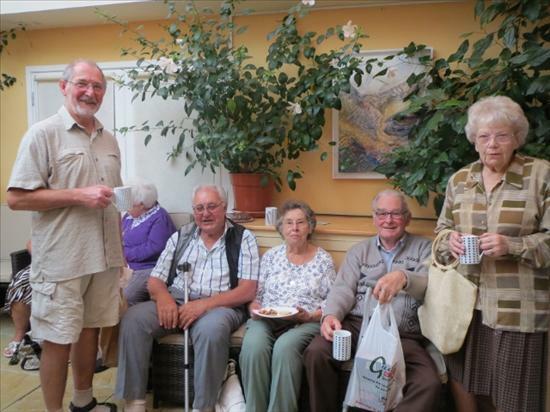 Patients enjoying the coffee, cakes and chatter! On Saturday 12th October over the North Coast of Cornwall you will hear some screaming from some of our wonderful brave staff! 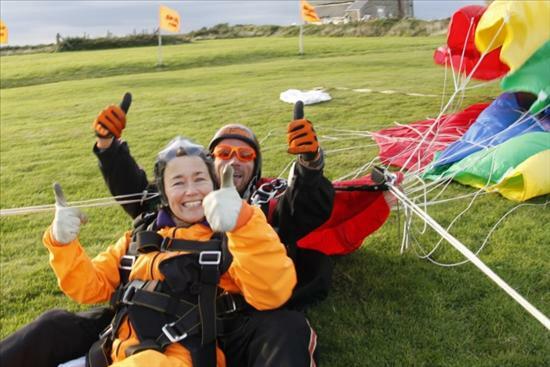 This year's BIG EVENT is a Tandem Skydive in aid of Cornwall Hospice Care. 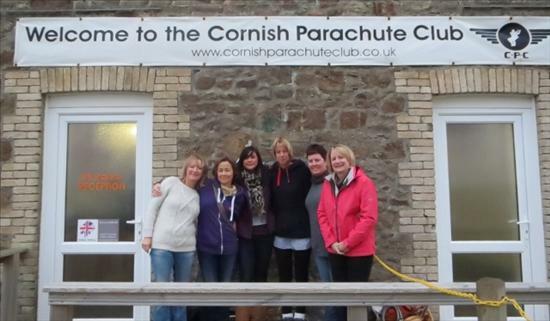 Our ladies will jump from 10,000ft and feel the incredible adrenalin rush whilst enjoying unique views across Cornwall. 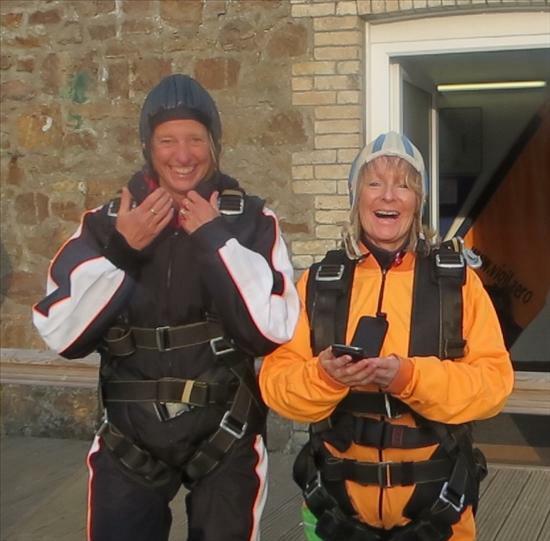 The money you raise by supporting our ladies on this once in a lifetime challenge will help Cornwall Hospice Care to continue providing care and support to adults in Cornwall with life-limiting illnesses. Sponsorship form for donations available at reception. 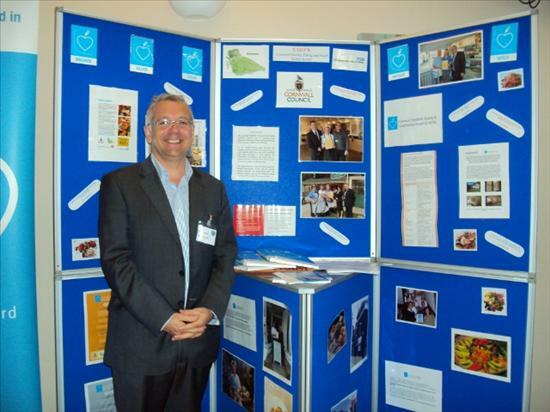 With an overwhelming majority the staff have decided that the chosen charity for 2013/14 will be Cornwall Hospice Care. 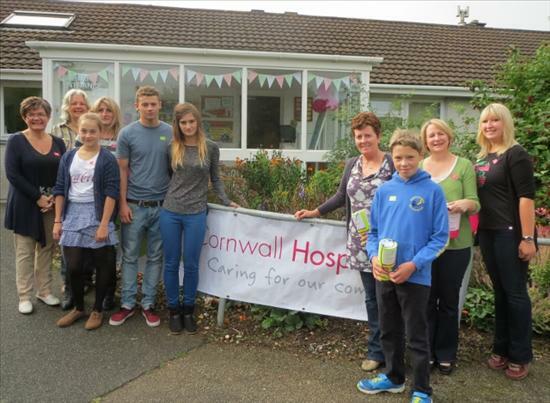 Cornwall Hospice Care is devoted to providing clinical care and support to people living with life-limiting illnesses in Cornwall. The hospice accept admissions to both of their hospices 24 hours, 7 days a week and have on call specialist medical cover at all times. 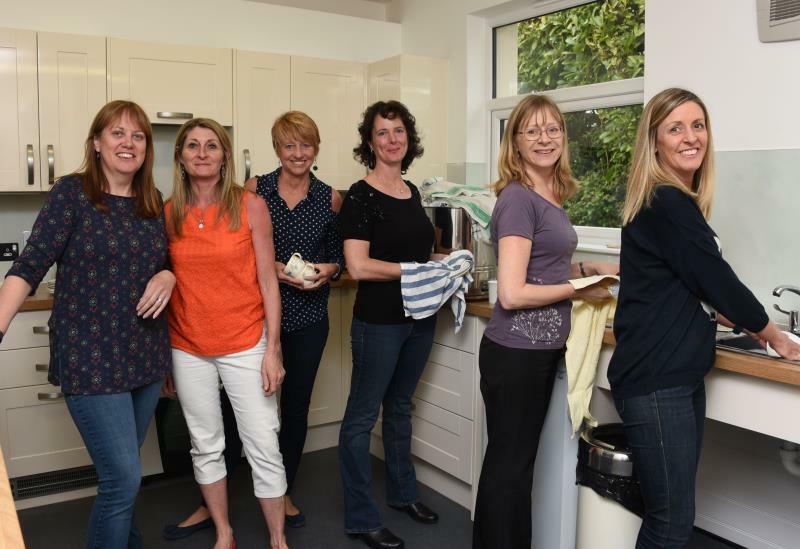 Their specialist multidisciplinary team includes specialist nursing, physio and occupational therapy, lymphoedema treatment and psychological, family and bereavement support. They care for patients with any life limiting diagnosis and specialist palliative needs for symptom control, complex end of life care or other complex problems. 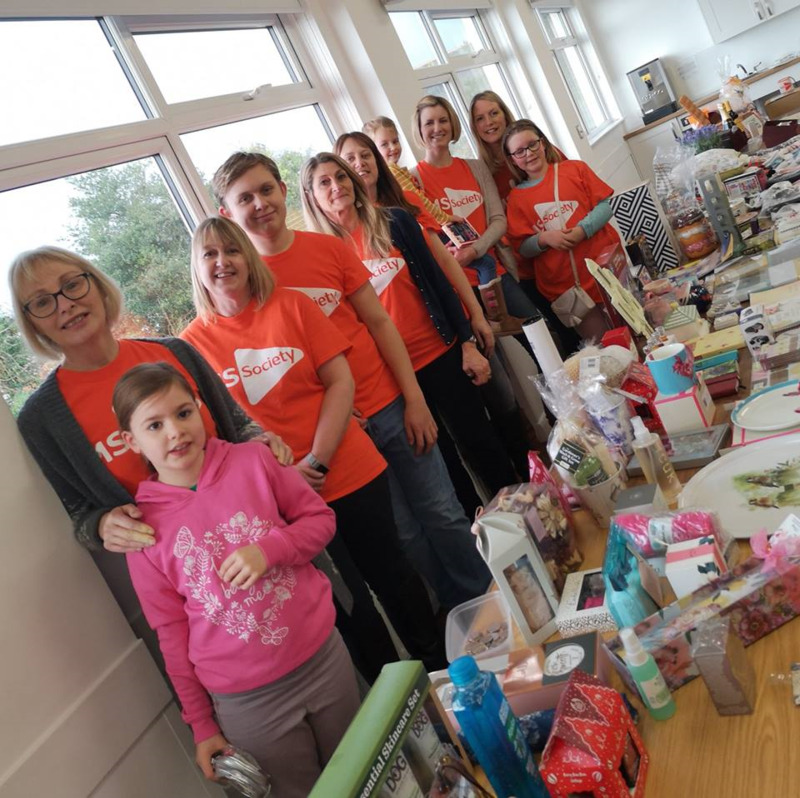 Every year thousands of people are touched by their work as they provide the highest quality specialist care to patients and their loved ones from our two hospices - St Julia's in Hayle and Mount Edgcumbe in St Austell. They provide expert care to alleviate pain and manage the distressing symptoms that often accompany life limiting illness - this is also known as specialist palliative care. The care is provided free of charge, but our annual £6.8 million costs equate to nearly £13 a minute. With limited government funding, they rely on the on-going generosity of individuals, groups and businesses to cover more than 85% of our running costs. 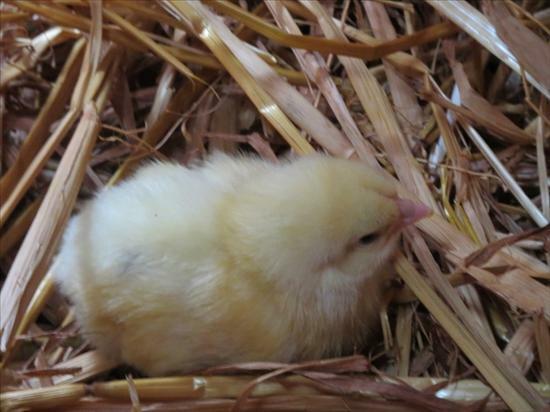 For more details about the care they provide please visit their website by clicking on the picture below. Old MacDonald had a farm, E-I-E-I-O and on that farm we had a wonderful afternoon with the doctors, staff and their families. 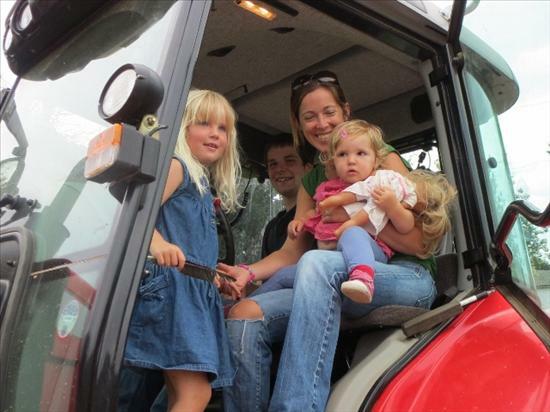 Sally Rickard our Practice Manager along with her family Mr Simon Rickard, Toby and Frankie own and run Mid Devoran Farm. 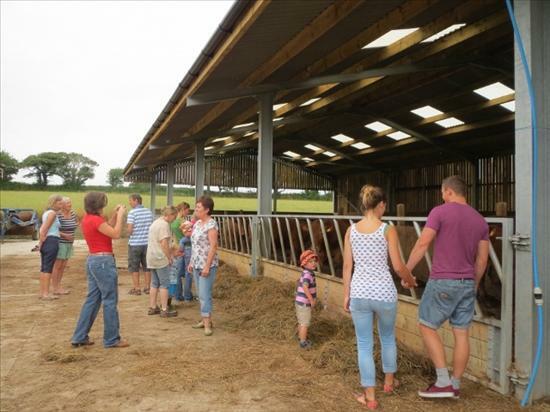 We were all invited to come and spend an afternoon seeing all the newborn animals and to enjoy the warm fresh air by having a tour around the farm along with tractor rides for the children. 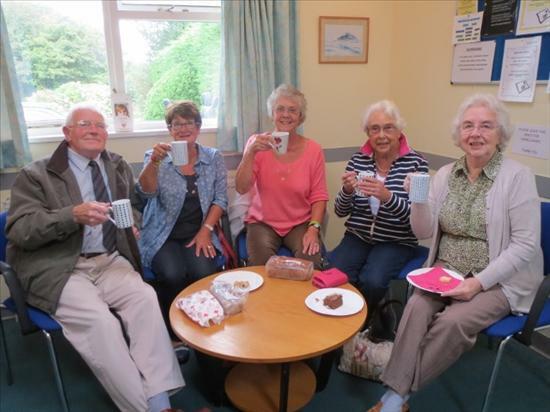 The afternoon was one of our first fund raising events for this year's charity, Cornwall Hospice Care, as staff kindly donated money for the lovely tea and cakes which were provided by Sally. 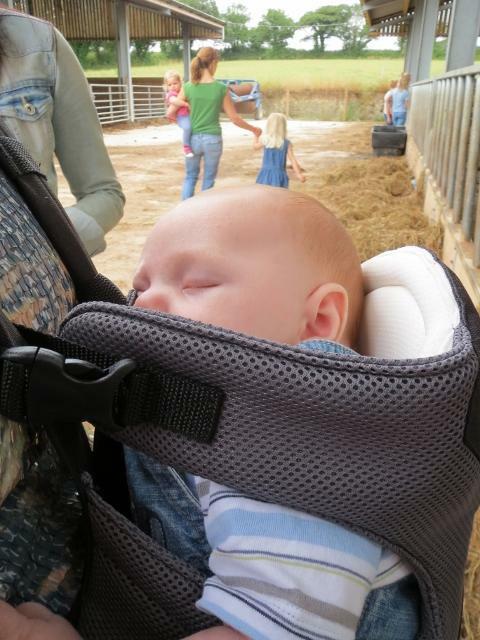 Even the big kids enjoyed the tractor rides and the newest member to the Carnon Downs Family slept happily through everything ! 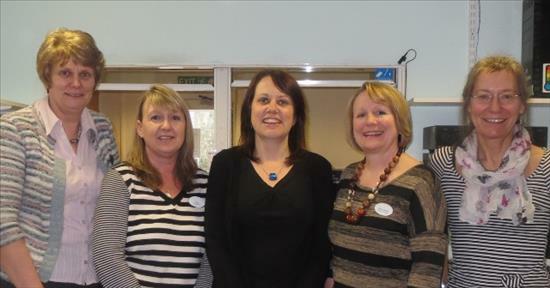 The staff would like to say a BIG thank you to all the Rickard Family for the great informative and fun afternoon. 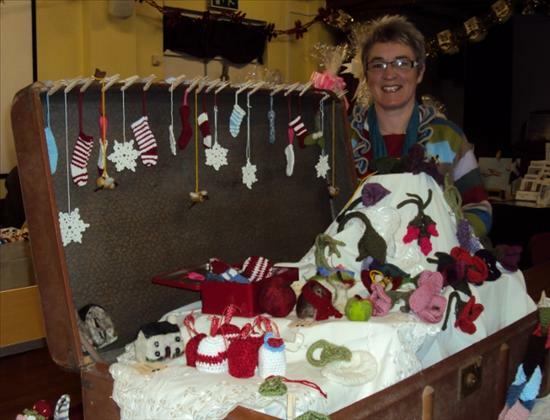 CHARITY TOTAL EXCEEDS ALL EXPECTATIONS! It was with great pleasure that the Doctors and Staff presented a grand total of £5351.25 including Gift Aid to the CLIC Sargent Charity. 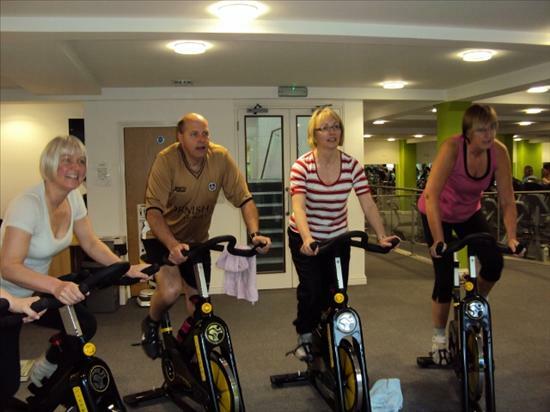 Throughout 2012/13 the staff all enjoyed various fund raising events including the Cycle Challenge from Paris to Cornwall last September and a Christmas Coffee Morning held at the surgery. Many thanks to all the patients who gave so very generously along with the family and friends who supported all the staff throughout the last 12 months. 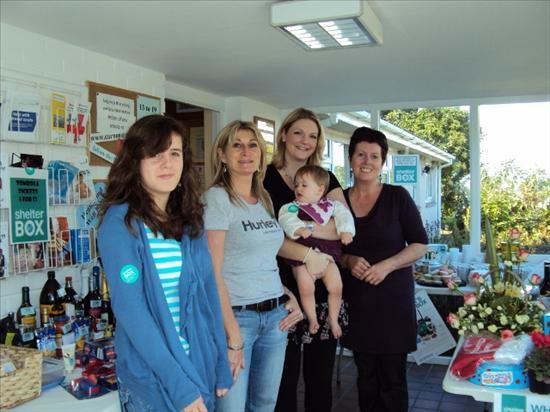 Keep checking the web site for news of 2013 Charity Challenge raising funds for the Cornwall Hospice - you won't believe what we have planned for this year! COFFEE CUPS OF CHRISTMAS CHEER! 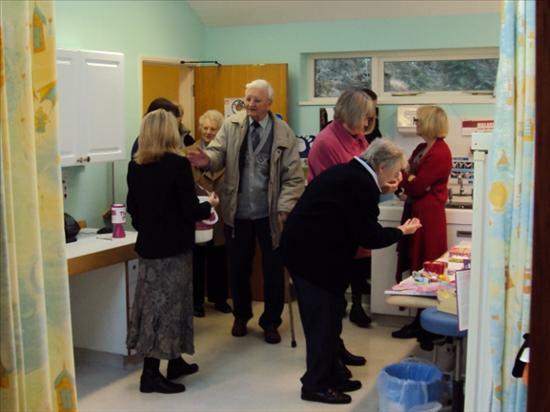 Saturday 1st December saw the Christmas CLIC Sargent Charity Coffee Morning being held at the surgery. 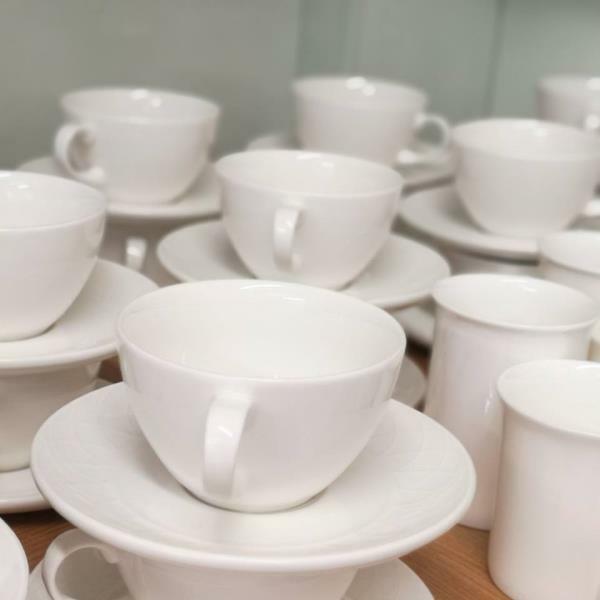 Once again the staff and their families came together to host a wonderful morning serving cups of coffee and tea along with some tasty homemade cakes and mince pies. 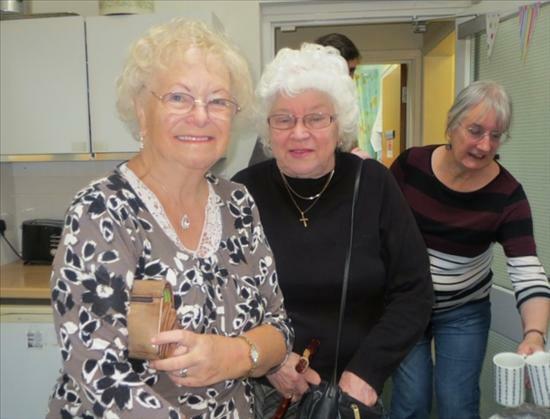 Dr Simpson and her daughters excelled themselves with a delicious Chocolate and Ginger Refrigerator Slice which was very popular! 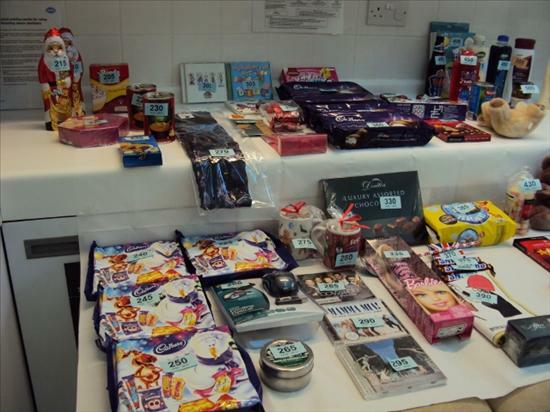 Staff and patients also donated gifts for the tombola and raffle tables which were overloaded with goodies galore. 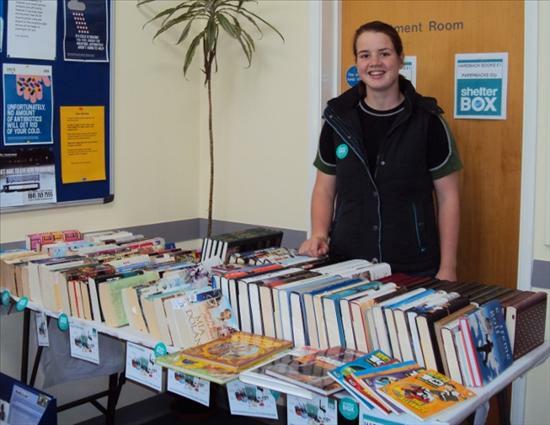 The staff also collected from patients a large collection of books which were sold in the waiting room. As in previous years Kathy our Nurse Practitioner and Jackie our Nurse both spent many hours organising and setting the surgery up ready for the morning so a very big thank you to both of them for their sterling work once again. This year the surgery has set itself a large target and with all the money from the Charity Cycle from Paris and now from the £480 raised at the coffee morning we are well on the way. 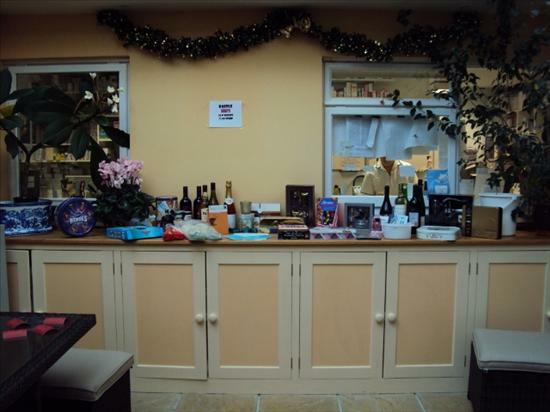 The staff would also like to thank The Royal Duchy Hotel in Falmouth for donating the star prize of a Pamper Day for Two, Lillie Brothers for donating our milk and Carnon Downs Garden Centre for donating a beautiful Cyclamen. 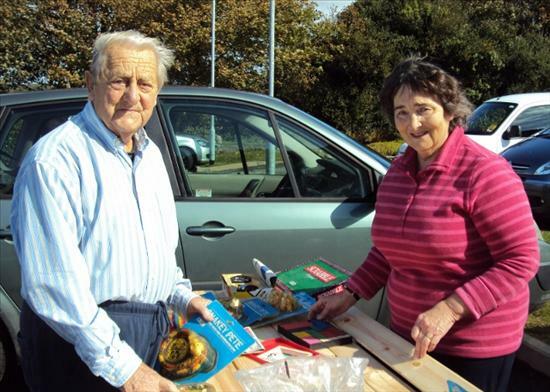 The local chairman of the Village Hall, Mr Micheal Cottingham also needs a special mention as he helped provide some tables and some much needed coffee cups ! So thank you to all the patients who attended and for donating so generously once again. 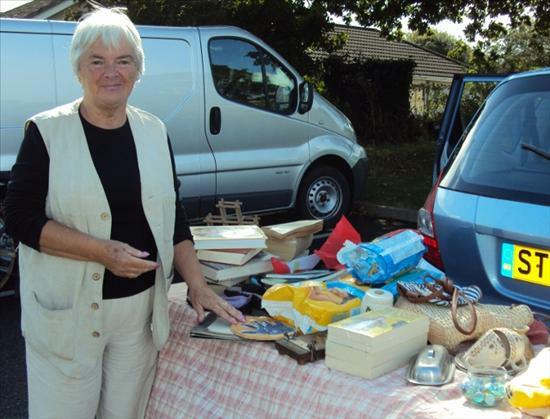 Many of our patients will remember Mrs Rosemary Archer who worked at Carnon Downs Surgery for 28 years. 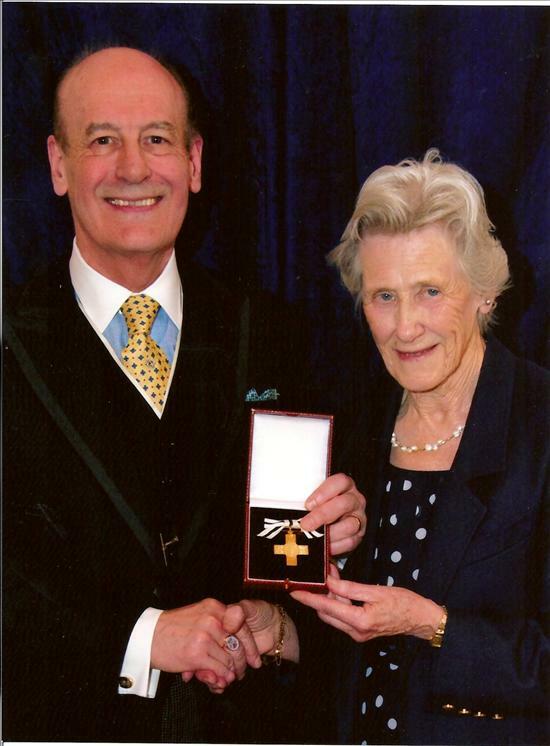 Rosemary is now the Secretary of the Friends of Royal Cornwall Hospital Treliske, and she was recently presented with the Badge of the Order of Mercy at a ceremony in London. Rosemary, who has been a Friend of RCHT and a member of Cornwall and Isle of Scilly League of Hospital Friends for 13 years, attended the League of mercy ceremony at Mansion House in June. Each year 25 outstanding volunteers are picked from numerous nominations to receive the Badge of the Order of Mercy, which is a hallmarked silver gilt representation of the original 1899 design depicting Sir Joshua Reynold's figure of Charity. 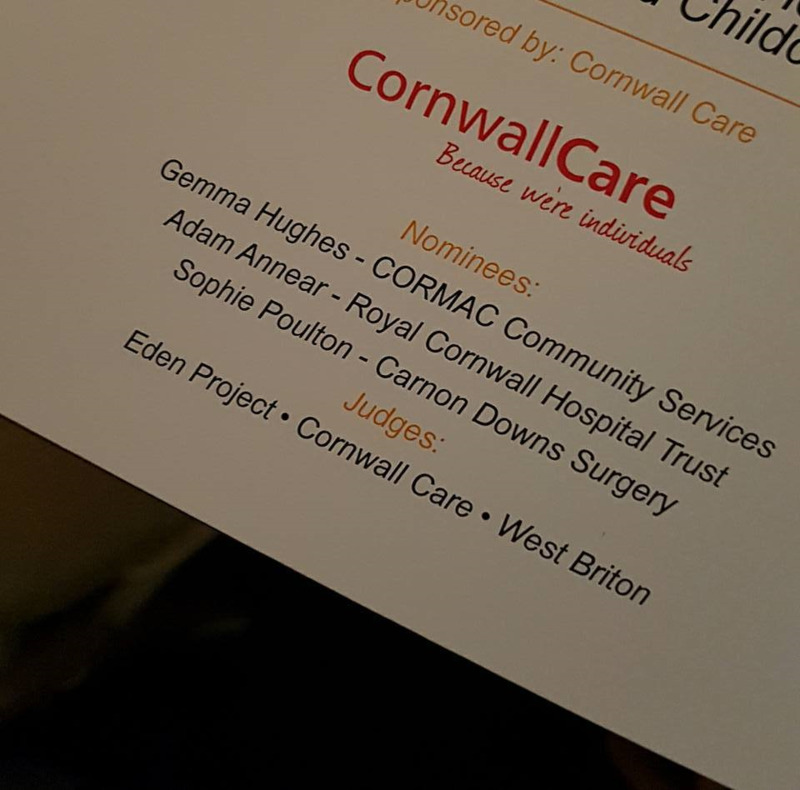 Rosemary was nominated by Cornwall and Isles of Scilly League of Hospitals and Community Friends with Martin Watts, RCHT chairman, and our own GP's from Carnon Downs Surgery supporting her nomination. 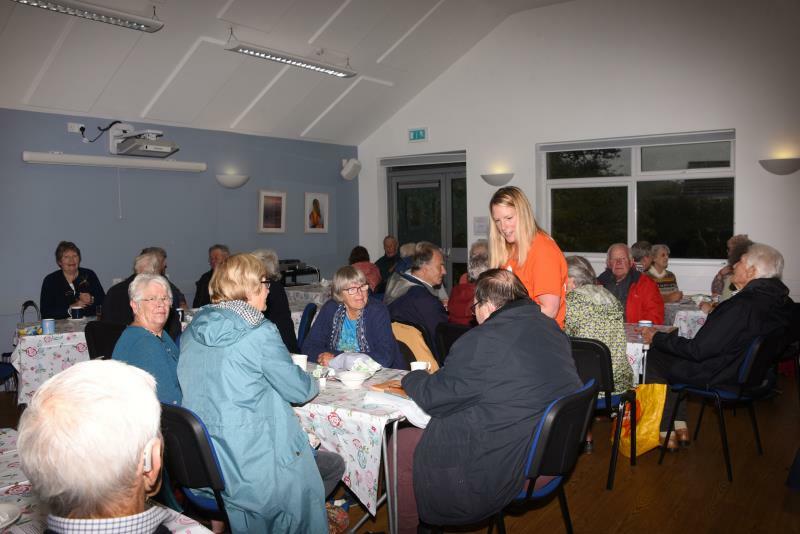 The aim of the awards is to honour the work of volunteers and by doing so promote their work to encourage others to consider volunteering within areas of after care. So congratulations to Rosemary for all her hard work over the years from all the Doctors and Staff at Carnon Downs Surgery. 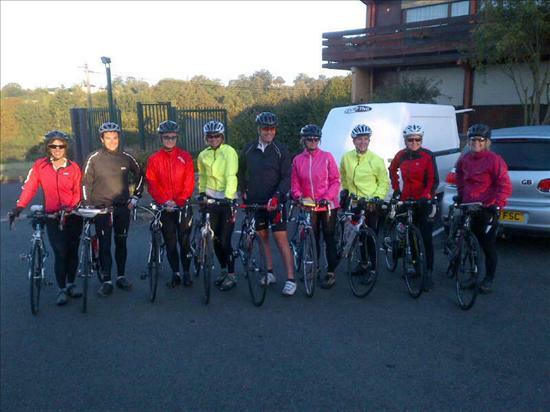 The Charity Cycle from Paris to Cornwall has finally arrived and today, Sunday 16th September, the team arrived at the Eiffel Tower to start this fantastic challenge. 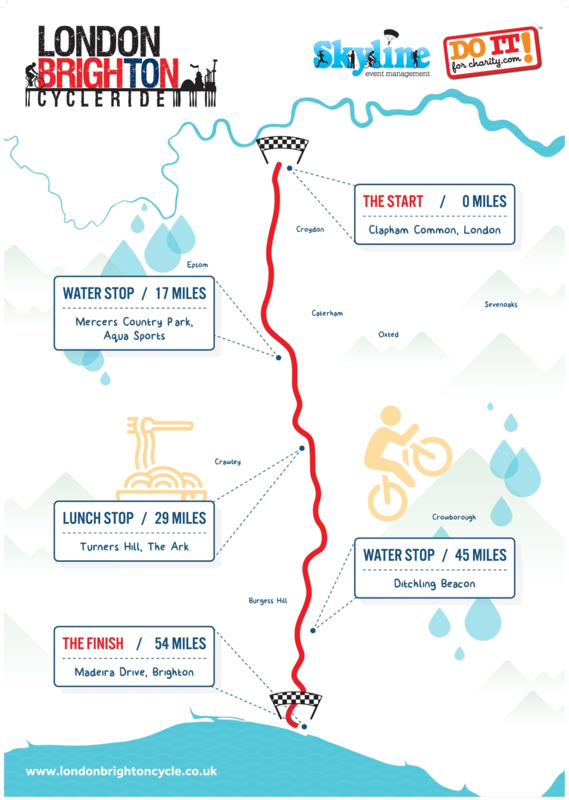 Their first full day of cycling starts tomorrow with a mammoth 85 miles to be covered, so we all wish them well and hope they make it all in one piece. 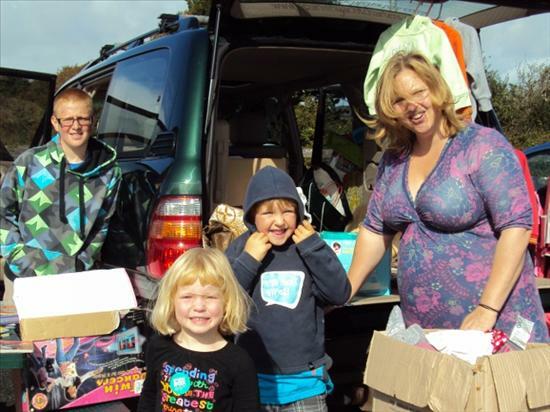 Donations have been flooding in thick and fast at the surgery and also on the online donation web site. 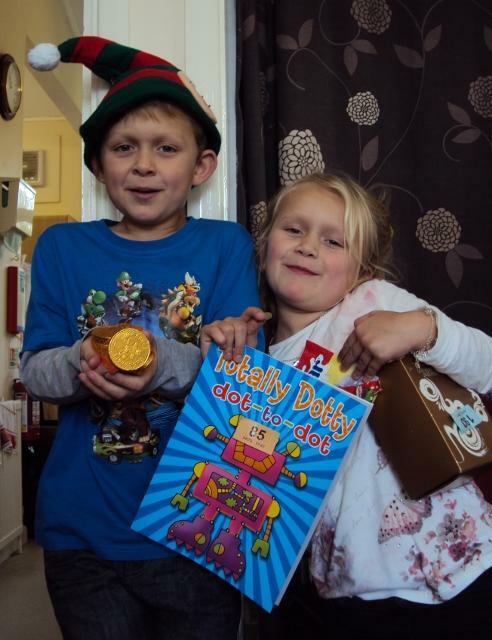 Any donation can help - £1.50 could pay for a set of colourful storybooks for a child under 10 but £250 could pay for a day’s professional training for two of CLIC’s care staff. Donate online at www.virginmoneygiving.com/carnondownssurgery or at the Surgery in the moneyboxes provided on reception. 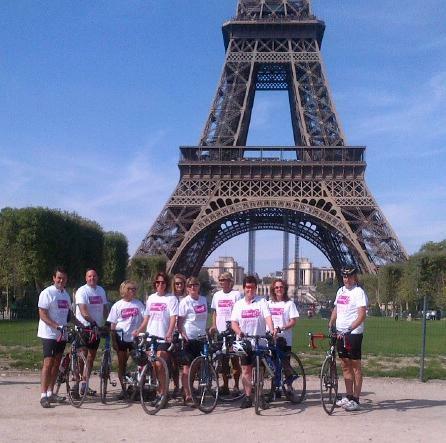 The whole team pictured in front of the Eiffel Tower at the start of the challenge. Our three girls still looking fighting fit ! 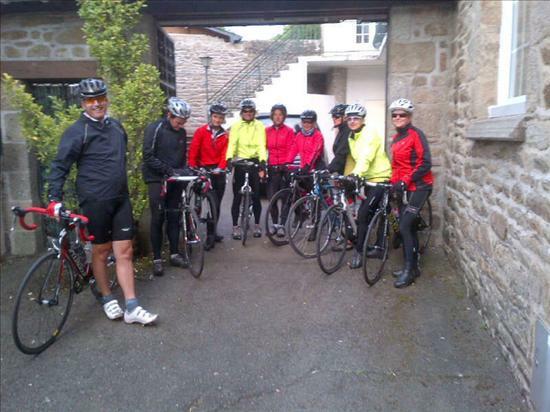 DAY FOUR - Another 65 miles today from Hede - nearly there ! If you think they have been amazing too please don't forget to donate online or down at the surgery. 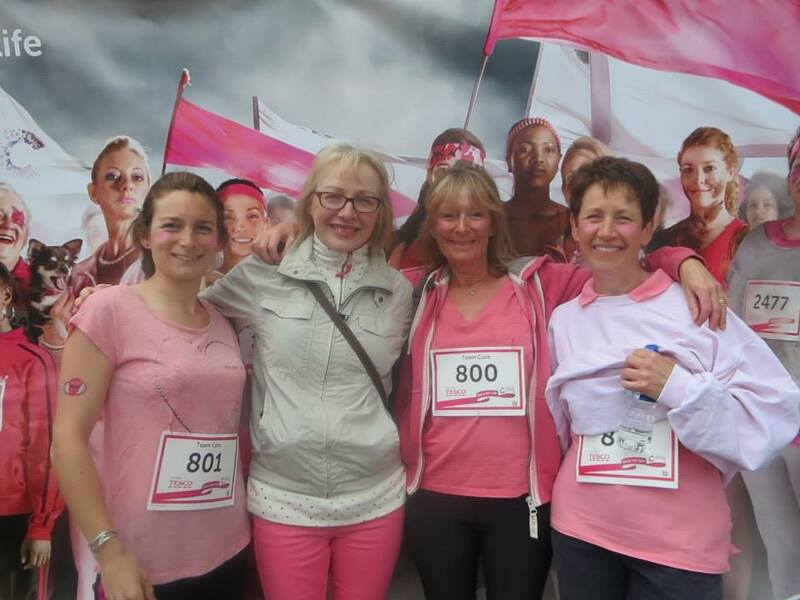 The target of £5000 is in our sights so help us raise so much needed money for CLIC Sargent. 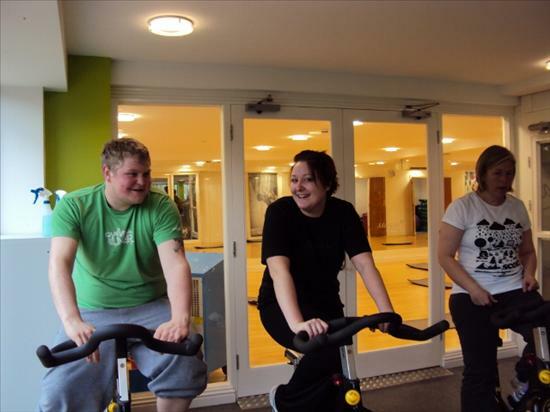 COUNTDOWN TO CHARITY CYCLE HAS STARTED! 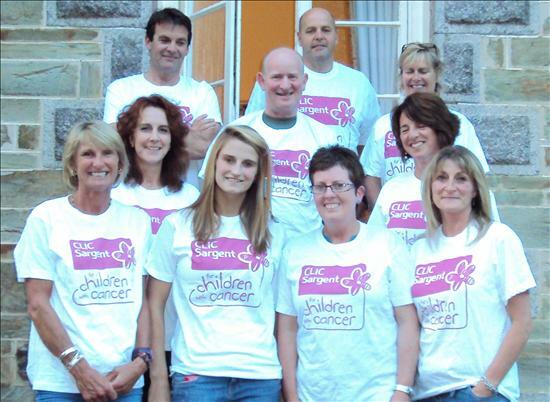 The Surgery has chosen CLIC Sargent to be our charity for 2012/13 which will be our most ambitious fund raising year yet. Dr Alison Flanagan and Asst. 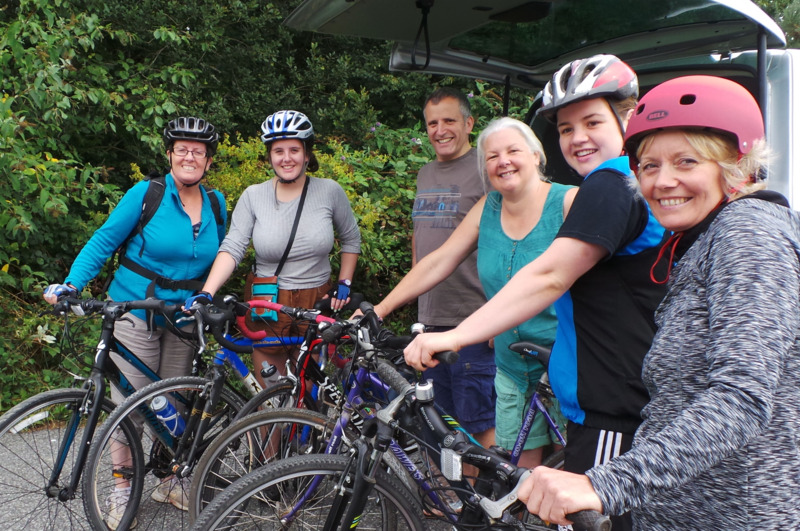 Practitioner Kathy James are keen cyclists and wanted a new challenge for this year; so along with our Charity Co-ordinator nurse Jackie Slater, they have arranged a cycle from Paris to Cornwall. 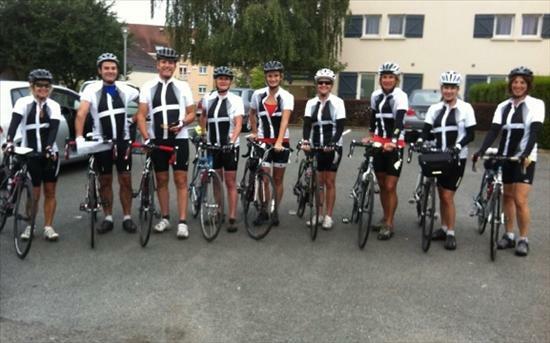 They will leave the French capital next to the Eiffel Tower on Sunday 16th September and aim to cover around 70 miles per day getting back to the Cornish border on Saturday 22nd September. The ladies are being joined by family and friends including Mr Phil Flanagan who is an ENT Consultant at RCH Treliske, Dr Linda Barry a GP from Truro, Mr Bill Barry a local Solicitor, Judy Baker a local Midwife, Anne Davidson from The Penisula Medical School, Conrad Capdevila from Cerner UK and ATS manager for Truro Mr Steve James. 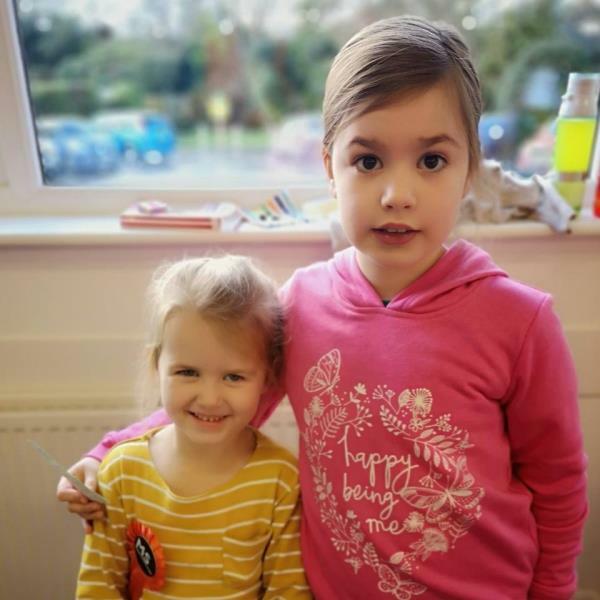 Please help us raise funds for this charity, which is very close to some staff members’ hearts because every day 10 children and young people in the UK hear the shocking news they have cancer. Treatment normally starts immediately, is often given many miles from home and can last up to three years. CLIC Sargent staff provide clinical, practical, financial and emotional support to help the young patients get the most out of life. They are there from diagnosis onwards and aim to help the whole family deal with the impact of cancer and its treatment, life after treatment and, in some cases, bereavement. 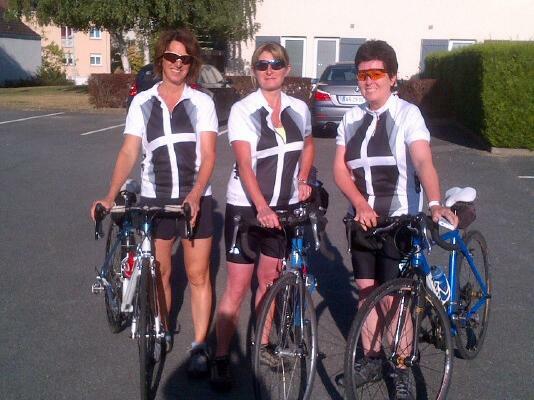 We wish all the girls together with their families and friends, lots of luck and stamina to keep pedalling all the way back to Cornwall. 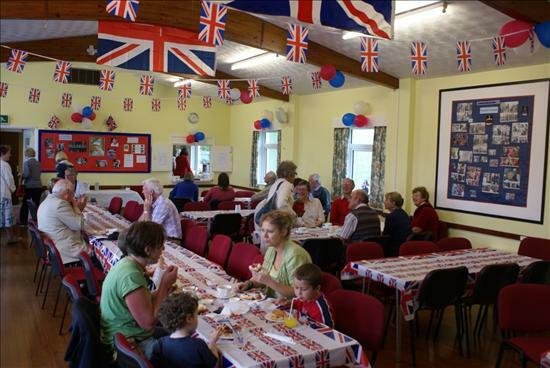 Saturday 2nd June saw a day of celebration at The Village Hall in Carnon Downs when the Village Hall Committee, the local Women's Institute and members of the Methodist Chapel came together to organise a special event to celebrate the Queens' Diamond Jubilee.They started the morning serving teas and coffees, lunchtime saw a light Ploughmans lunch consisiting of Coronation Chicken, Gammon Ham and Cheddar Cheese finishing the afternoon off with a proper Cornish Cream Tea. 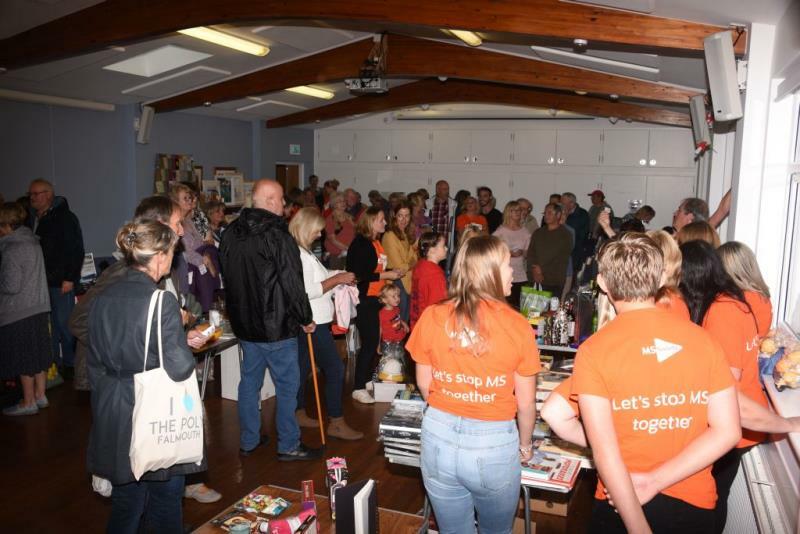 The fundraisers asked for a minimal charge and altogether the whole event raised a staggering £1350 which was shared equally between our surgery, The Stroke Appeal and Shelterbox. 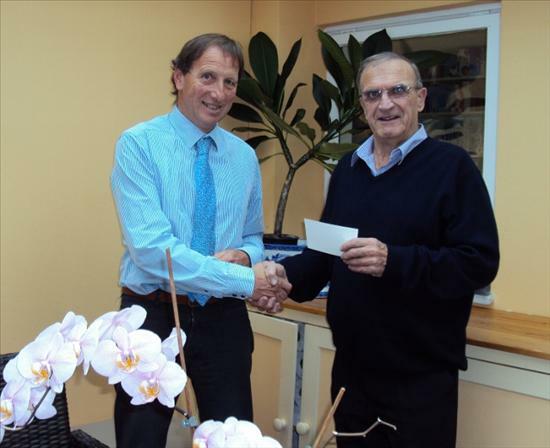 Mr Micheal Cottingham the Chairman of The Village Hall Committee came to the surgery on Thursday 21st June and presented our senior partner Dr David Maling with a cheque for £450. 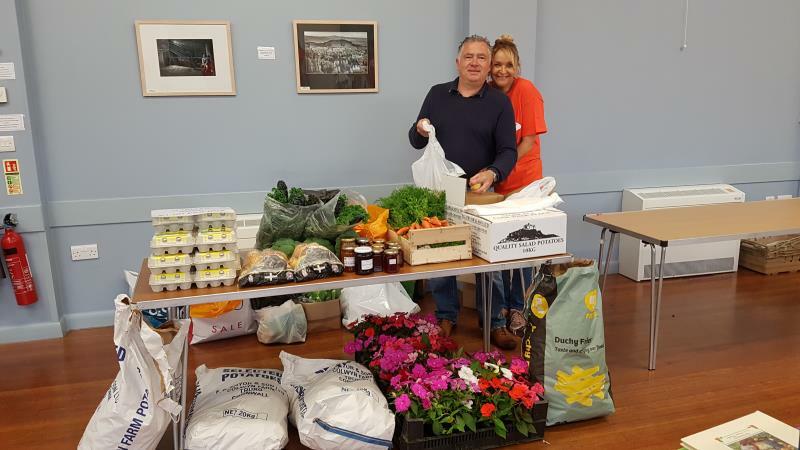 So thank you to all the villagers who attended the special event at the hall and thank you to all the committee members and organisations that made it so special by donating their time, their produce and their cooking skills. With all of your support we hope to purchase some new equipment that will be of benefit to all our patients. 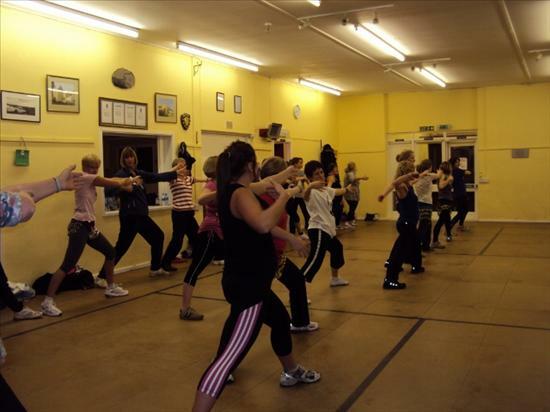 Below are some photos taken by Mr Roy McBryde at the Village Hall. 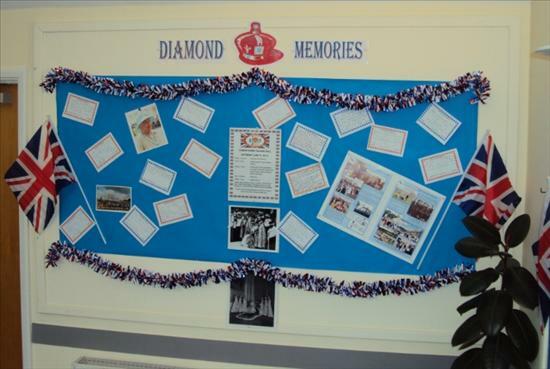 We would like to thank all the patients and staff that contributed their 'Diamond Memories' to our special Jubilee Noticeboard. 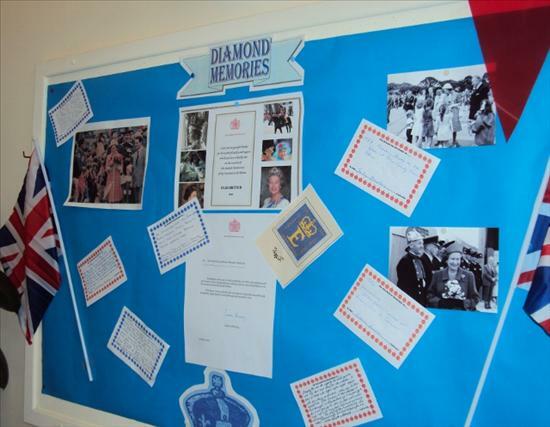 We had some lovely photos from the staff and the patients, along with a personal memory either about the Queen herself or a memory which was special to them during her reign. 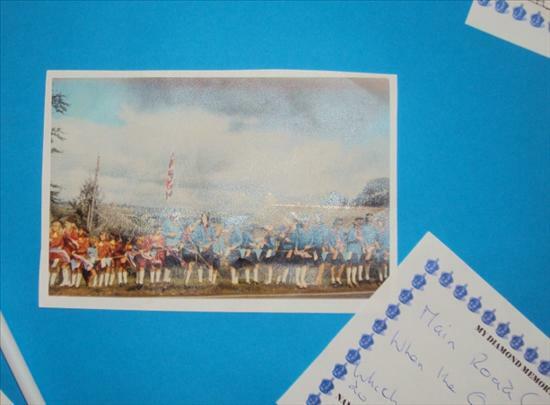 When Kay and Alison were putting all the photos and comments on the display Kay said when she saw one of the Brownies 'I wonder if there is anyone we know in that line-up of girls waiting along the road?' , not 10 minutes later our very own practice manager Sally came in to see how it was looking and promptly told us that Kathy and herself were in that photo! 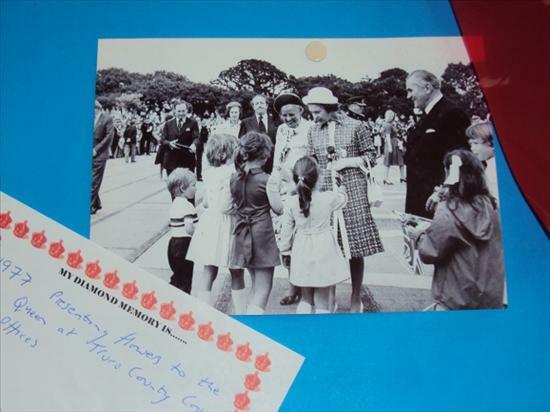 Becky (dark pinafore dress) is presenting the Queen with flowers and the Brownies waiting along with main road for the Queen to drive past in 1977. It is with great pleasure we can annouce that our very first Shelterbox has been deployed to Somalia. 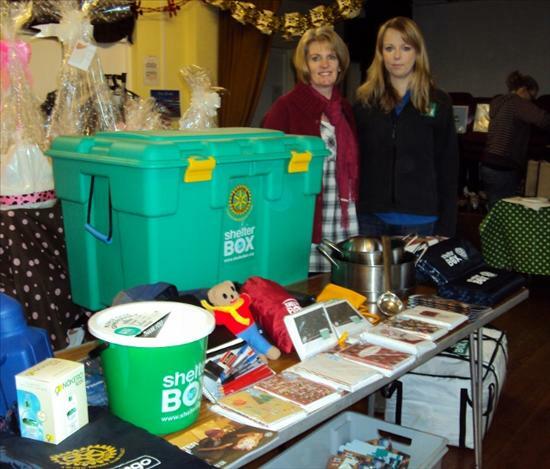 During our fund raising last year we managed to purchase four boxes and Shelterbox wrote to us on June 18th to inform us our first box had been sent and is using used to save people's lives so thank you to all who helped raise the money during 2011/12. 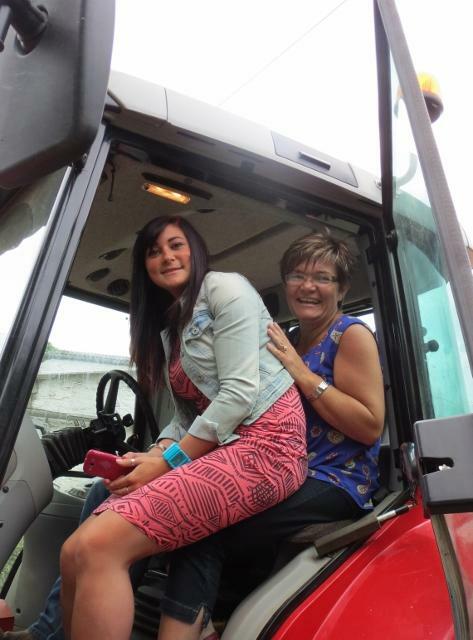 It was with great sadness that we all said 'Goodbye Sian' on Friday 18th May. 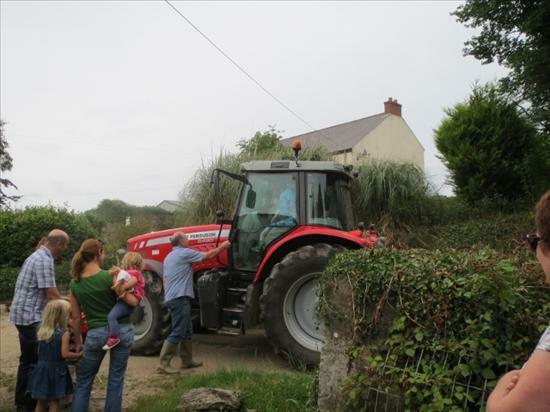 Sian is returning to her home land of Wales to be with her family and new grandchildren. 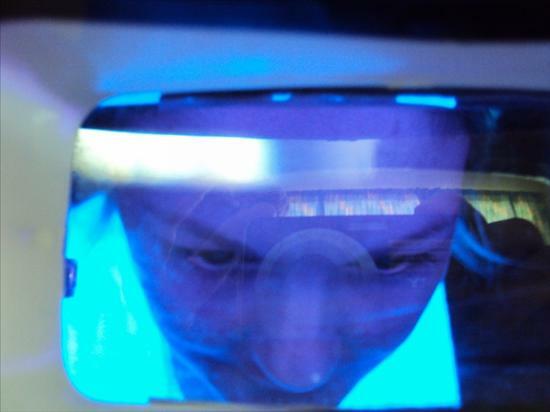 After three years of working here at the surgery primarily in Dispensary, although in the past few months she has worked on the front desk too, she and her partner are returning back to the valleys. 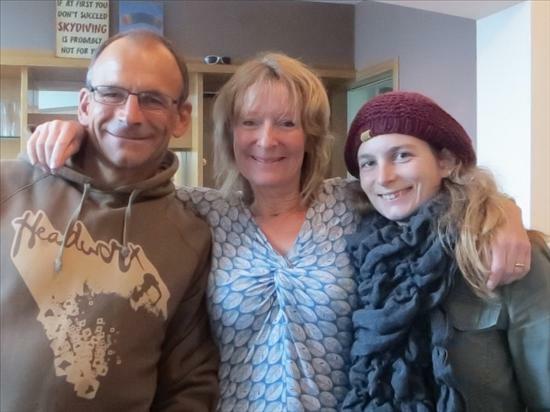 The doctors and Staff said a sad farewell on Friday and presented her with some Celtic jewellery made from Cornish tin to remember us by, along with some garden vouchers to kick start her favourite hobby when she settles into her new home. 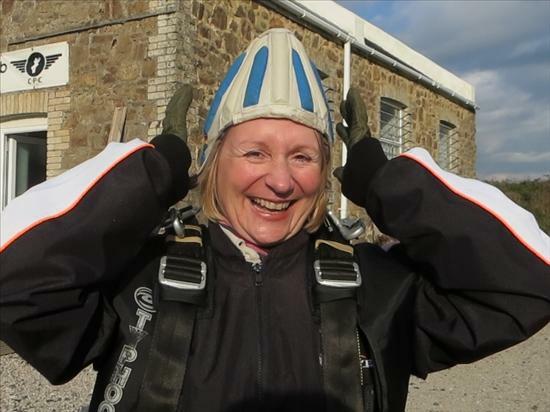 We are certain she will be checking into the web site to see what we have been up to and all us wish her the very best of luck for the future. 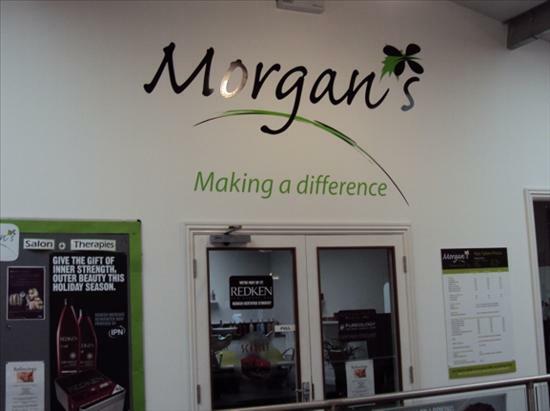 MOVE ON UP TO MORGAN'S ! 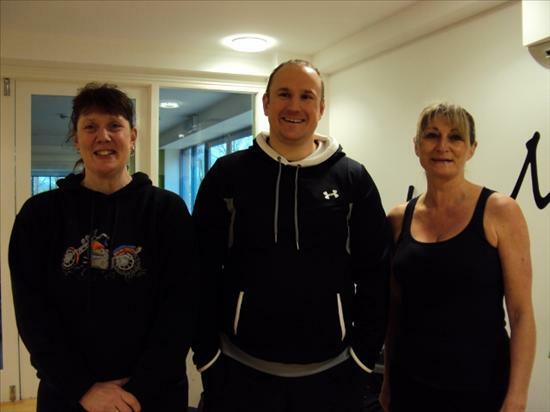 Sunday 29th April saw the early morning movers and shakers go to Morgan's Wellbeing Centre in Truro for a 'Gym Taster' session which had been organised by one of it's members Kathy James our very own Asst.Practitioner. We have signed up to the Healthy Workplace Scheme and all the members of staff are encouraged to introduce their favourite healthy pastimes to each other. 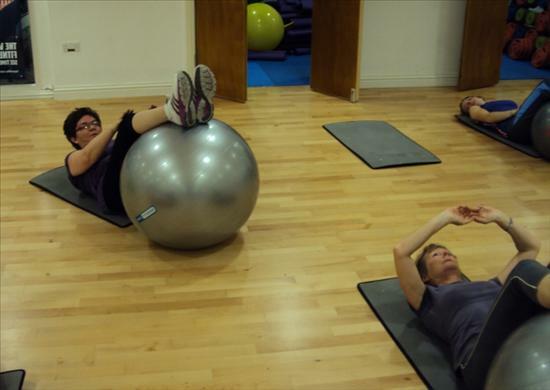 Kath is an avid and keen member of Morgan's and has finally got some of the staff, along with family and friends to participate in Body Pump, Spinning, Fit Ball and we finished with Pilates. 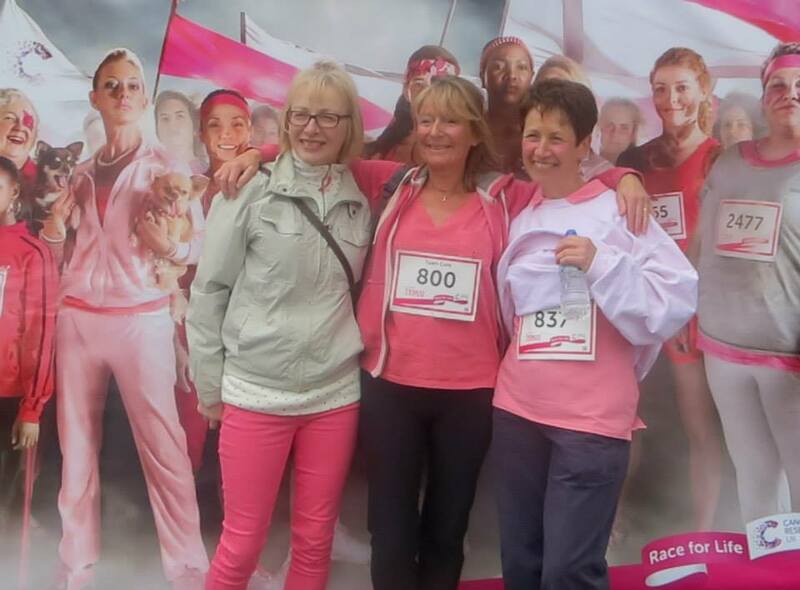 Each discipline was expertly demonstrated to the nervous pupils by Sara Spray and Laurence Belt who are pictured below with Kathy. They were great intructors making sure that we had the correct posture and positioning so that no injuries occured but they still managed to make it fun. 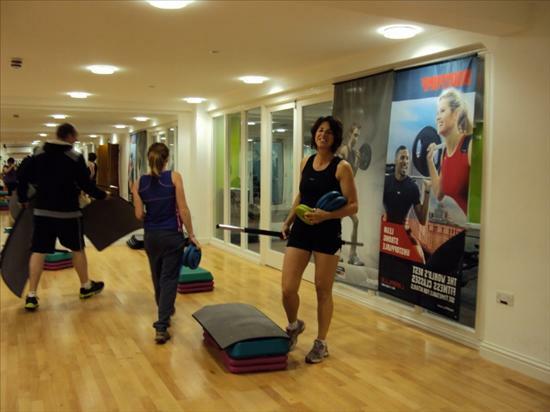 All of the programmes and many more are available at Morgan's and each one will help improve fitness, strength, mobility, tone, body shape and energy levels. 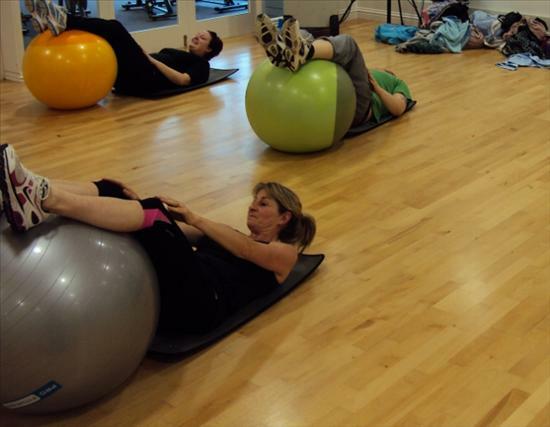 The next class was Spinning which is Kath's favourite! 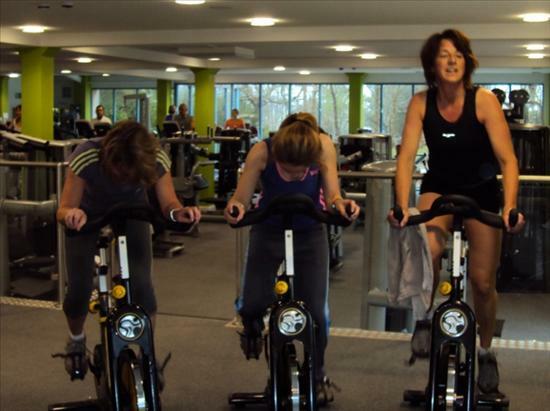 The photos really do not show you the speed and stamina that is required and you certainly build up a sweat. 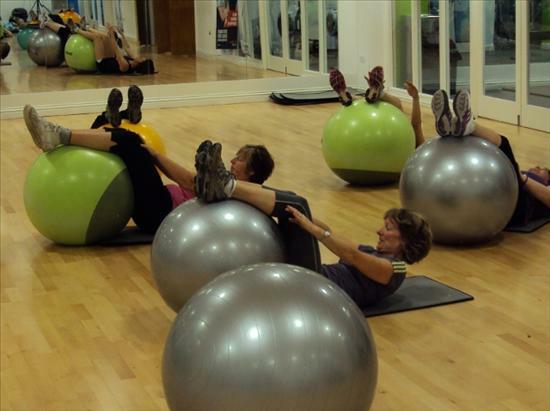 The last two classes certainly started the cool down, first came Fit Ball and then to stretch and relax all those muscles which had been worked so hard during the previous two hours a small taste of Pilates. 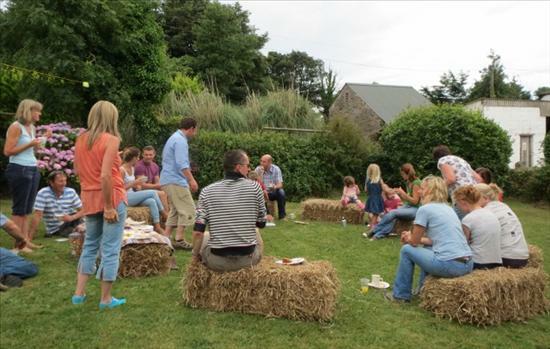 Many thanks to Kathy for organising the event and special thanks to Laurence and Sara and Morgan's of Truro. 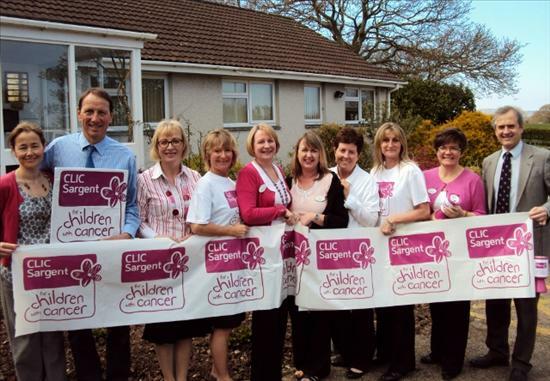 The doctors and staff are very pleased to announce that our chosen charity for 2012/13 will be CLIC Sargent. Every day, 10 children and young people in the UK hear the shocking news they have cancer. Treatment normally starts immediately, is often given many miles from home and can last for up to three years. Being diagnosed with cancer is a frightening experience and the emotional, practical and financial implications of treatment are intensely challenging for the whole family. CLIC Sargent is the UK’s leading cancer charity for children and young people, and their families. They provide clinical, practical, financial and emotional support to help them cope with cancer and get the most out of life. They are there from diagnosis onwards and aim to help the whole family deal with the impact of cancer and its treatment, life after treatment and, in some cases, bereavement. 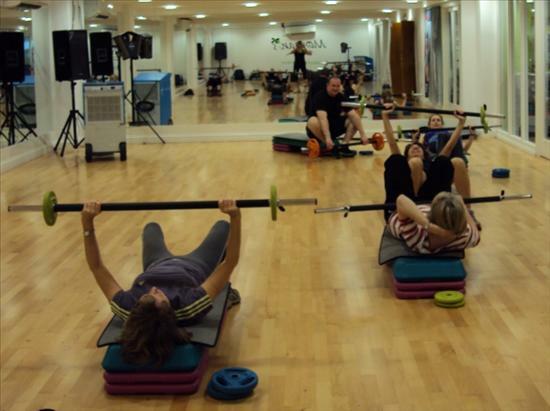 This year we are being very very ambitious and we aim to raise double the amount we achieved last year ! 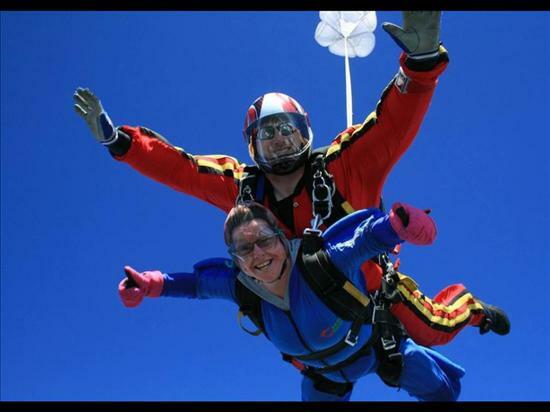 We have some great events planned and we hope that, as in years past, the patients, our families and friends will help us raise as much money as possible. 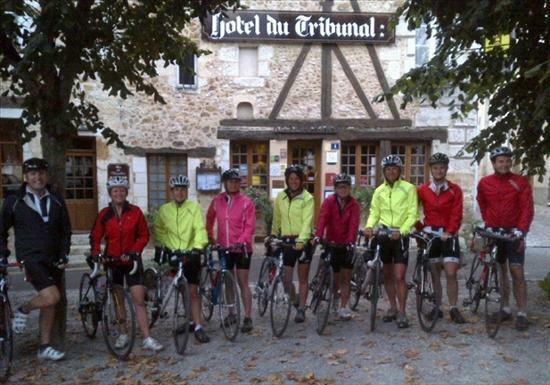 The big event planned is in September when Dr Flanagan, Dr Simpson, Kathy and Jackie along with some family members and friends will cycle from Paris to Roscoff, a journey of around 350 miles. With all the Diamond Jubilee Celebrations going on around the country we also thought we could raise some money and join in the celebrations - so please watch this space and keep an eye out in the surgery for posters and notices. Alison Sargent, a member of the CLIC Sargent team came to the surgery and gave a frank but informative talk all about the charity's work and their aims for the future. All of us who attended were extremely moved by the level of committment and care they provide to families struggling with the horrific news that their child has cancer. 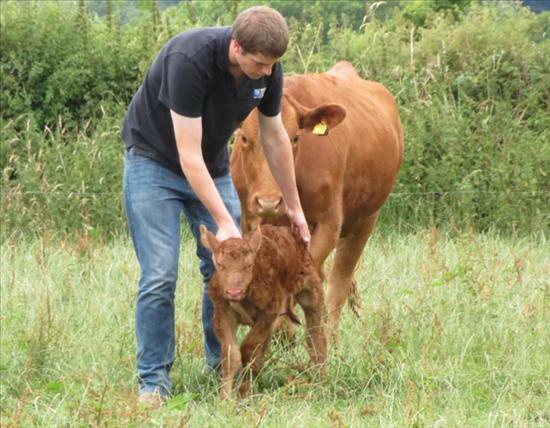 Please help us support this wonderful charity and help us achieve our ambitious target. This year we have a number of different ways to donate.We will have our reception Desk Money Boxes, you can donate by passing any money/cheques in envelopes addressed to CLIC for the attention of either Kathy or Mrs Rickard the practice manager, and for the first time we are opening an account online where you can donate from the comfort of your home computer, just click on the picture below to donate online. 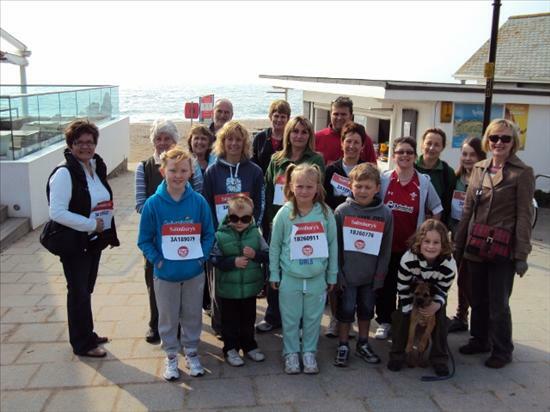 Some of the staff and their families decided this year to enter the Sport Relief Mile which was held in Falmouth on Sunday 25th March. 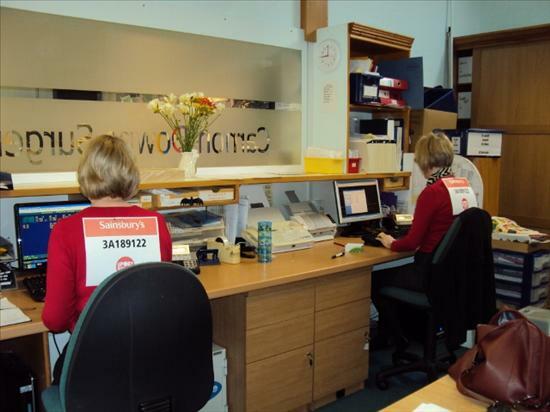 We placed a huge poster board in the waiting room and on Friday 23rd the staff on duty wore race numbers on their backs to raise awareness and raise some donations too! 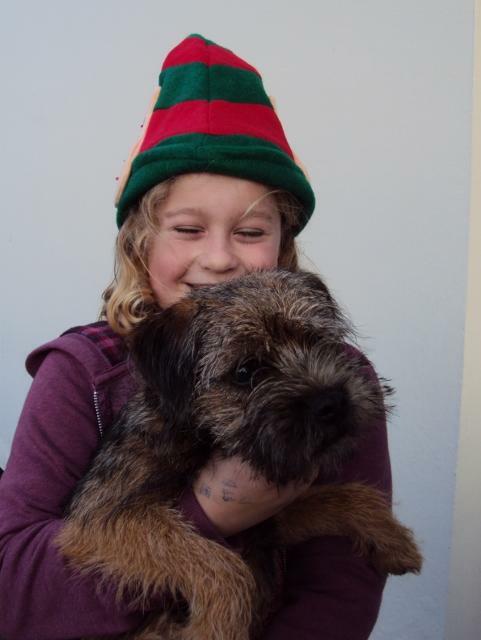 The patients as always did not let us down and we thank you all for donating - we have added all the monies together and we have raised just over a £160. 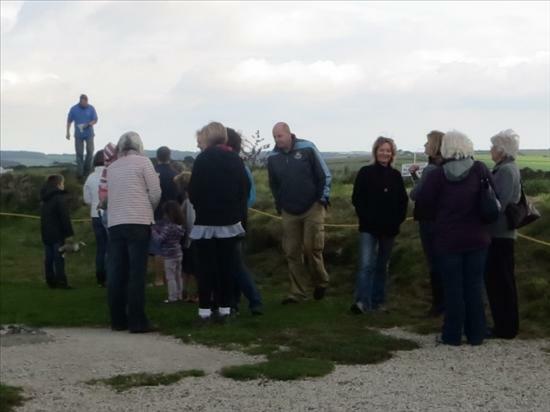 The weather was extremely kind to the walkers - the sun was shining but there was a brisk breeze keeping them all cool. The race organisers started the morning with a warm up to music to get their muscles ready for the morning's amble. We had decided collectively not to run and also not to do the One Mile but instead do the Three Mile Route. 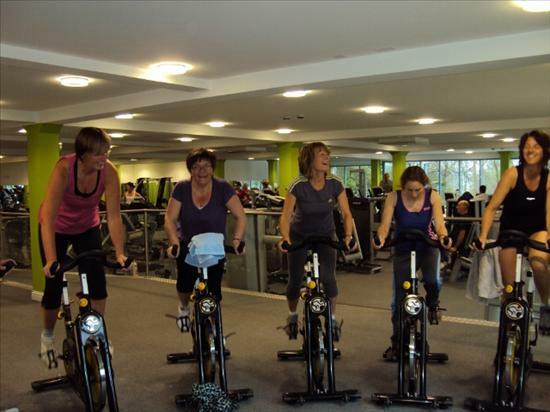 Sport Relief brings the entire nation together to get active, raise cash and change lives so this sits perfectly with our ethos and participation in Cornwall's Healthy Workplace Scheme. How does your money help ? The money you raise is spent by Comic Relief to help people living incredibly tough lives, both at home in the UK and across the world's poorest countries. It goes a long way too. From transforming the lives of people in the UK’s most disadvantaged communities, or those living with poor mental or physical health, to protecting street children and providing life-saving healthcare abroad. The total so far this year has already surpassed £52 Million. 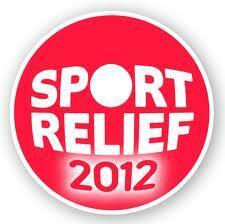 Click on the logo below to find out more details about Sport Relief and the work that they do. 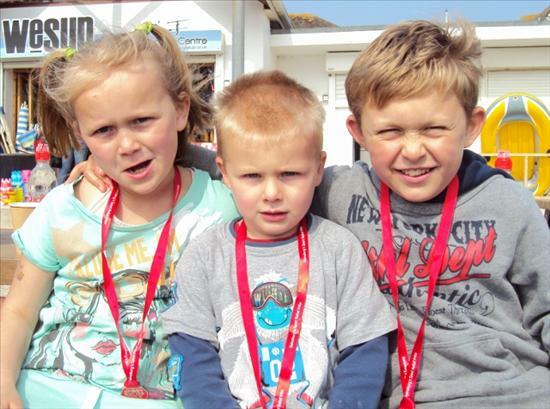 At the end of the race the staff and their families were presented with medals to commemorate their efforts and they all had a welcomed cup of coffee on the beautiful Gyllvanvase Beach and enjoyed the first rays of British Summertime! 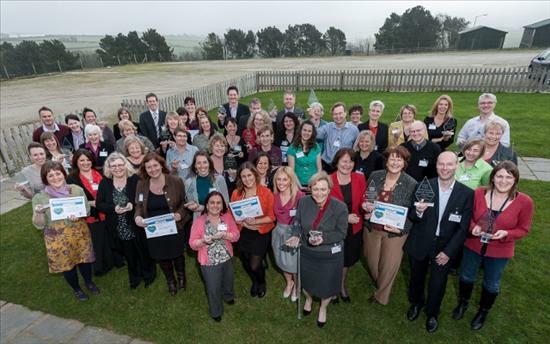 On Friday 3 March it was with great excitement that Dr Flanagan, Sally Rickard and Alison Hunt attended the 'Healthy Workplace' Award ceremony held at The Royal Cornwall Showground. The day started with practical ideas for us to implement here at the surgery and then the Director of Public Health, Felicity Owen, welcomed all the delegates and companies who were there to receive their awards. Dame Carol Black who is the Government Advisor for Health & Work then gave the keynote address which was followed by 'Five Minutes of Fame'. Six companies from the 154 registered within Cornwall were asked to present what their business had done during the past year to achieve their award, Carnon Downs Surgery were one of the invited guests to speak and Dr Flanagan introduced the surgery and then showed a film which Alison had compiled from all the events we had held throughout the year and also detailed all the implementations we have put in place to help keep our workforce happy and healthy ! Pictured below is Dame Carol Black presenting the Silver Award to Sally Rickard our practice manager who received it on behalf of all of the staff. 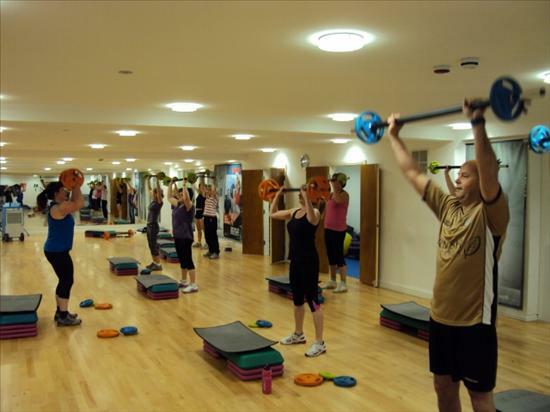 We will continue to strive for a healthier and happier workplace and hopefully during 2012 work towards the Gold Award. 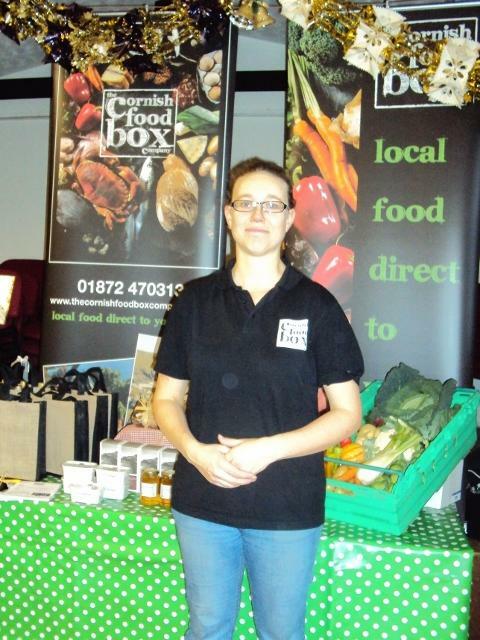 Below are some photos of the event; including Cornwall Council who were informing us about the new National Food Hygiene Rating System, Tracey Barter and her colleague from the Health Promotion Service who were demonstrating prevention and care of our backs along with other businesses who were promoting good health in the workplace. 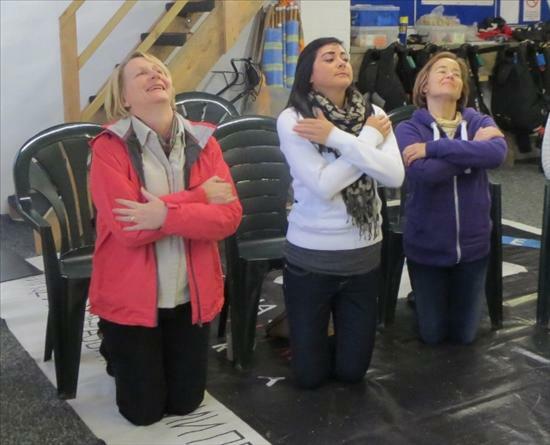 During our last staff training session the staff had a talk about Sun Safety. Cornwall has one of the highest rates of skin cancer in the UK and as part of the Healthy Workplace Scheme, Caroline Chapman came and spoke to us all about the precautions we should be taking in the sun, especially during the peak times of between 11am and 3pm. 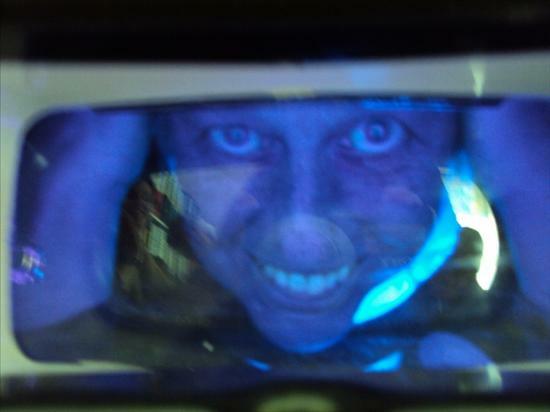 She then demonstrated to us how much damage we had already done to our skin by looking at our faces through a special UV Light box, all the staff had a go and many of us looked like a Violet Beauregarde from Willy Wonka and The Chocolate Factory - we had all turned blue! She assured us this was normal but what we could see was the damaged areas and where we should take extra care during the sunny weather. 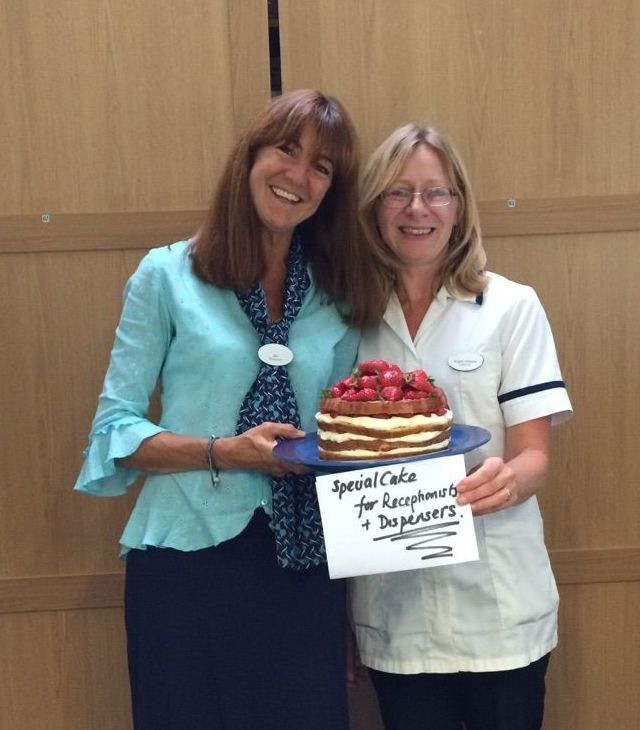 Rachael and Judy our nurses have given us permission to show you their results below. Rachael before she goes into the box ! 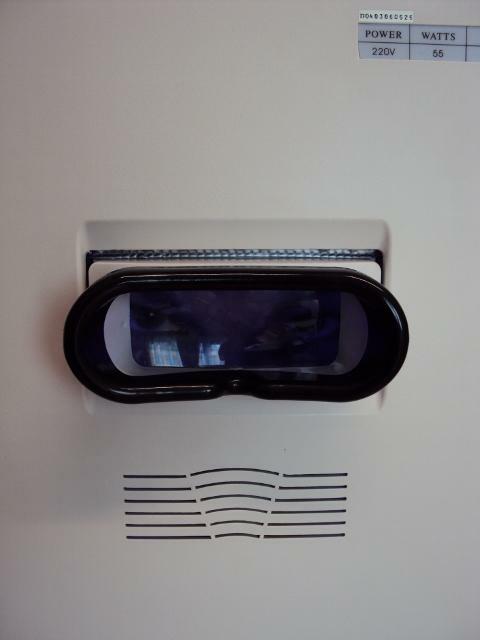 The black eye piece is what the clinican looks through and the patient can look in a mirror inside the box so we can see the same thing. Rachael is below on the left and Judy is on the right. For lots more information on being safe in the sun click on the logo below. 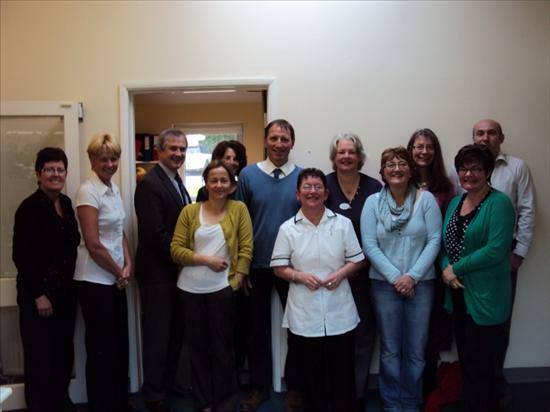 In early 2011 the doctors and Staff signed up to the Healthy Workplace Award Scheme which is a county standard of good practice and quality mark of health and wellbeing in the workplace, supported by The Health Promotion Department of Cornwall & Isles of Scilly. The doctors and Staff are very pleased to announce we have been awarded the Bronze and more recently the Silver Award, and we are actively 'Going for Gold'. 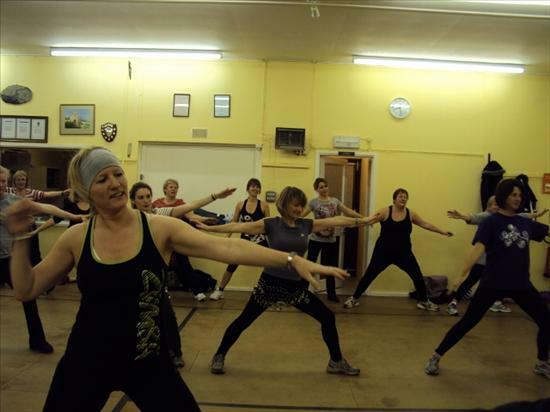 One recent event held at the hall in Feock was a 'Zumba' Night where the ladies had an evening of instruction from Helen Tite who owns the Core Health Club in Falmouth. 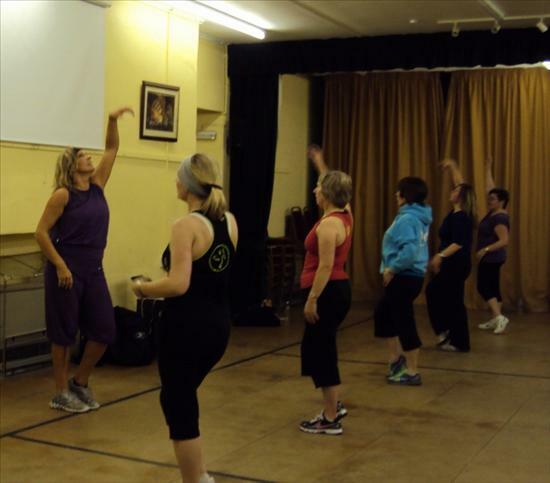 The evening was an introduction into the benefits of Zumba which is a Latin dance based interval training for all abilities, ages and sexes. 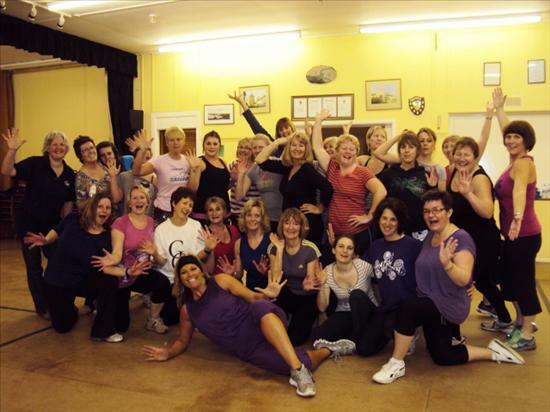 Helen has been teaching Zumba since it was introduced to the UK in 2007 and she quotes "You will never laugh and have so much pleasure in an exercise class". 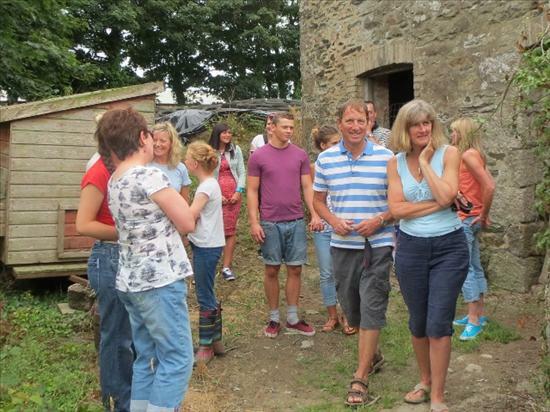 Alison Hunt organised the event as she has been attending Helen's class in Penryn and we also invited friends and family along with some colleagues from the Trauma Unit at RCH Treliske. As you can see from the photos below Helen certainly worked us hard and the evening was a great success, hopefully encouraging more of us to try something new. 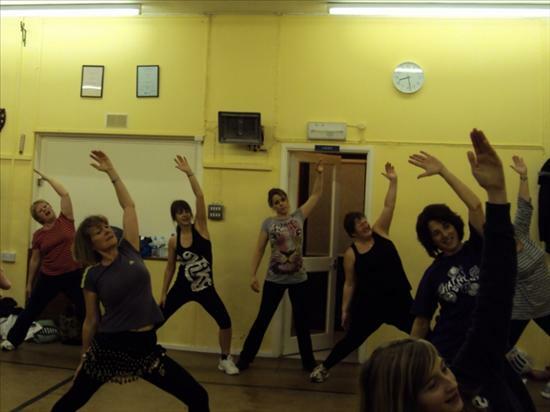 The are lots of Zumba classes available in and around the area so go on give it a go! 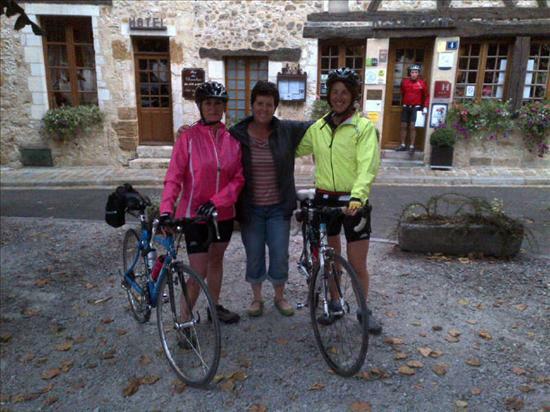 HERE ARE THE GIRLS AFTER HELEN HAD FINISHED WITH US ! 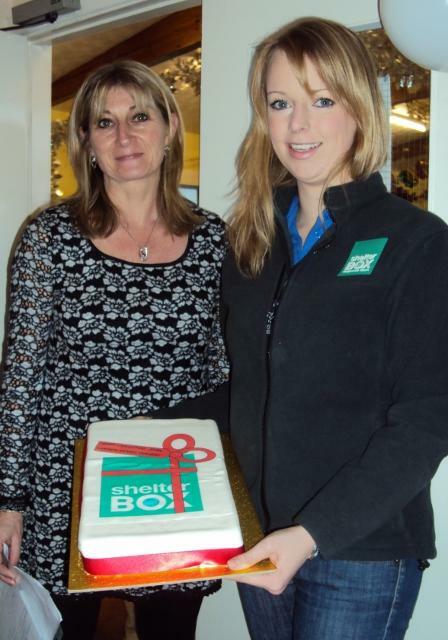 WHAT A LOVELY CHRISTMAS PRESENT YOU BOUGHT FOR US - A GREAT BIG GREEN SHELTERBOX ! 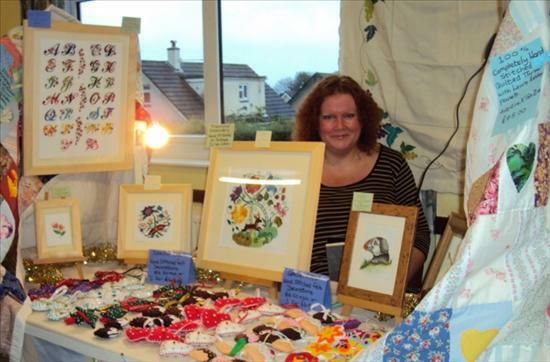 Saturday 3rd December saw our very first Christmas Craft Fayre at Carnon Downs Village Hall. 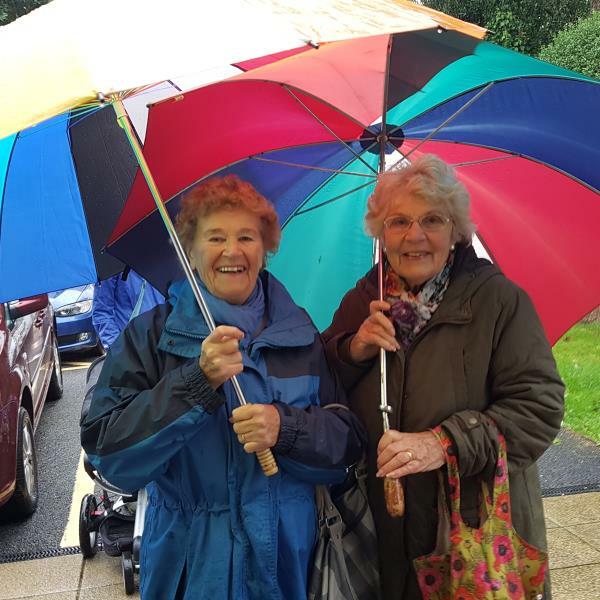 We thought that rain would stop play but the sun came out and so did all of our patients, they certainly helped boost our fund raising for 2011 with a wonderful total of £825 so far. This equates to another full ShelterBox, with funds left over, so now we will have 4 ShelterBoxes and hopefully more to come. So a VERY BIG THANK YOU to everyone who attended. 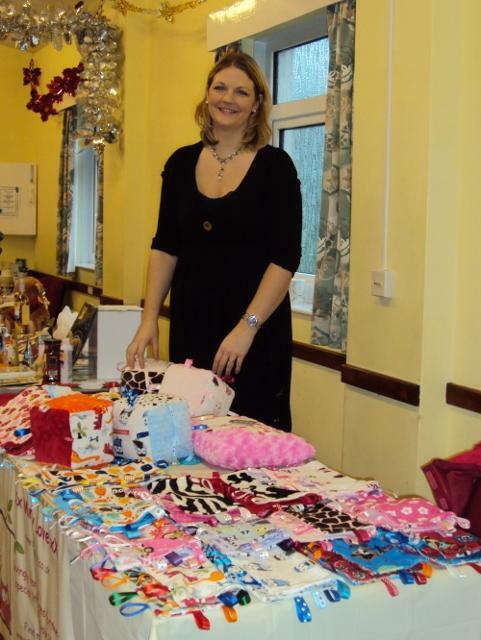 The surgery would also like to say another BIG THANK YOU to Kathy James who spent many hours organising this event with the help of her committee and the wonderful help and time given by all the girls from the surgery on the day. 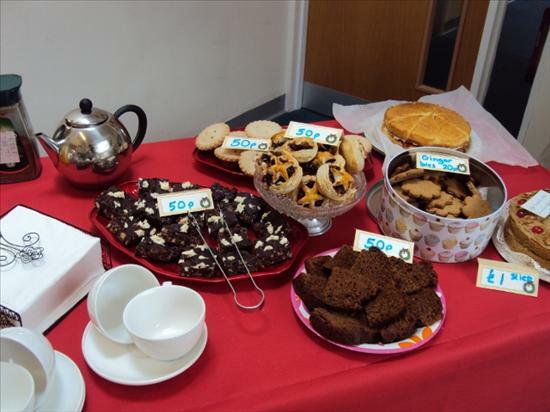 The staff all made wonderful cakes, mince pies, peppermint creams, all butter shortbreads, welsh cakes and chocolate dipped candied citrus peel which were sold at the fayre. 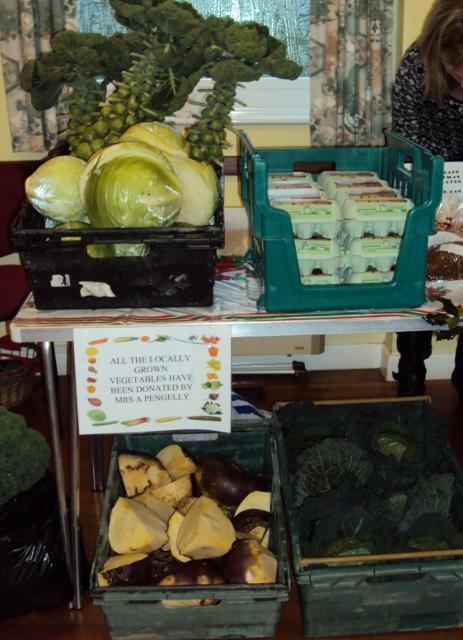 Mrs Pengelly donated some fresh locally grown vegetables for us to sell and the Carter family donated dozens of eggs. 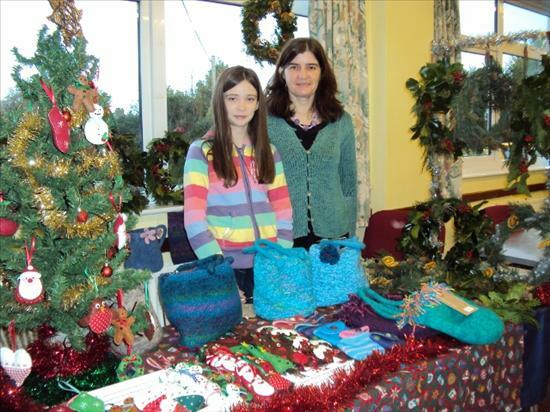 Thank you also to the Rippon family for baking some tasty Cornish Pasties which filled the hall with a great aroma making all our tummies rumble, some of the proceeds went into our fund too.We also held the ever popular tombola which was packed full with great gifts and goods given to us by patients and staff. 'Guess the Calories' of the large iced cake kept you guessing all morning ! In fact the total calories of the cake was 9680 - which hopefully the winner won't eat all on their own. 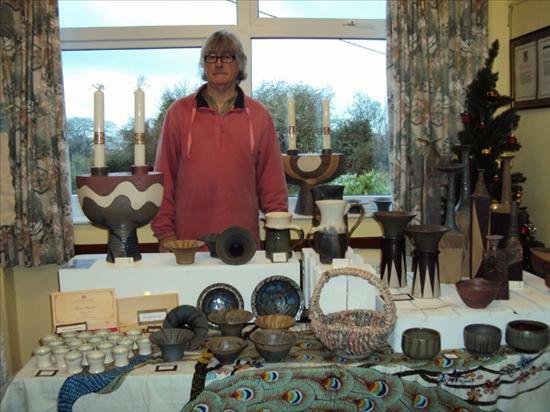 We would also like to thank the various stall holders for paying for their table tops and all of the proceeds went into our fund - a great selection of crafts and local goods made or produced within Cornwall. 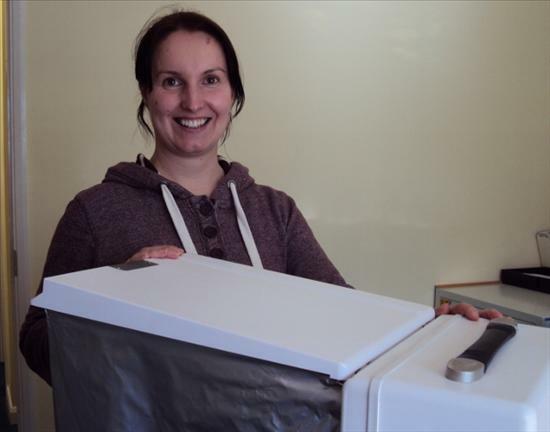 You may have read about Alice Jefferson (pictured above ) who we wrote about earlier in the year who was in Africa for her birthday volunteering for ShelterBox. Today she attended with her mother and another colleague along with an actual box for us to see how much they pack into them and news about the charity - these boxes really can save people's lives so please keep helping us raise as much money as we can for this great locally based charity ShelterBox. 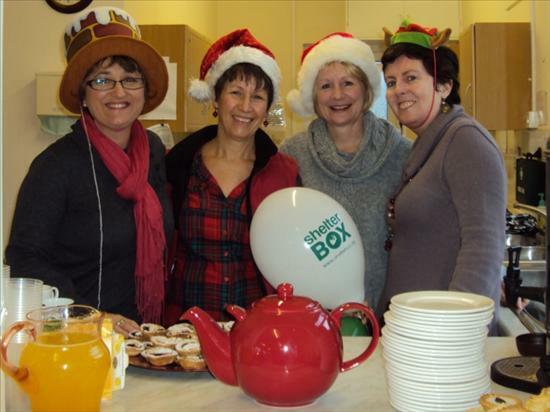 All the ladies enjoying a cup of tea and a mince pie ! 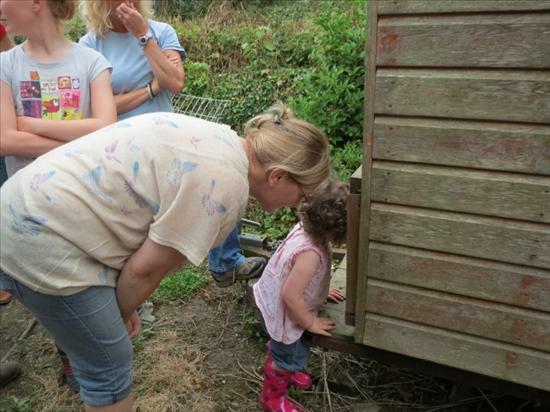 With all the funds we have raised since April we have managed to purchase 2 full and one half ShelterBoxes so far ! Click on the link below to TRACK them and see where your generous donations are helping in the world. PINK TO MAKE THE BOYS WINK ! 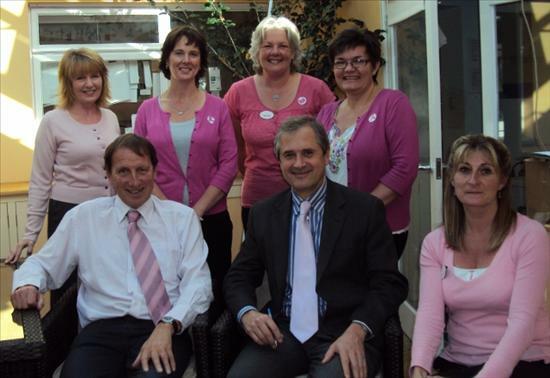 The staff once again supported the Breast Cancer Awareness Day on Friday 28th Oct.
What is wear it pink day? Where do wear it pink donations go? Breast Cancer Campaign uses all wear it pink donations to fund innovative, world-class research throughout the UK and Ireland to understand how breast cancer develops, leading to improved diagnosis, treatment, prevention and cure. 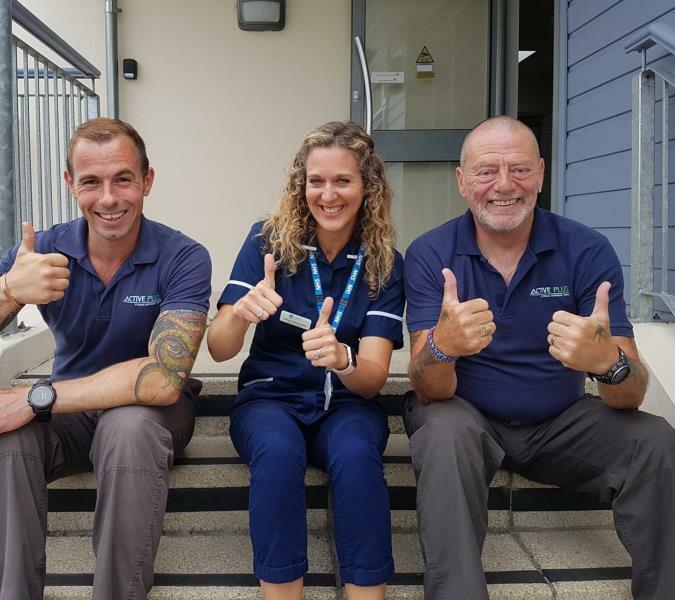 "READ ALL ABOUT IT, READ ALL ABOUT IT"
This week in the West Briton it was reported that we were the first surgery in Cornwall to be awarded the Bronze Healthy Workplace Award - WELL DONE EVERYONE !
' A doctor's surgery at Carnon Downs has become the first practice in the county to achieve a Healthy Workplace Award for its commitment to promoting the health and wellbeing of its employees. Dr Maling and Partners has achieved bronze level award for engaging with staff and taking on board their ideas. 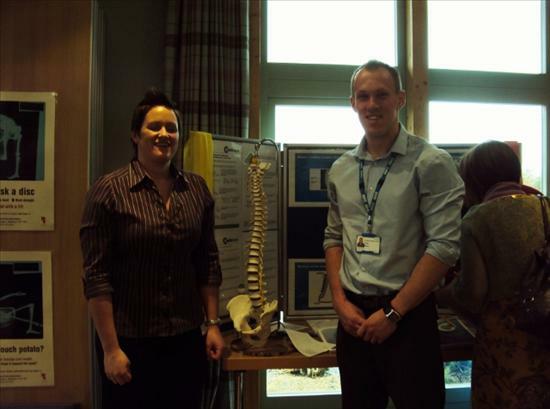 The benefits offered to staff in the past nine months include support from an in-house physiotherapist for back problems, help to stop smoking, opportunities to take part in physical and social activities organised by the practice and the chance to purchase a bike through the Cycle to Work Scheme which the practice has signed up to. 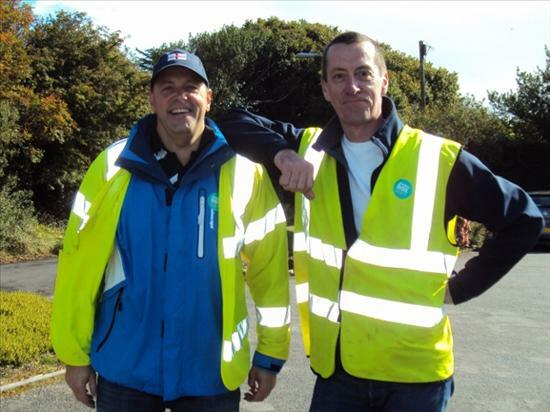 The award scheme is run by NHS Cornwall & Isles of Scilly's Health Promotion Service, which focuses on improving the health and wellbeing of local people. 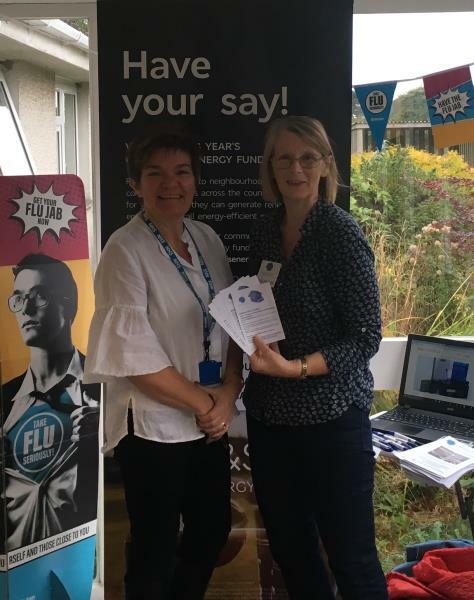 Rachel Faulkner, workplace health co-ordinator, said "It is fantastic to see Carnon Downs Surgery taking health and wellbeing of its staff so seriously and really embedding it within the practice. 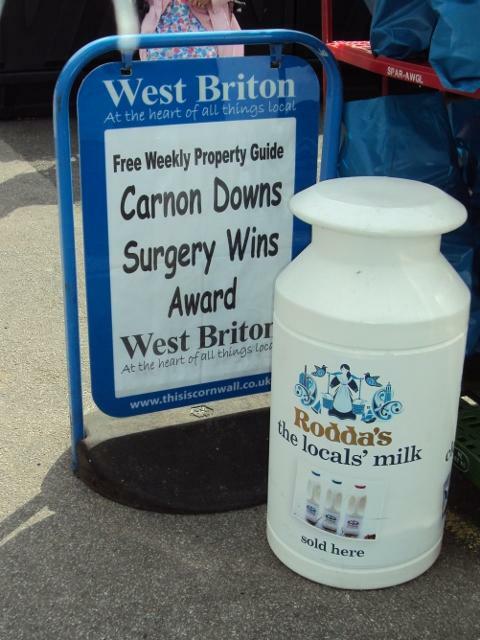 Other businesses and GP surgeries may wish to follow suit; they too could start to reap the rewards of improving the health and wellbeing of the staff"
What a nice surprise the staff had, outside the local village shop was a billboard for the West Briton telling everyone about the award. So once again WELL DONE TO ONE AND ALL ! 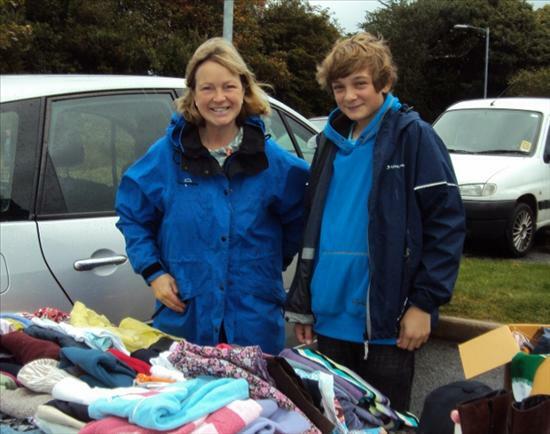 IT WAS SUNSHINE AND SHOWERS BUT THE DONATIONS POURED IN ! 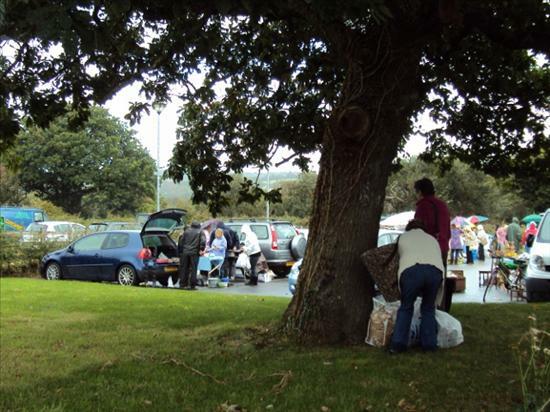 Saturday 17th September saw the first Charity Car Boot Sale to be held at the surgery in aid of ShelterBox our chosen charity for 2011. Once again our patients arrived in droves to support this worthwhile cause and the whole event raised an enormous amount of money. 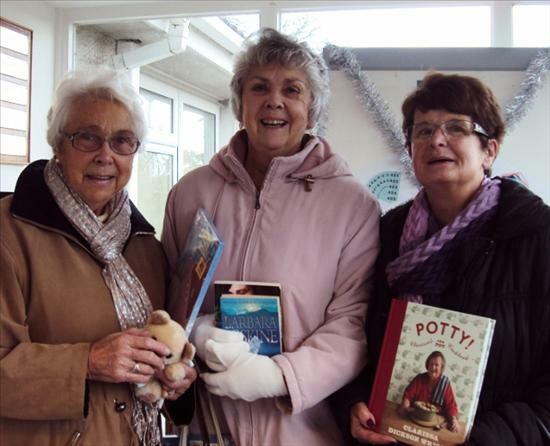 Staff and patients donated bric a brac and books for the staff stalls, while other patients and local businesses donated gifts for the raffle and tombola. 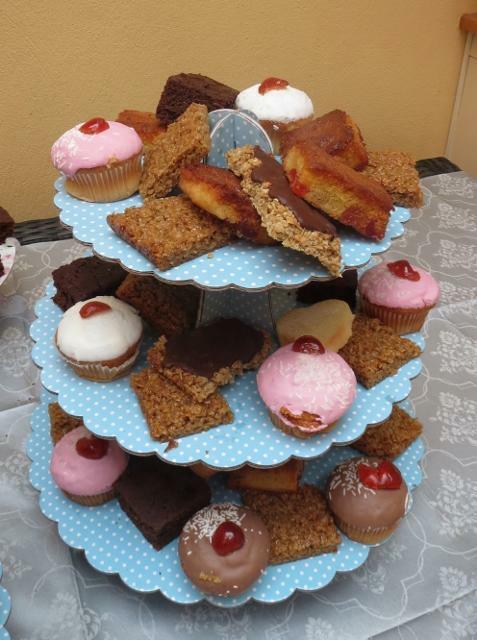 The refreshment table was laden with homemade cakes and the tea urn was extremely busy when the heavens opened ! So thank you one and all for the marvellous turnout. Special thanks to Jackie Slater and Kathy James for the hours of work it took to organise the event and to the staff and their relatives who helped on the day. 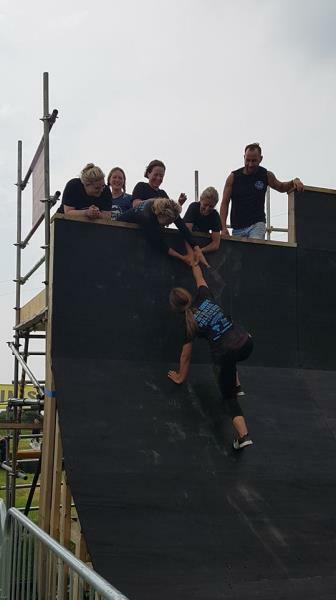 We hope to have a final total soon but with donations given to us prior to the event from patients who could not attend and with the tremendous support from you all on the day we have far surpassed what we imagined we could achieve so THANK YOU. Above are the sellers who braved the showers and generously bought a pitch - we couldn't have done it without you ! 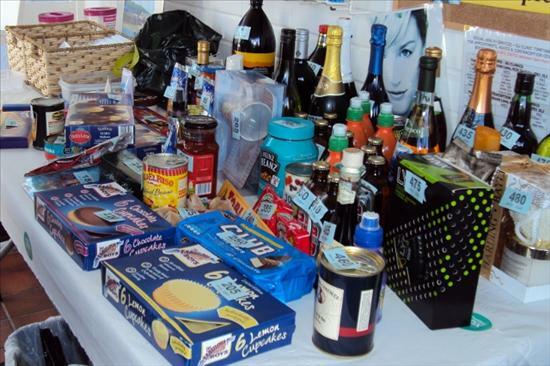 The Raffle, Tombola & Refreshment Tables laden with all our donations. 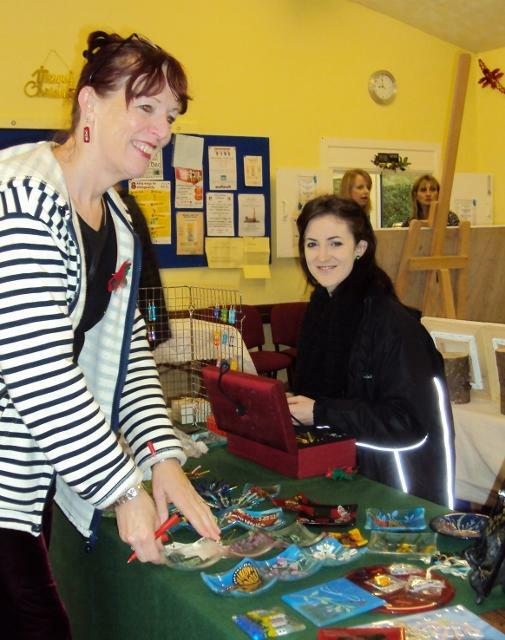 Staff and relatives manning the stalls and looking after the parking. 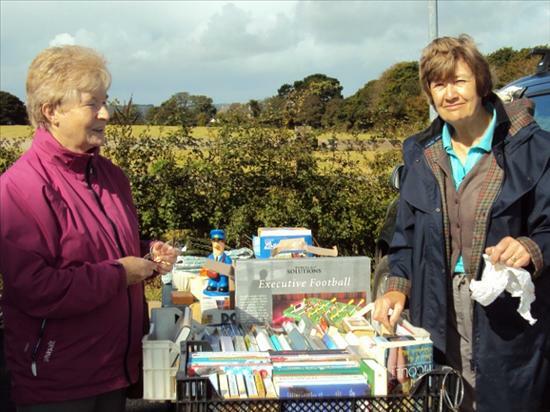 Generous visitors buying books and having a cup of tea all in aid of ShelterBox. 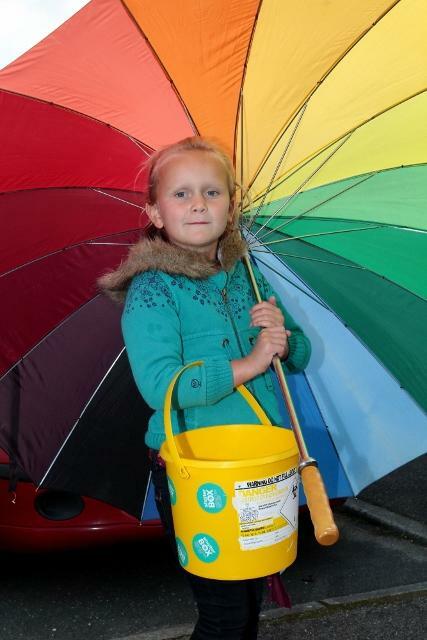 The weather put some off attending but thank you to those who dodged the showers. 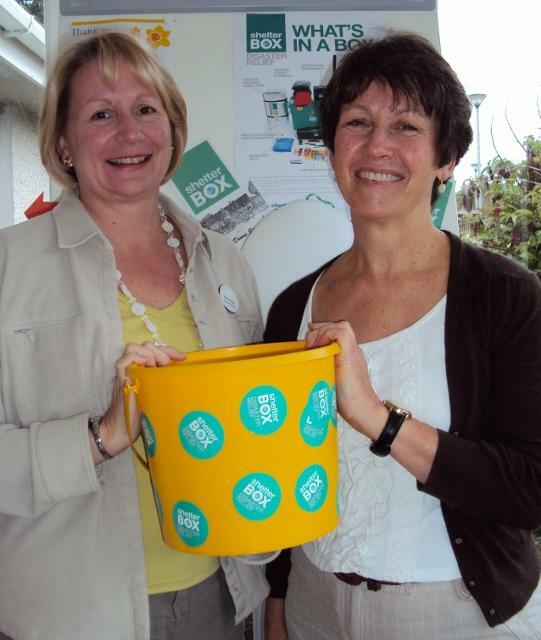 Karen, Margaret and Molly-May have Buckets at the Ready ! Local girl Alice Jefferson spent her 22nd birthday in the world's largest refugee camp in Dadaab, Kenya. 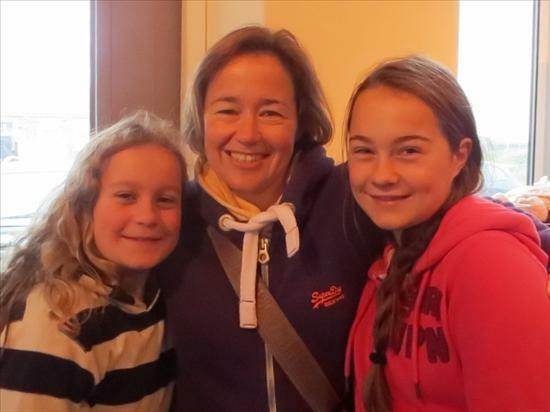 Alice's mother contacted the surgery as Shelterbox is our chosen charity for 2011 and she wanted us to know about Alice's expedition and how important ShelterBox is to people all over the world. 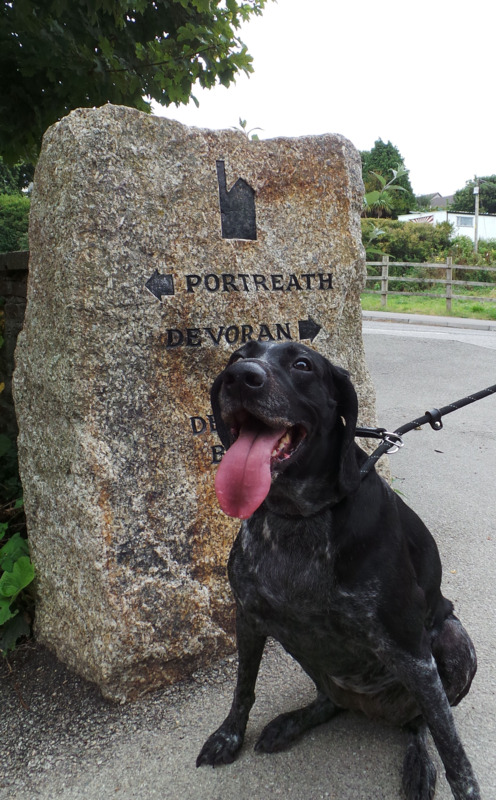 Alice is a member of SRT (ShelterBox Response Team) and has sent daily reports which can be found on their website. Click on the link below to hear her diary and see what ShelterBox has been doing as they have recently increased their efforts to protect families lives as the crisis in East Africa continues. 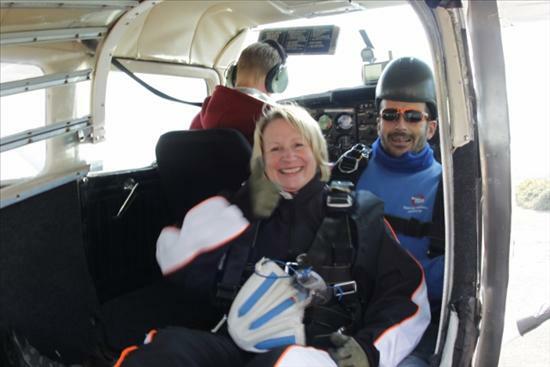 We send Alice our best wishes and while we continue to support such a worthwhile charity. 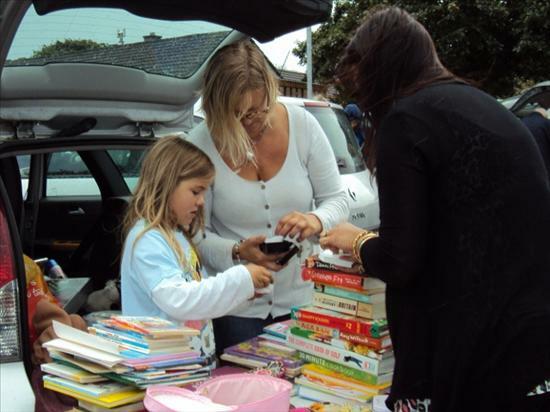 Don't forget to visit our Charity Car Boot Sale on Saturday 17th September from 12 noon here at the surgery. 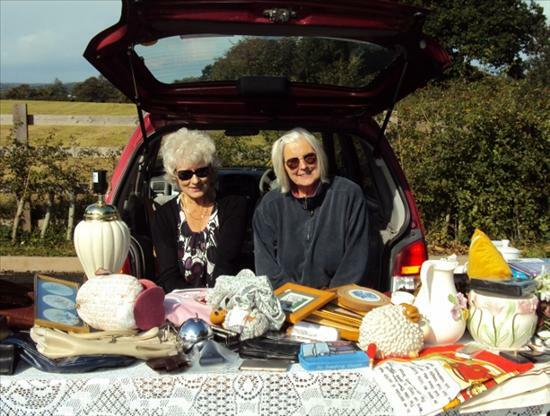 We have collection tins on the front reception desk or if you wish to reserve a pitch for the car boot sale please come in and ask for more details as we have very limited space available.